1 In loving memory of William Adams, died 27th Dec. 1958, aged 74 years. 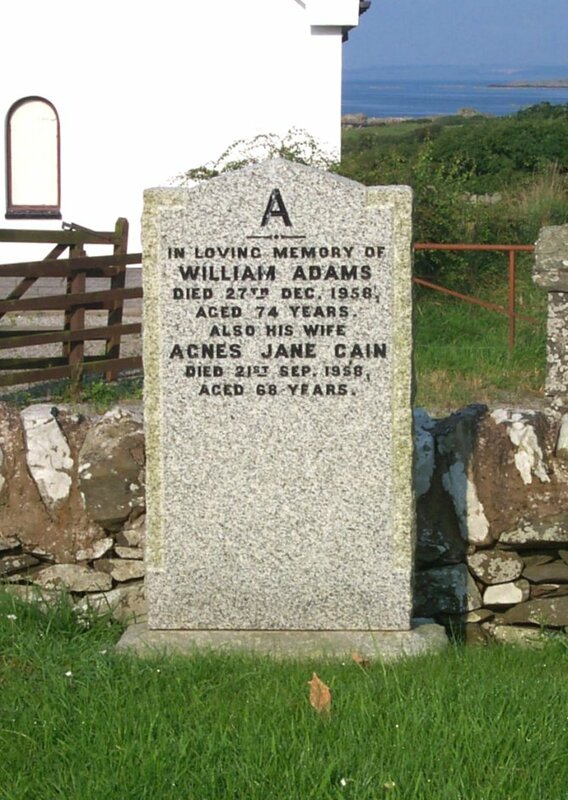 Also his wife Agnes Jane Cain, died 21st Sep. 1958, aged 68 years. 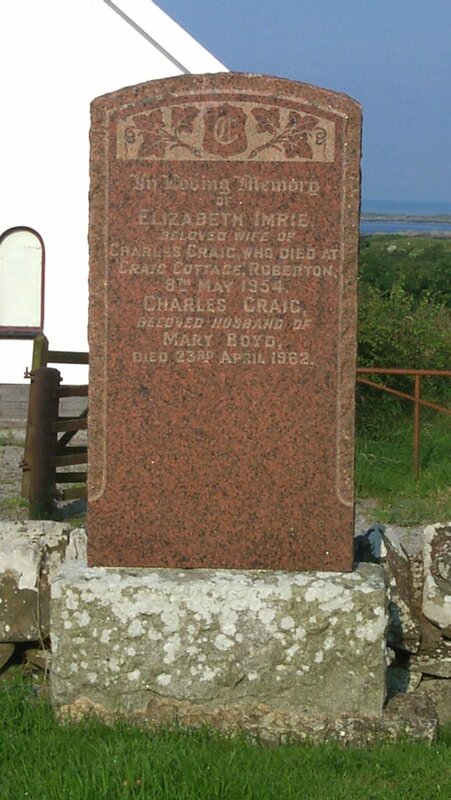 2 In loving memory of Elizabeth Imrie, beloved wife of Charles Craig, who died at Craig Cottage, Roberton, 8th May 1954. Charles Craig, beloved husband of Mary Boyd, died 23rd April 1962. 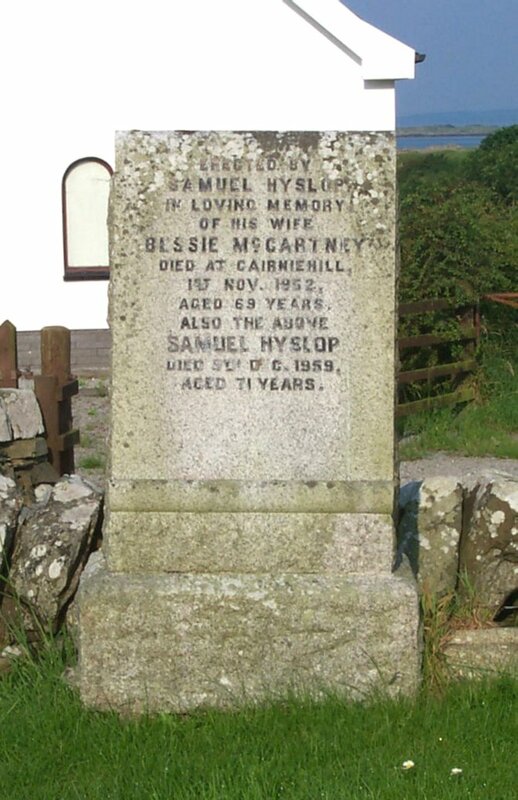 3 Erected by Samuel Hyslop, in loving memory of his wife Bessie McCartney, died at Cairniehill. 1st Nov 1952, aged 69 years. Also the above Samuel Hyslop, died 9th Dec. 1959, aged 71 years. 4 In loving memory of Capt. 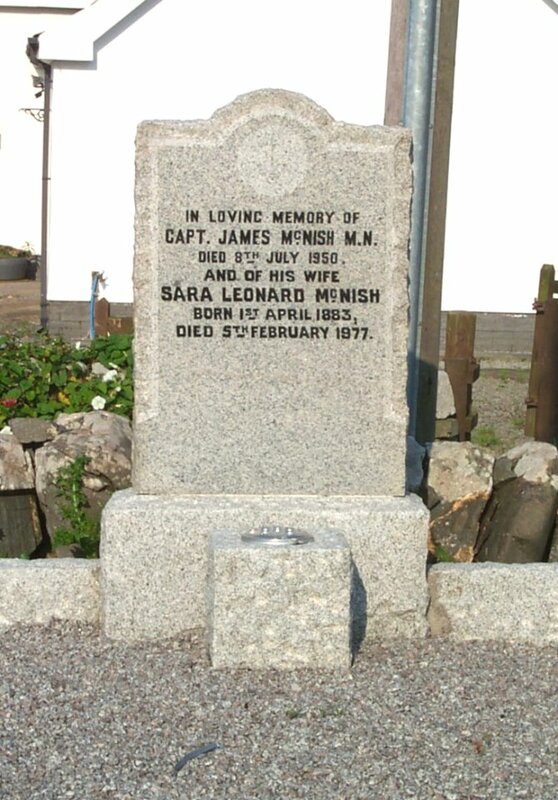 James McNish, M.N., died 8th July 1950. And his wife Sarah Leonard McNish, born 1st April 1883, died 5th February 1977. 5 Erected in memory of Mary Haugh, relict the late William Cart(er) who died very suddenly at (Ingles)ton of Borgue, December (pieces missing) A true friend and faithful servant. 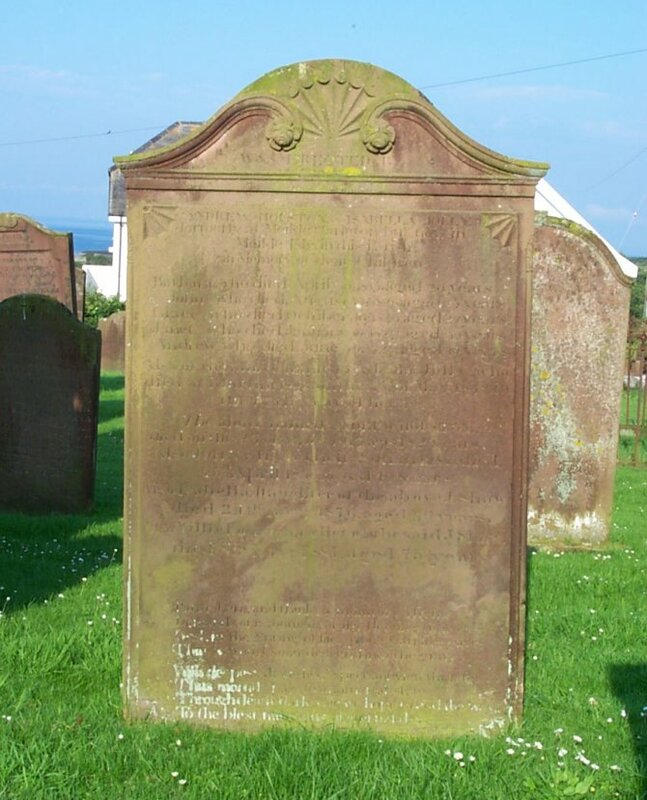 6 Erected by Thomas & Jane Cannal, in memory of Edward their son, who was drowned in Douglas Bay, Isle-of-Man, 13 July 1848, aged 11 years, and is interred here. 7 In memory of William Carson, who was unfortunately drowned near this place, 24th Oct 1826, aged 21 years. 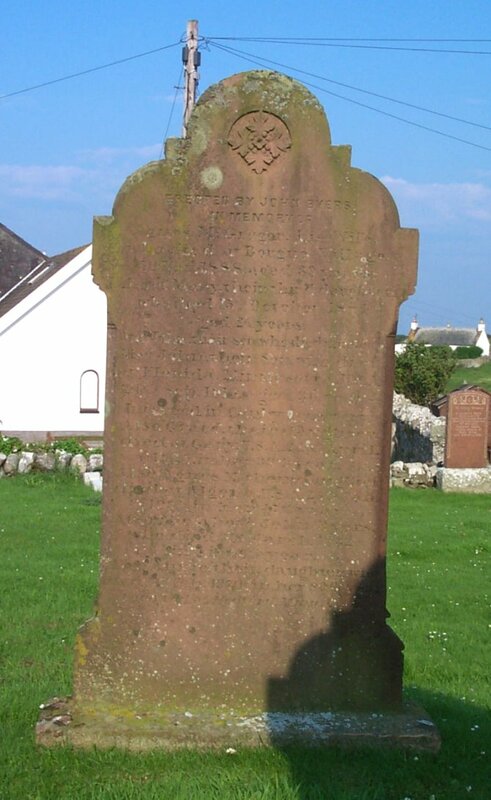 8 Erected by the Parishioners of Borgue, in memory of Thomas Brown, James Duffy, Albert Gough, and Frank White, who lost their lives by the wreck of the Steamer “Truda”, on Barlocca Island, on 27th February 1903. 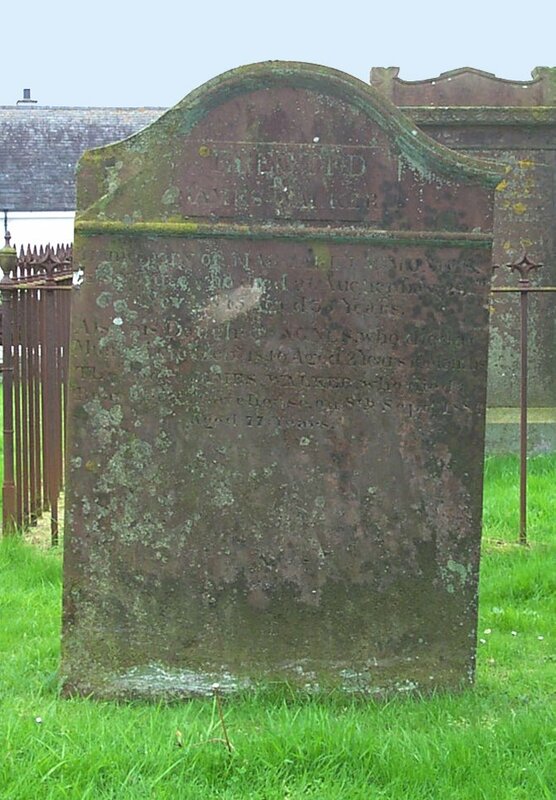 9 Here lies the corpse of William Reid, who died Feb’r 5th 1776, aged 65. Also Agness Kennan, his spouse, who died Feb’r 1765, aged 62 years. 12 In memory of William Manson, who died at Risk in 1858, aged 67 years. Nicholas Houston, who died at Risk in 1830, aged 63 years. David Manson, his son, died at Madras, 26 August 1844. Elizabeth Manson, died 27 Nov’r 1877, aged 87 years. 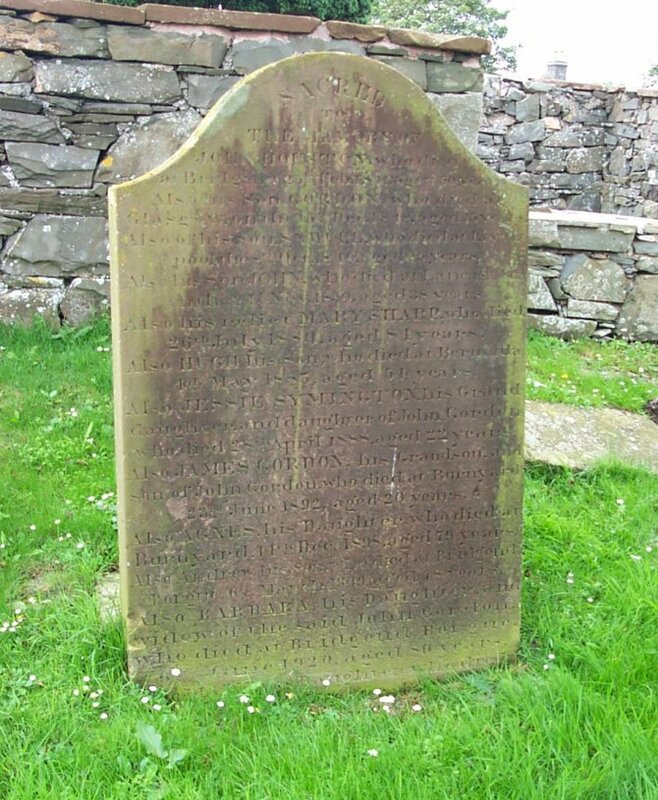 13 In memory of John Carson of Auchengashel, who died 1st Aug't 1836, aged 78 years. Also his spouse, Jane Mitchell, who died at Auchengashel, 14th May 1859, aged 75 years. Also his daughter Nicholas, who died 6th Aug't 1830, aged 22 years. Also of his son John Carson, who died at Auchengashel, 14th March 1851, aged 39 years. Isabella Carson, daughter of the above, died March 5th 1884, aged 77 years. 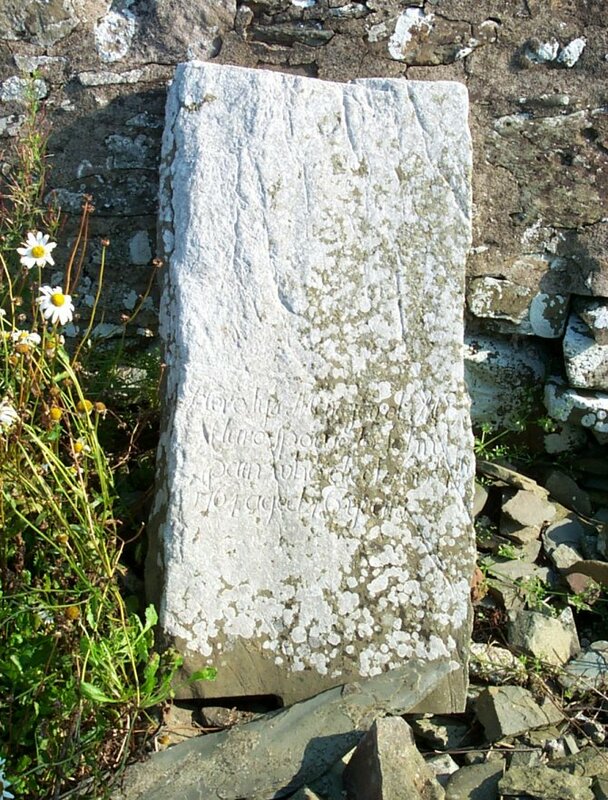 14 In memory of Archibald Mansen, who died in Knockmulloc, June 7 1813, aged 73 years. William. Mansen, his son, who died in Jamaica, June 4th 1817, aged 25 years. Also John Mansen, who died Sept. 1 1797, aged 9 years. Also David Mansen, who died March 7th 1795, aged 18 months. Also John Mansen, who died 8th Nov’r 1823, aged 21 years. 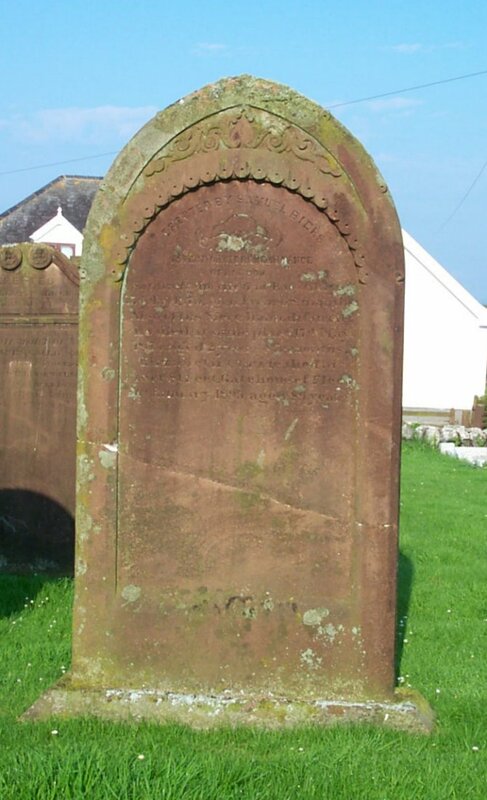 Also Margaret Johnston, widow of Archibald Manson, who died at Chapelton Village, 18 Feb.1846, aged 86 years. 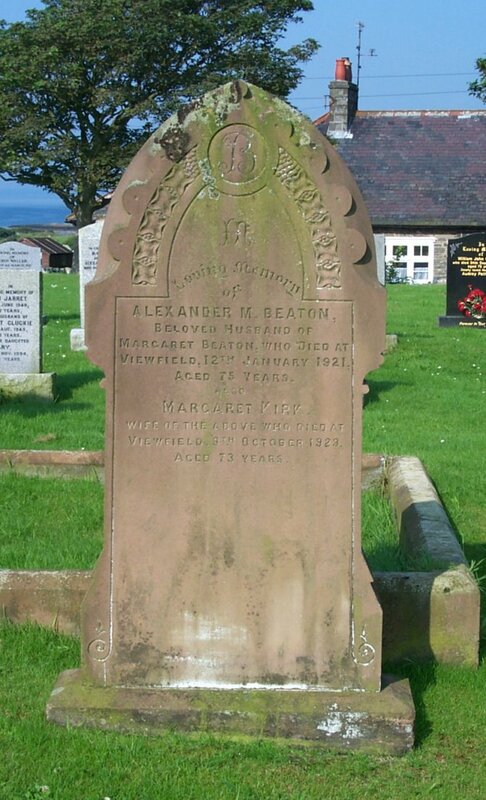 Also Margaret Manson who died in Gatehouse of Fleet, 25 June 1867, aged 67 years. Erected by Margaret Johnston. 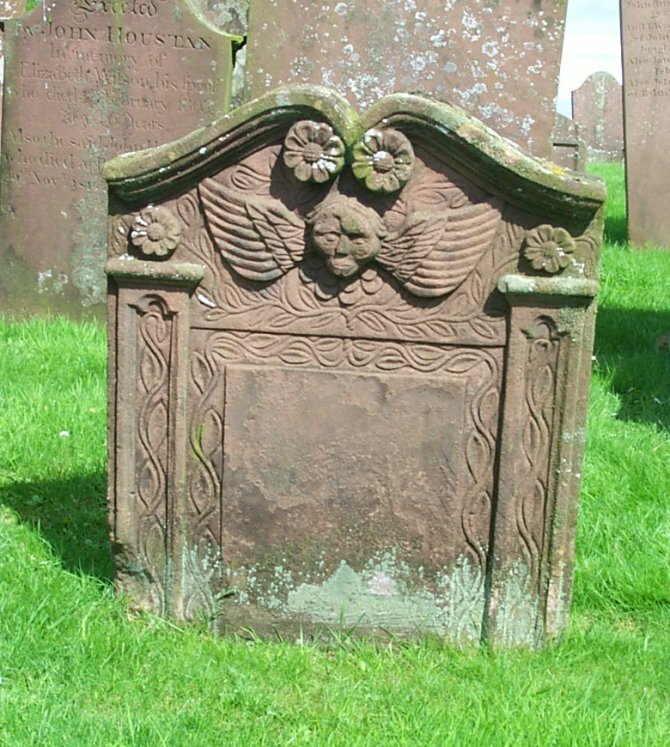 (East) Alexander Johnston, brazier in Borgue, died Oct’r 16 1733, aged 47 years. 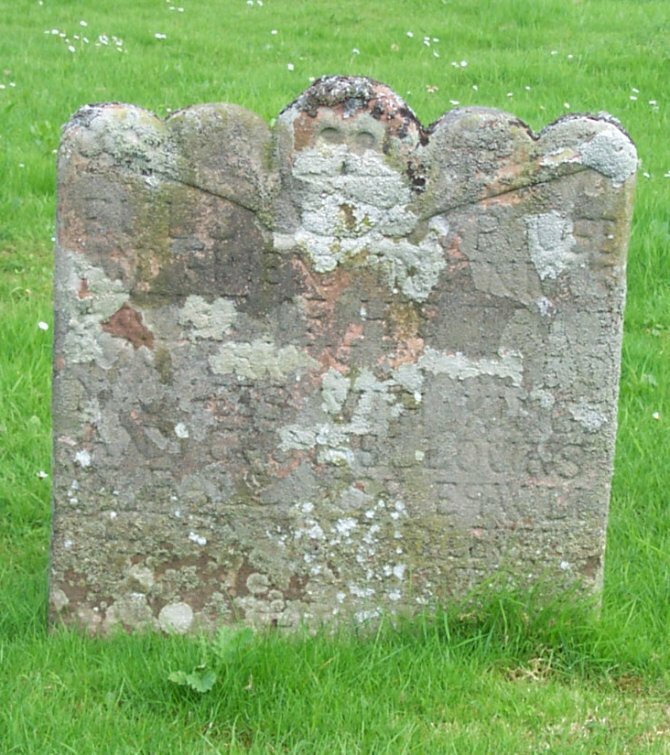 William, his 2d son, died Feb. 9th 1733, aged 21 years. Barbara, died Sept. 9th 1734, aged 15 yrs. 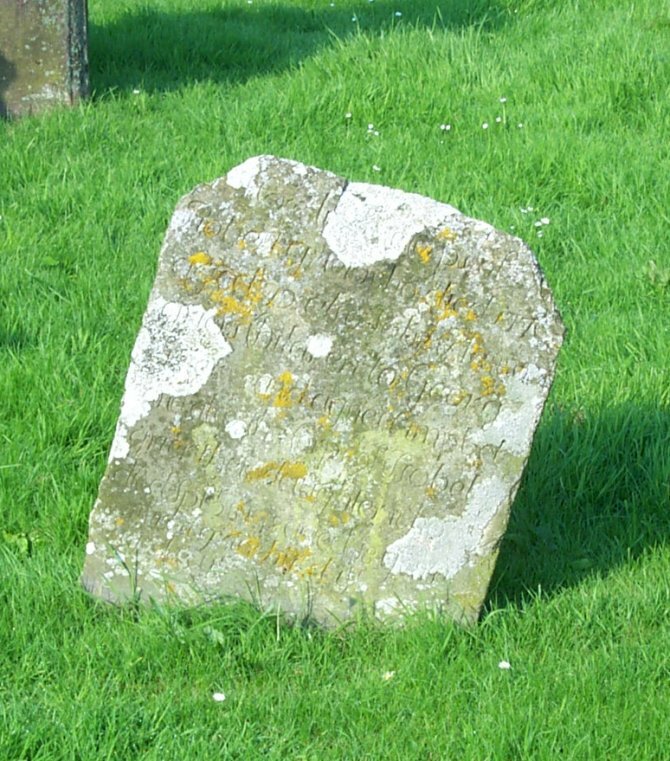 This stone erected by John Johnston, 1749. 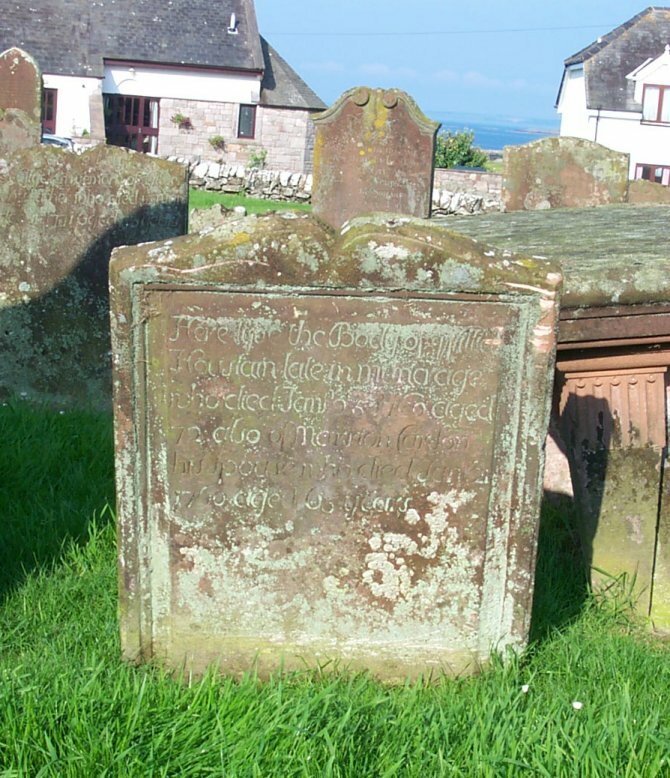 (West) Also Marion McCor’k, died 1758, aged 5. 16 Sacred to the memory of Thomas Ferguson. 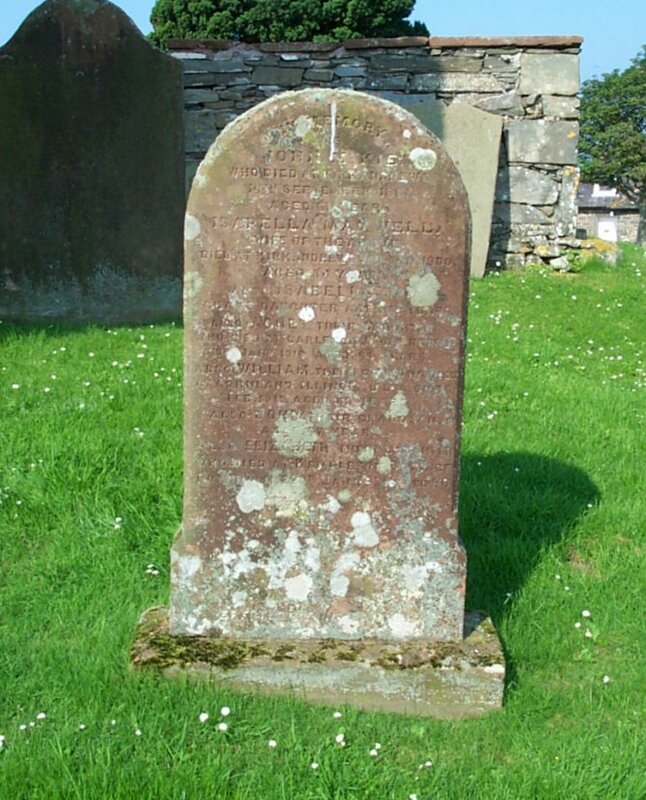 who died at Newton Stewart, 21st May 1865, aged 73. 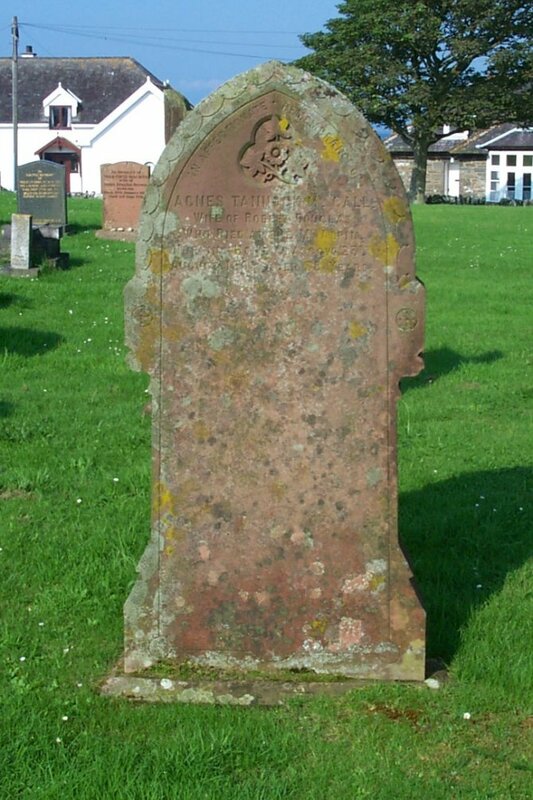 Also his spouse Ann McKinna, who died at Kirkandrews, 14 June 1867, aged 80. 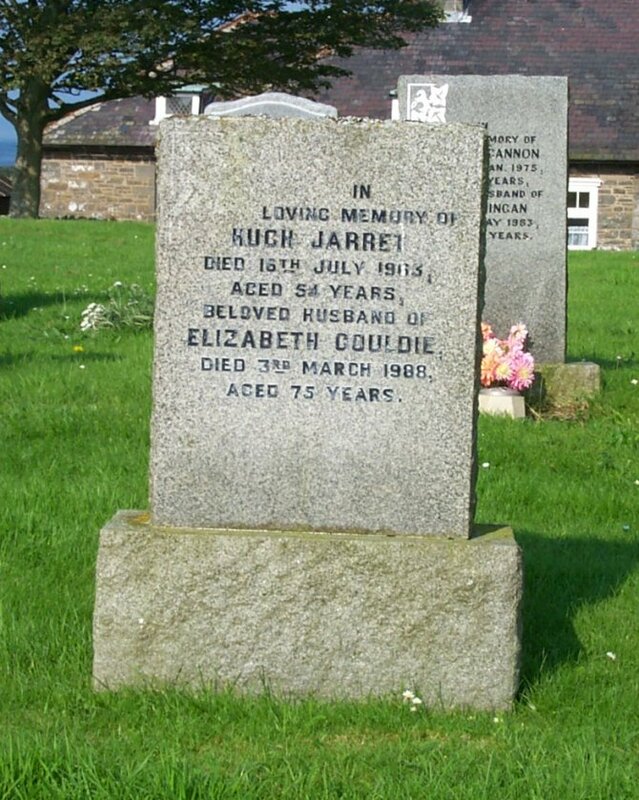 Mary Clure, died at Kirkandrews, 1st April 1898, aged 73 years. Peter Ferguson, her husband, died 20th January 1903, aged 77 years. Rear) full spouse and friend, industrious artist of his trade, industrious to the end. Now hees with kings and counsellours, in balance eqwll leed, by him who levels with an(e stro)ke, the sceptre and the spade. 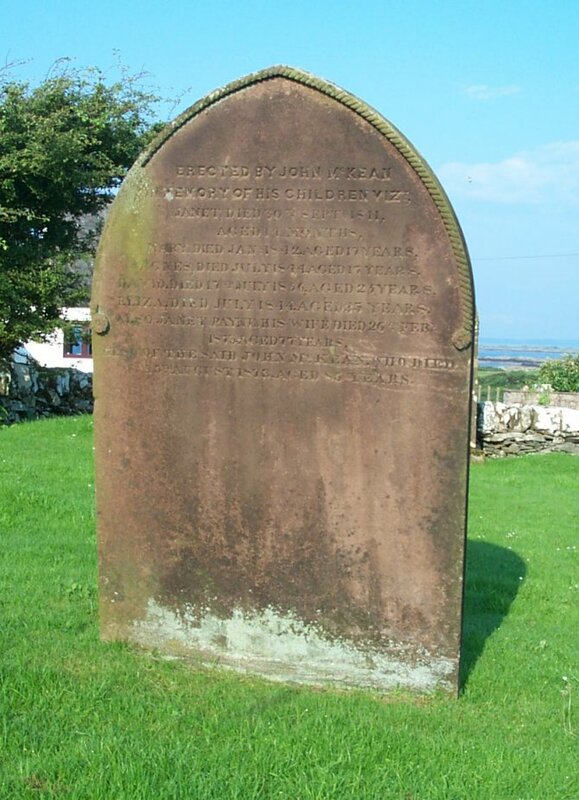 18 Erected by John McKean, in memory of his children viz; Janet, died 30th Sept'r 1841, aged 14 months. Mary, died Jan’y 1842, aged 17 years. Agnes, died July 1844, aged 17 years. David, died 17th July 1856, aged 25 years. Eliza, died July 1844, aged 35 years. Also Janet Payne his wife, died 26th Feb’y 1873, aged 77 years. Also of the said John McKean, who died 15th August 1873, aged 85 years. 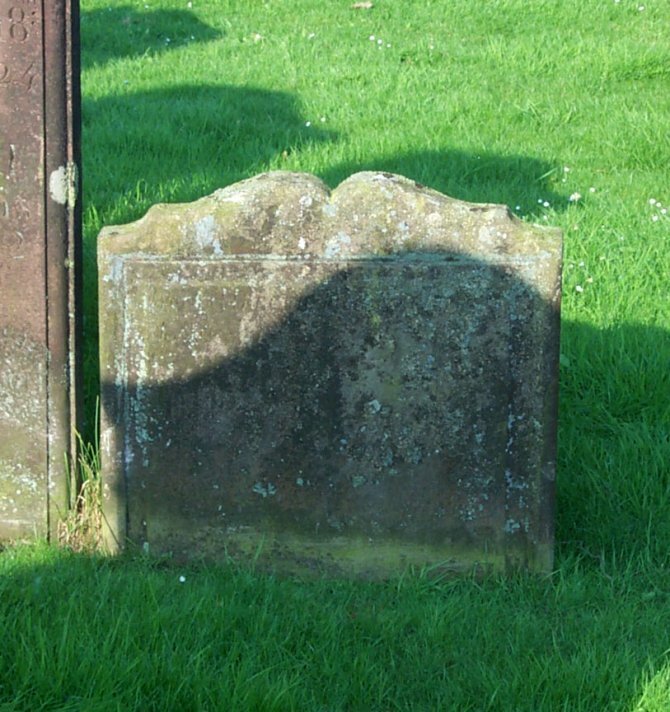 19 Here interred the corpse of William McGaw, who departed this life 31st Jan’y 1797, aged 37 years. He was born in the Parish of Kirkmaiden, in the Shire of Wigton. From a Principle of maternal affection to the memory of her deceast son, this stone is erected by Janet McGaw, his surviving mother. 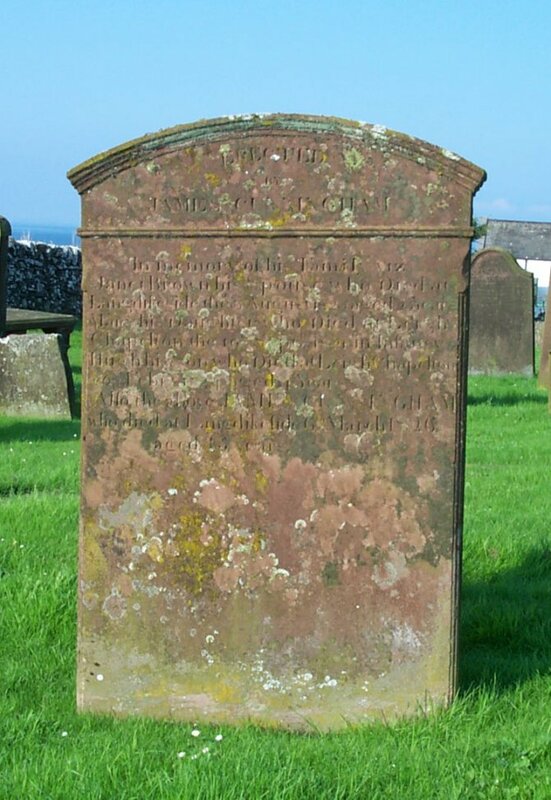 20 In memory of Jannet Campbell, spouse of James Hutchison, Meickleisle, died 28th Sept’r 1831, aged 75 years. 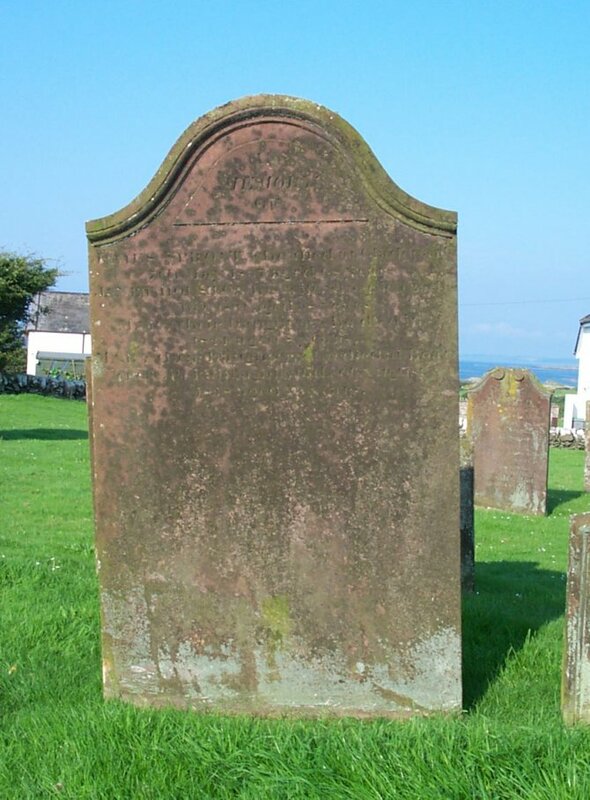 Also Andrew Hutchison their son, who died in Ohio State, America, 18th Feb 1826, aged 34 years. Also Isabella their daughter, who died 12th July 1841, aged 52 years. Also the said James Hutchison, who died the 27th Aug’t 1848, aged 86. 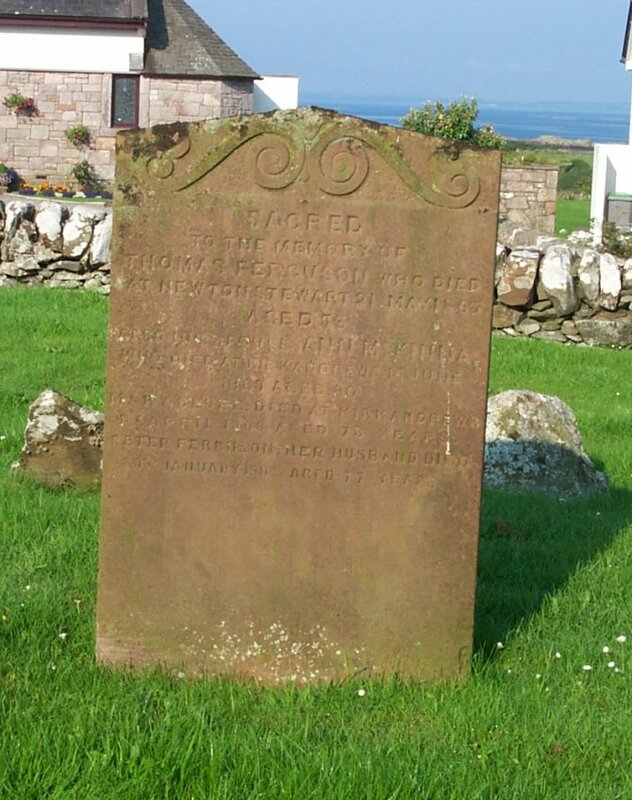 21 Sacred to the memory of Lawrence Higgins, late of Ardwell isle, who died 3d June 1867, aged 73 years. And of Elizabeth Gourlay, relict of the above, who died 25th March 1870, aged 90 years. 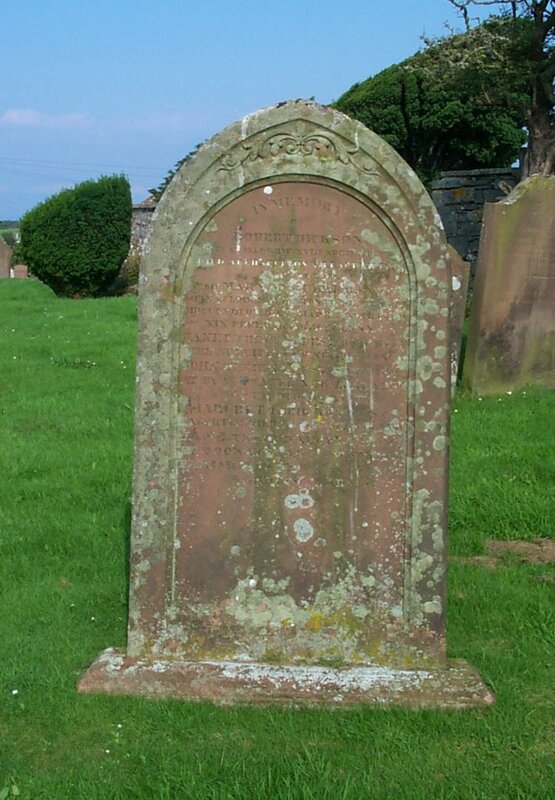 22 Erected by James Walker, in memory of Margaret McMonies, his spouse, who died in Auchenhay, 23rd Nov’r 1845, aged 35 years. 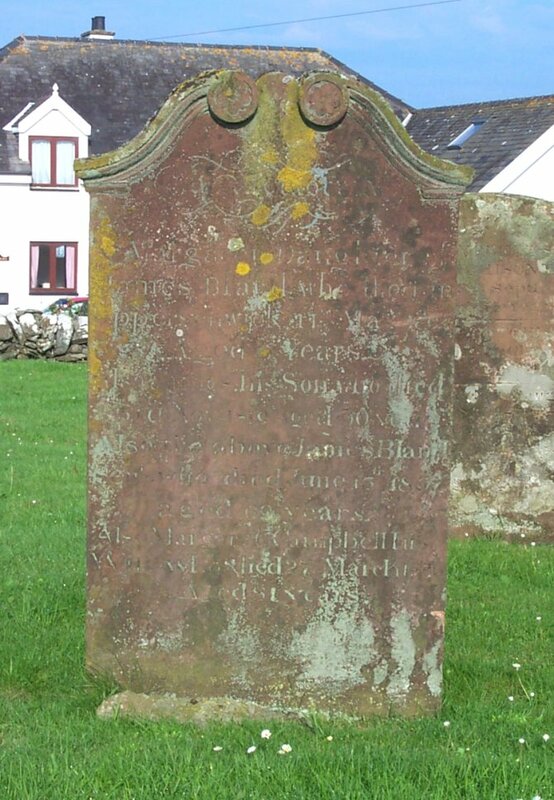 Also his daughter Agnes, who died at Muncraig, 16th Feb’y 1846, aged 2 years 10 months. The above James Walker, who died at Boat Green, Gatehouse, on 8th Sept’r 1884, aged 77 years. 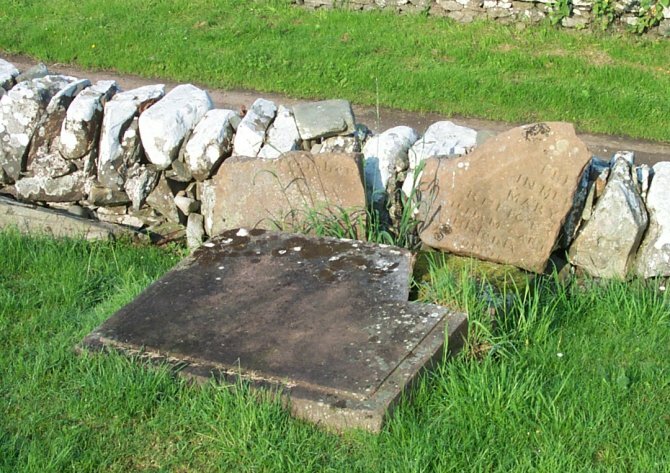 23 Erected by William Walker, farmer in Muncraig, in memory of his spouse Agnes Callie, who died at Muncraig, 16th May 1854, aged 78 years. Also the above William Walker, who died 16th Nov’r 1855, aged 76 years. George his son, died 5th June 1878, aged 69 years. 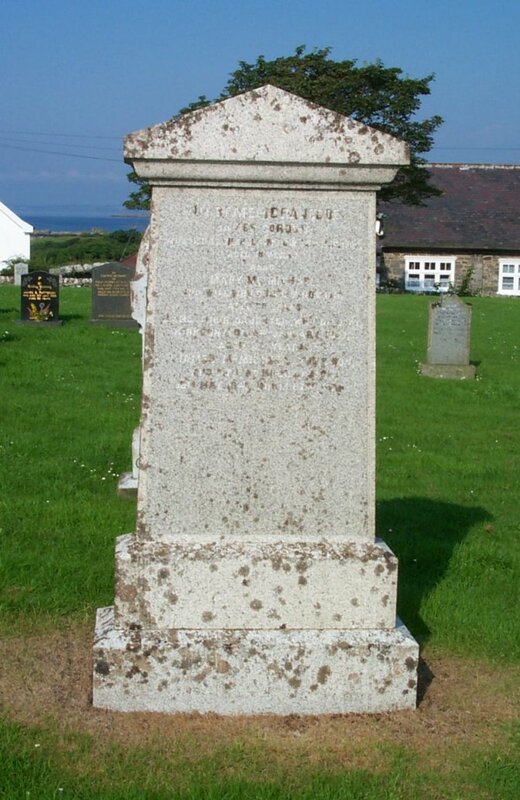 24 Erected by John Byers, in memory of Agnes McGregor, his wife, who died at Borgue Village, 5th Nov 1888, aged 39 years. Also of Mary, their third daughter, who died 15th October 1884, aged 2? years. And John, their son, who died in infancy. Also John, their son, who died at Florida, Minnesotta, USA, 24th Sep 1915, aged 36 years, interred in Canby Cemetery. Also Grace, their daughter, died at Gary, USA, 22nd April 1925, in her 39th year. Also Agnes M., their daughter, died at Algona, USA, 25th Jan 1931, in her 47th year. Also the above John Byers, who died 31st March 1932, in his 86th year. Also Annie, their daughter, who died 5th Feb 1970, in her 89th year, interred at Medford, Minn., USA. 25 Sacred to the memory of James Byers, who died at Meggerland, 31st Jan'y 1893, aged 87 years. And Annie Harvey, his wife, who died at Meggerland, 12th January 1899, aged 90 years. 26 Erected by Samuel Biers, in affectionate remembrance of his son Samuel, who died at Barstibly, 15th May 1875, aged 1 year & 8 months. Also of his niece Hannah Currie, who died at same place, 17th May 1875, aged 2 years & 3 months. Elizabeth Currie, died at Fleet Street, Gatehouse, 21st January 1895, aged 89 years. 27 In memory of John Manson, who died at Southpark, 13th Dec 1865, aged 52 years. James his son, who died at Balmangan, 10th Nov.1847, aged 10 months. Isabella Biers, who died at Brighouse, 27th May 1903, aged 88 years. 28 Erected by James Biers, in memory of Robert, his son, who died in Megger-land, 26th Jan’y 1820, aged 9 years. Samuel his son, died 18th June 1824, aged 7 years. Also his mother Mary Alexander, who died 3d July 1836, aged 94 years. Also the said James Biers, who died 9th Feb 1849, aped 75 yrs. Also Jennet Stevenson his spouse, who died 13th June 1866, aged 86 years. 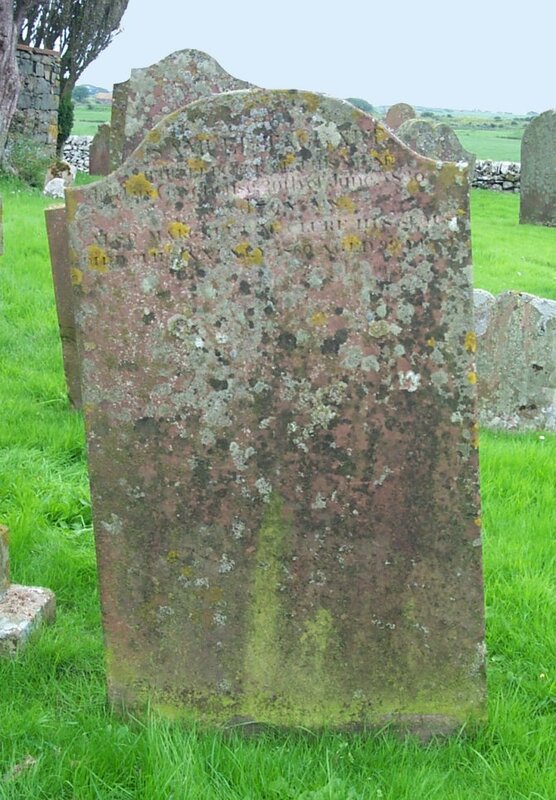 Mary Biers, died at Whiteside, Kirkgunzeon, 26th May 1901, aged 86 years. 29 Erected by Wm. Dickson, in Margrie, as the last tribute of respect in memory of his uncle William Houston, who died October 29th 1820, aged 80 years. The above William Dickson, who died 25th March 1856, aged 70 years. 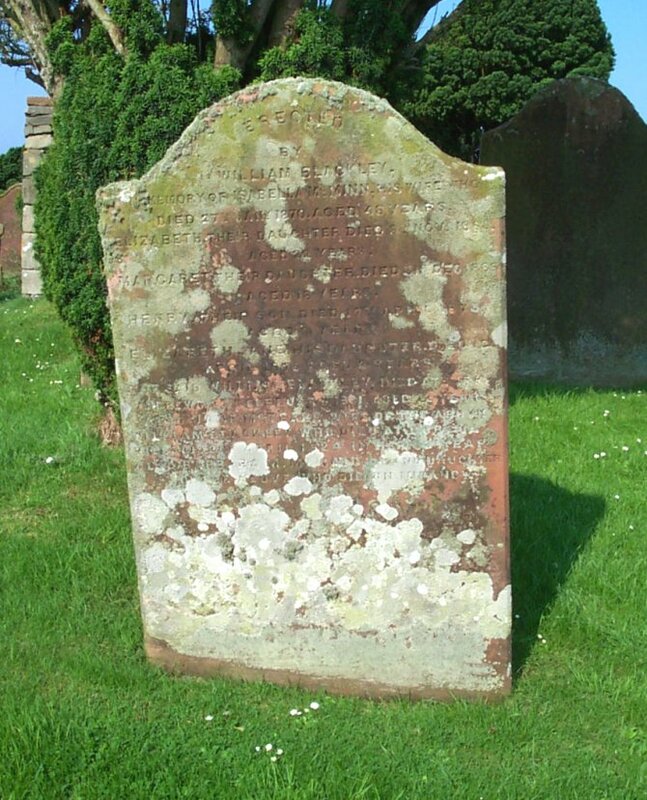 30 In memory of Margaret, daughter of James Bland, who died in Upper Senwick, 14th May 1804, aged 5 years. Also James his son, who died 3rd Nov. 1819, aged 30 years. Also the above James Bland, sen’r, who died June 13 1837, aged 69 years. 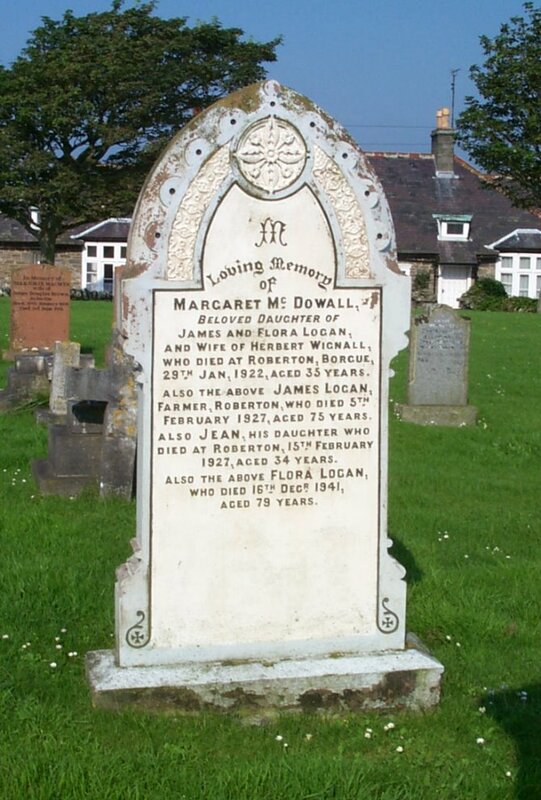 Also Margaret Campbell, his wife, who died 27 March 1846, aged 81 years. 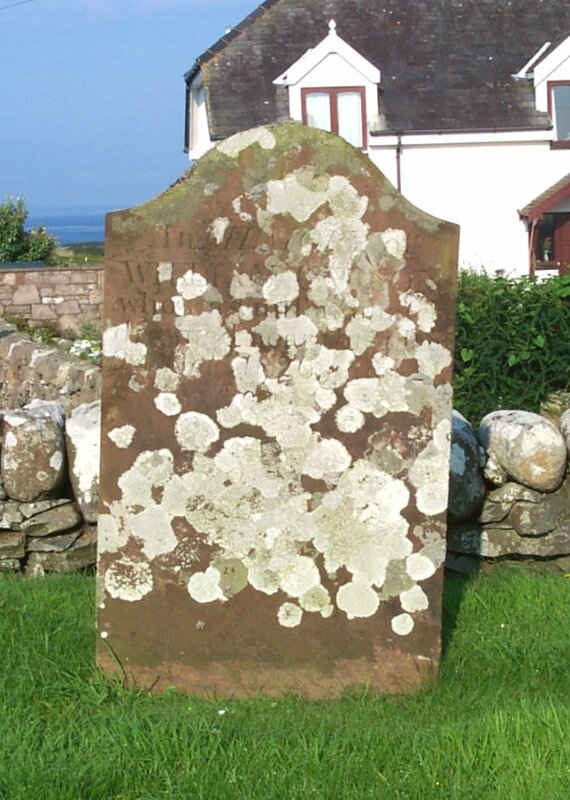 31 (Front) Here lyes the body of Isobel Taggart, who departed this life, Feb 17 1748, aged 19 years. (Rear) Memento Mori. Resurcam. Tempus Fugit. 32 Erected by James Payne, in memory of his father John Payne, who died 18th Sept 1864, aged 84 years Also his sister Mary Payne, who died 16th January 1848, aged 37 years, and is interred in Calton Burying Ground, Edinburgh. Also his mother Elizabeth Conning, who died 26th June 1870, aged 84 years. 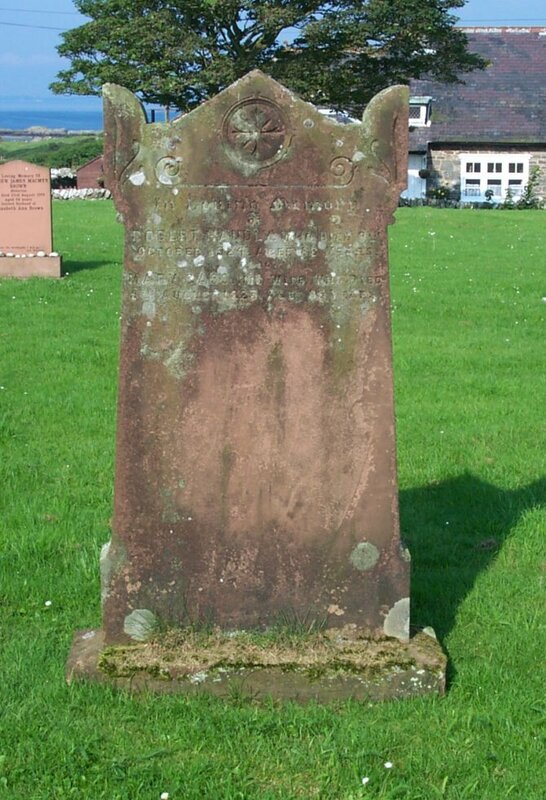 Also the above James Payne, who died at Cree Bridge, Newton Stewart, 13th February 1892, aged 67 years. Also his sister Margaret, who died at Borgue, 19th August 1898, aged 82 years. 33 Erected in memory of James McMonies, who died at Balannan, in the Parish of Tongland, on the 21st May 1854, aged 59 years. 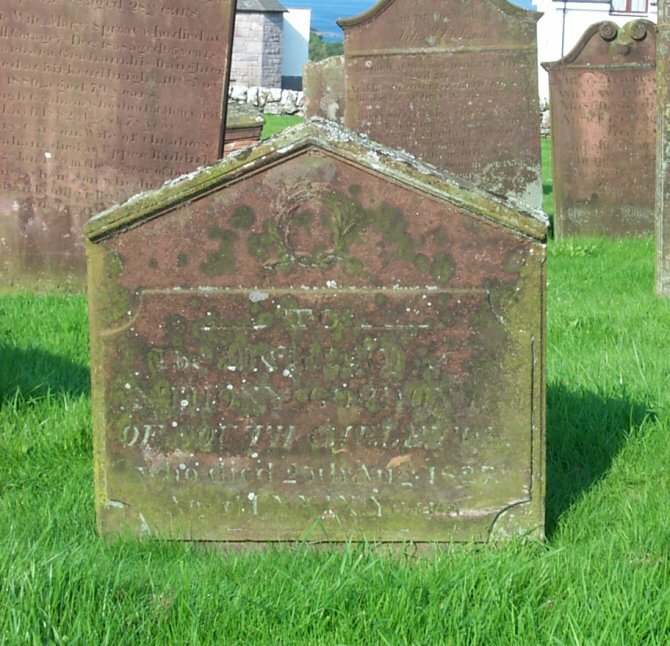 Also Jane Brown his spouse, who died at Kirkcudbright, on the 18th February 1867, aged 62 years. 34 (Front) Here lyes Robert McWhae, who was barbarously shot to death by Captane Douglash, in this Paroch, for his adherence to Scotlands Reformation Covenants National and Solemn League 1685. (Rear) Re-erected by the inhabitants of this Parish, AD 1855. 35 Erected by Samuel Houstan in Carleton in memory of Barbra Cowan, his spouse, who died Sept'r 25th 1791, aged 72 years. Also here lyes the corpse of the said Samuel Houstan, who died March the 23d 1793, aged 78 years. 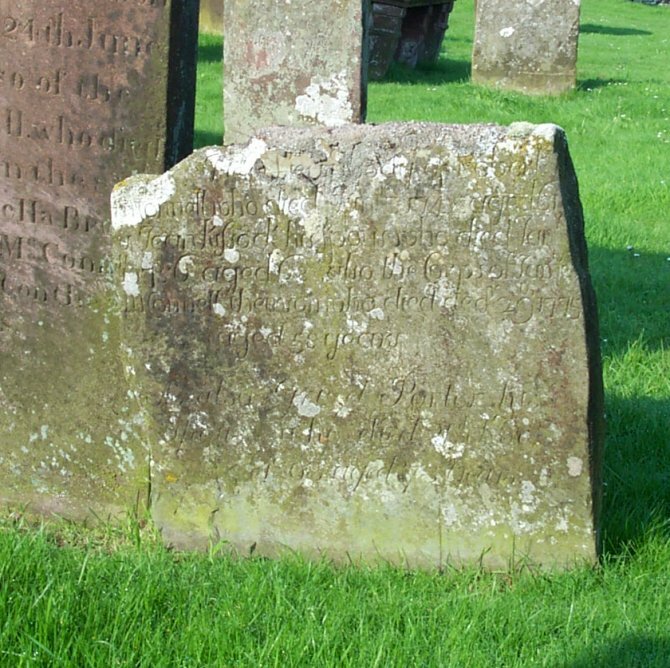 Also here lies Barbara Jolly, spouse to James Houstan of Bridgend of Killdarroch, who departed this life 13th August 1811, aged 59 years. 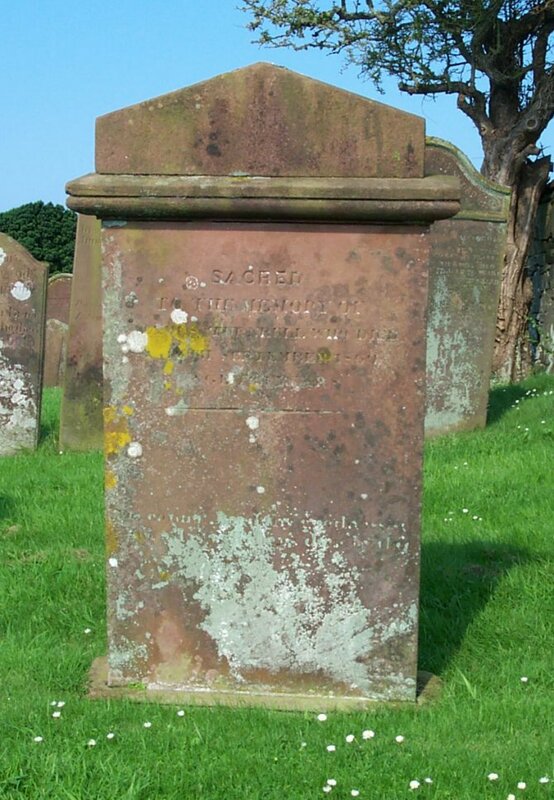 The said James Houstan, who died at Bridgend, 3rd Feb’y 1831, aged 78 years. 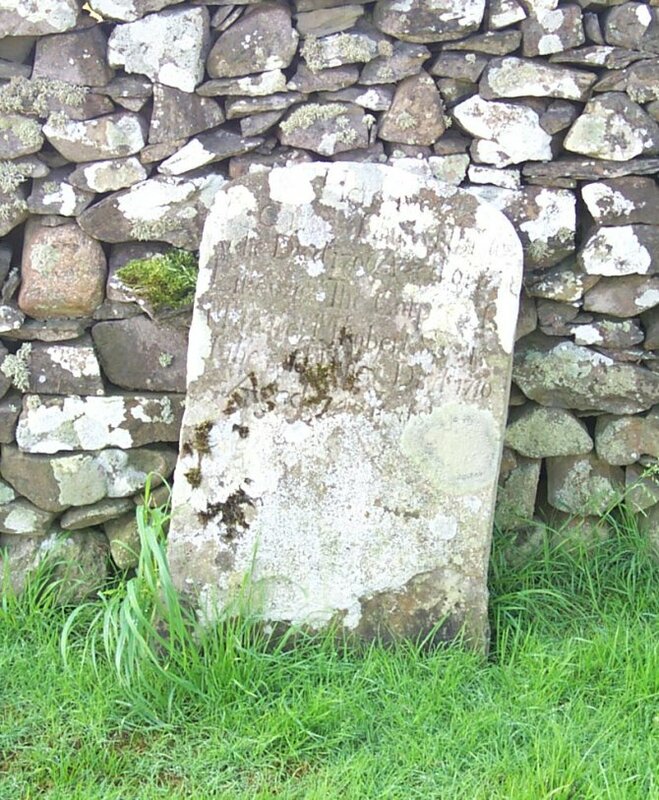 36 (Front) Erected by John Nicholson, bookseller in Kirkcudhright, in memory of his mother, Barbra Houston, who died in Tongland, 28th July 1802, aged 61 years. And of his father James Nicholson, who died 28th October 1802, aged 80 years. 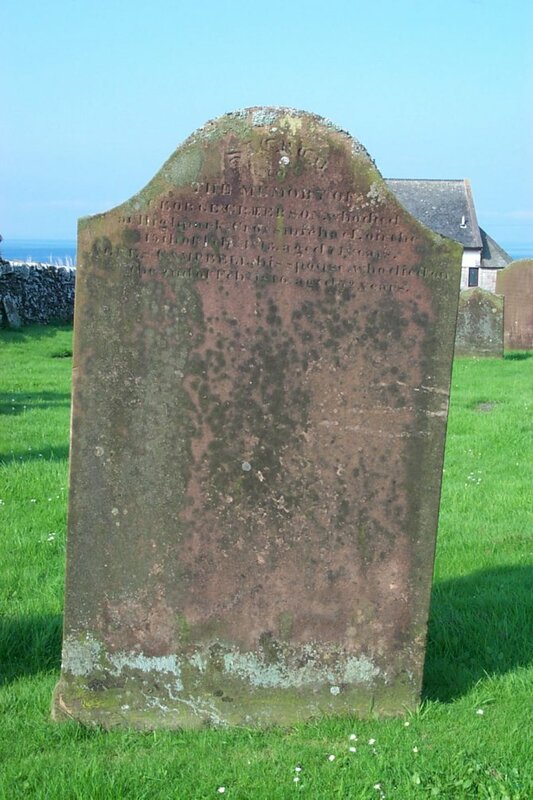 And of his sister Barbara Nicholson, who died at Kirkandrews, 5th Sep'r 1856, aged 82 years. 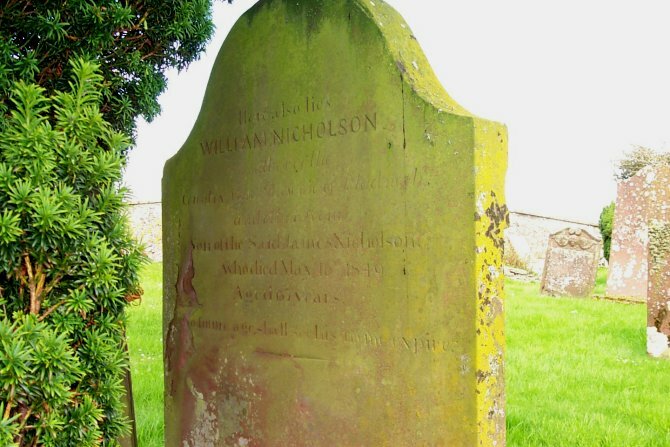 (Rear) Here also lies William Nicholson, author of the Country Lass, Brownie of Bladnoch, and other poems, son of the said John Nicholson, who died May 16th 1819, aged 67 years. No future age shall see his name expire. 37 Erected by William Paton, in Barcaple, to the memory of Margaret Jolly, his spouse, who died 23d Dec'r 1796, aged 52 years. 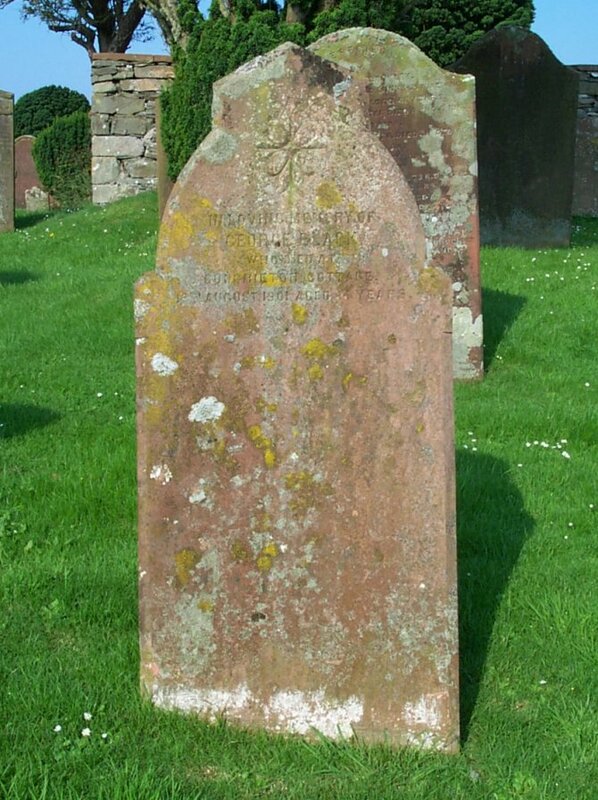 Also their daughter Janne,t who died 9th January 1784, aged 3 years. And my father Wm. 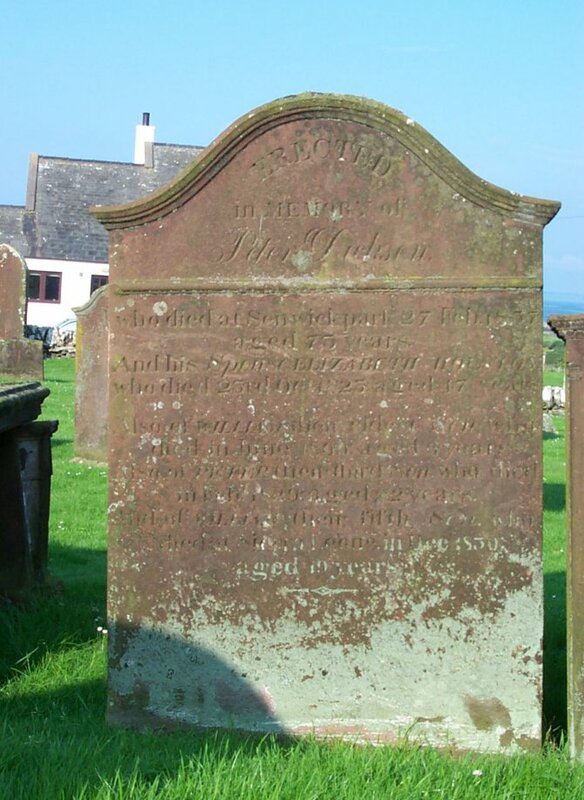 Paton, who died 9th January 1791, aged 78 years. 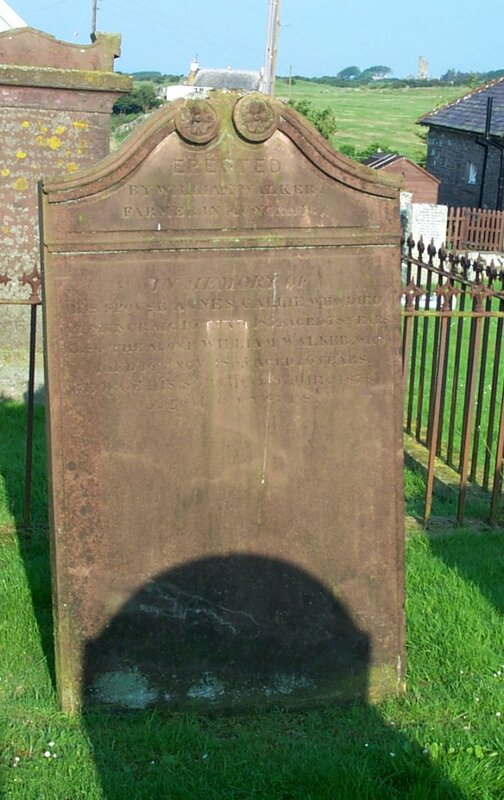 And Barbara Kie, his spouse, died 10th July 1803, aged 87. 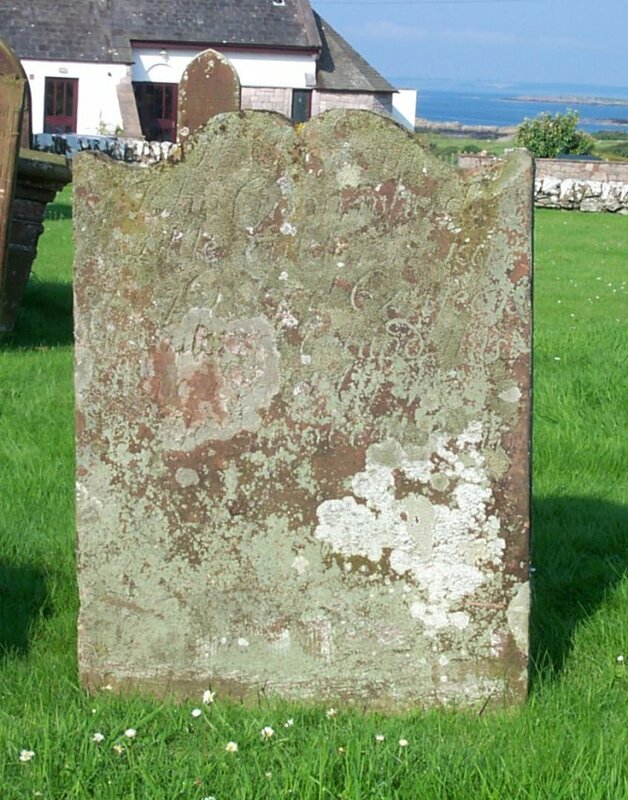 38 (Front) This stone was erected by Andrew Houston and Isabella Jolly formerly at Meikle Carleton but now in Meikle Isle in this Parish in memory of their children:- Barbara who died April 30 1815 aged 20 years. John, who died August 15 1824, aged 25 years. Grace, who died October 10 1825, aged 22 years. Janet, who died January 16 1827, aged 34 years. Andrew, who died June 10 1827, aged 19 years. 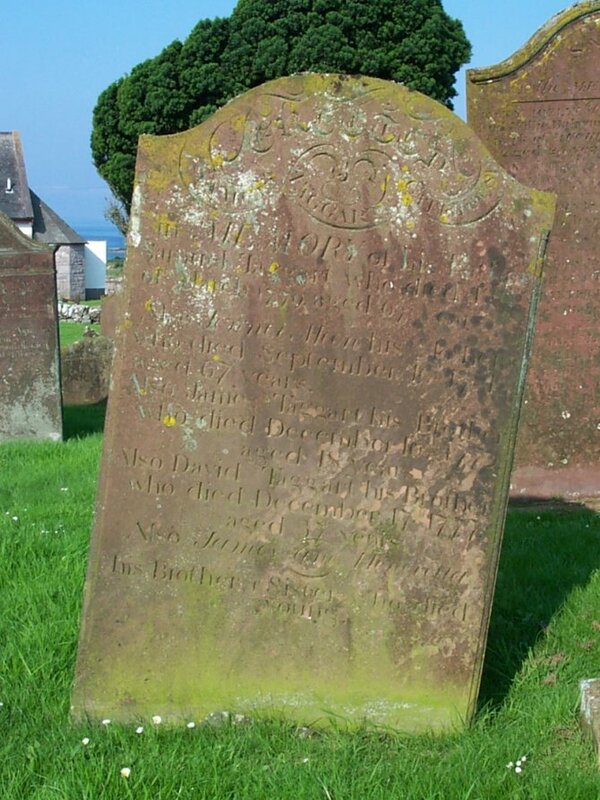 Also of the above named Isabella Jolly, who died at Blackbriggs, on the 17th of May 1842, in the 77th year of her age. The above named Andrew Houston, died on the 23 of Sept’r. 1843 aged 82 years. 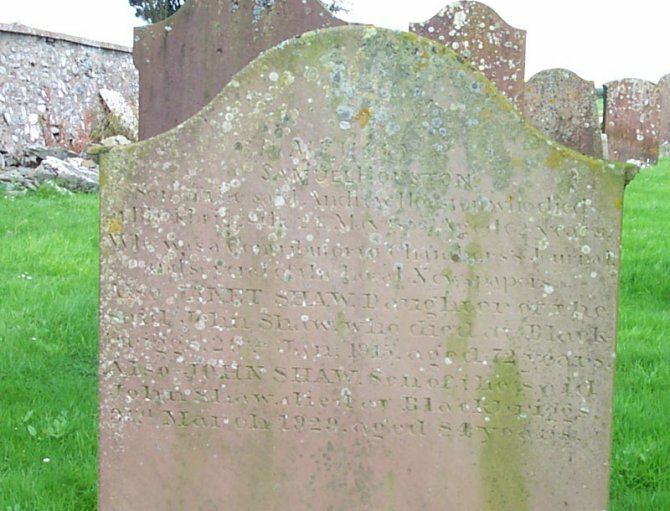 Also John Shaw, their son-in-law, died 25th April 1856, aged 49 years. Also Isabella, daughter of the above J. Shaw, died 24th Nov'r 1876, aged 40 years. Also Willie Houston, relict of the said J. Shaw, died 8th Nov'r 1881, aged 75 years. Pause here and think: a monitory rhyme, demands one moment of thy fleeting time. God in the spring of life strong warning gave, that we must soon descend into the grave, with deepest thoughts, spectator, view thy fate, thus mortals pass to an immortal state, through death’s dark vale we hope to find the way to the blest mansions of eternal day. (Rear) In memory of Samuel Houston, son of the said Andrew Houston, who died at Blackbriggs, the 24th May 1853, aged 62 years, who was a contributor to Chamber’s Journal and several of the local newspapers. Also Janet Shaw, daughter of the said John Shaw, who died a Blackbriggs, 26th Jan 1915, aged 72 years. Also John Shaw, son of the said John Shaw, died at Blackbriggs, 3rd March 1929, aged 84 years. 39 Erected by Joseph Little, in memory of Helen Jolly, his wife, who died at Twynholm, 5th August 1874, aged 64 years. 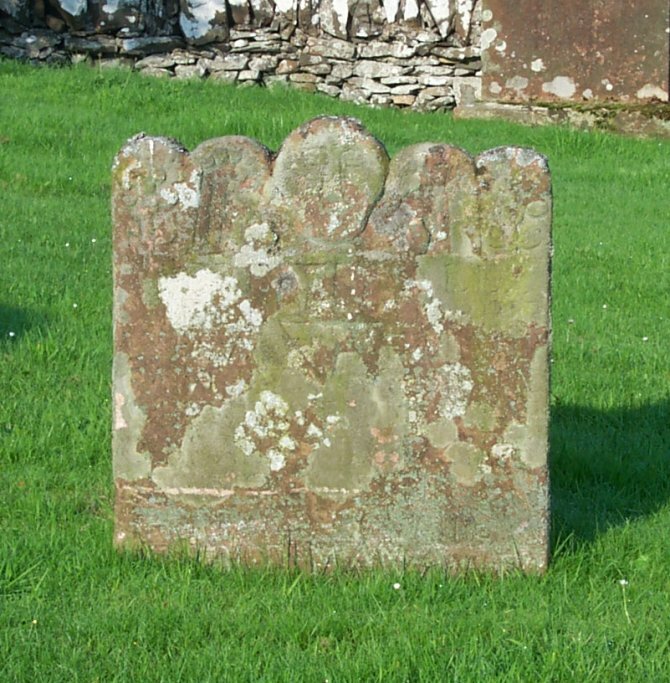 And Mary their daughter, who died at Barwhinnock, 7th Nov'r 1848, aged 7 months. 40 (East) Erected by Elisabeth Coultart his spouse. 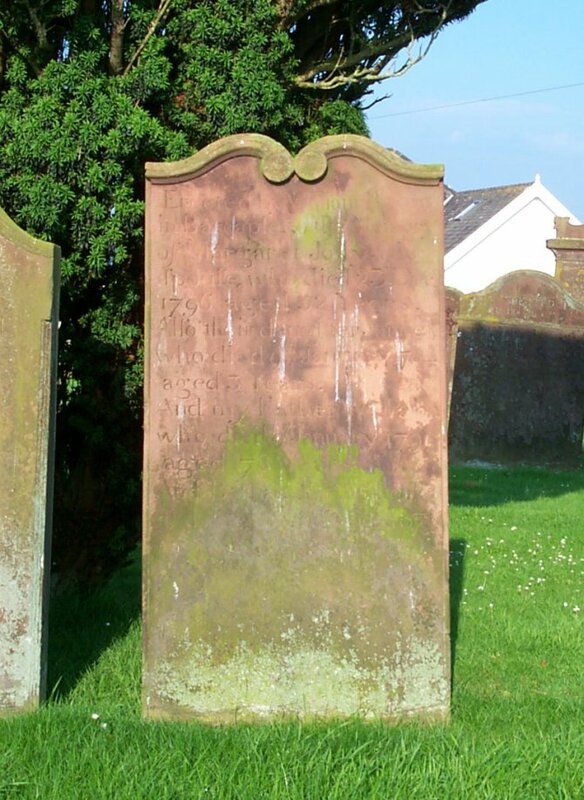 (West) Here lies the corpse of James Houston, late in Chappel, who died July 22nd 1788 aged 62 years. 41 (Front) In memory of William Houstan, mason, who died 18th Apriel 1796, aged 24 years. And also Blair and Thomas Houstans who died young, his 2 brothers. Also William Dickson, who died 21 June 1809, aged 6 years. (Rear) Erected by John Houstan, in memory of Elizabeth Wilson, his spouse, who died 3rd February 1803, aged 65 years. 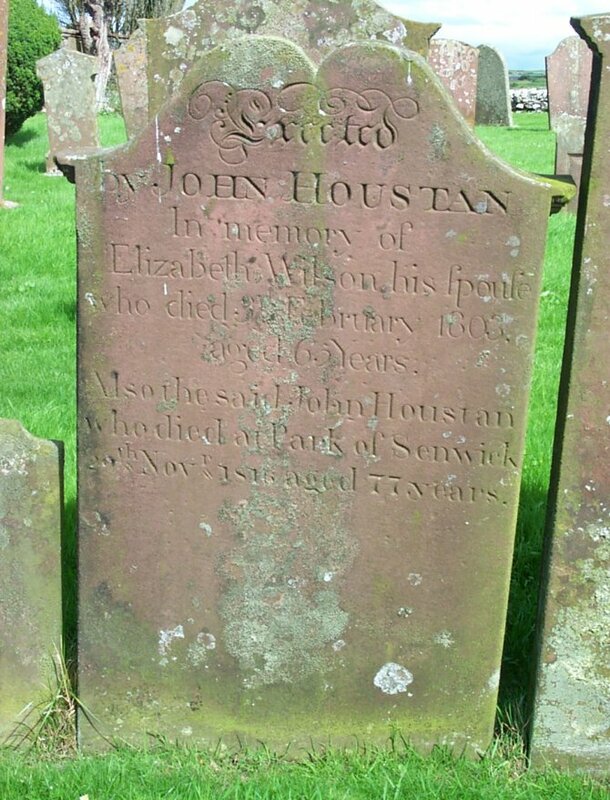 Also the said John Houstan, who died at Park of Senwick, 29th Nov'r 1816, aged 77 years. 42 Erected in memory of Peter Dickson, who died at Senwick Park, 27 Feb. 1837, aged 73 years. And his spouse, Elizabeth Houston, who died 23rd Oct. 1823, aged 47 years. Also of William, their eldest son, who died in June 1809, aged 6 years. 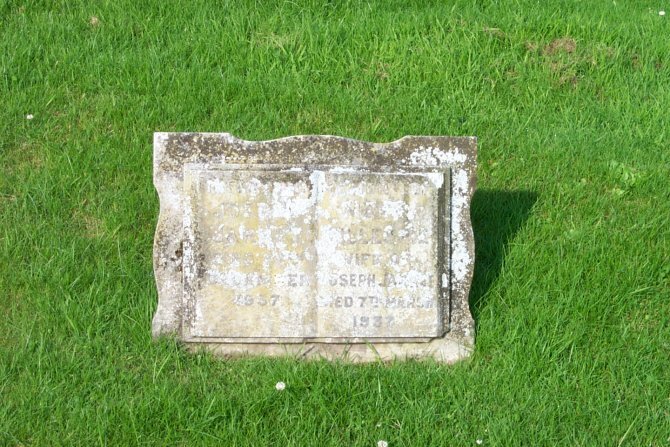 Also of Peter, their third son, who died in Feb 1829, aged 22 years. And of William, their fifth son, who died at Sierra Leone, in Dec. 1830, aged 19 years. 43 In memory of Nicolas McConchie spouse to Andrew Carson of Auchengashell, who departed this life 15th Jan 1768 aged 29 years. 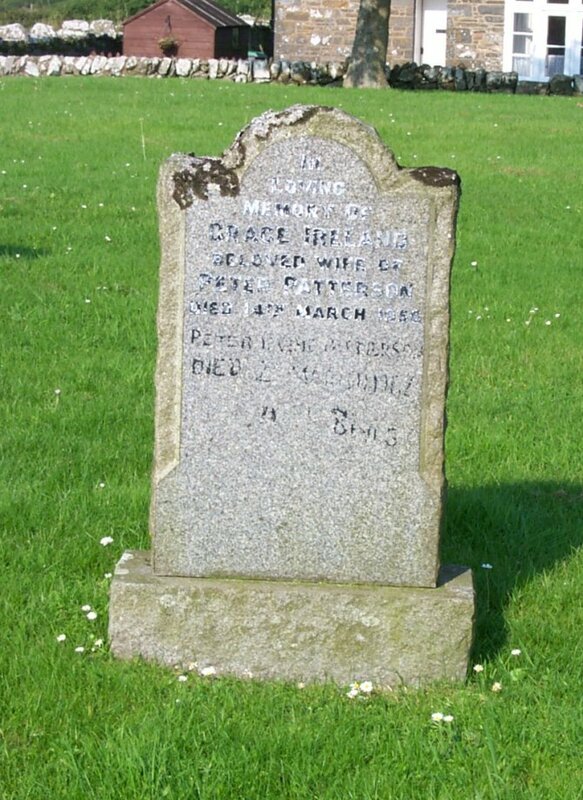 Also her husband who died 15th of Nov. 1799 aged 77 years. 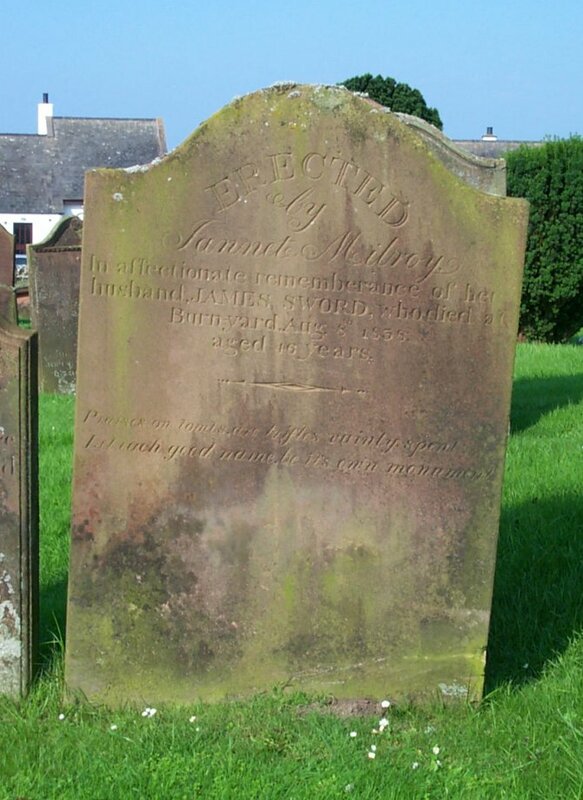 And of Jane Murray, his spouse, who died 26th May 1816, aged 81 years. Jane Papple, daughter of John Papple, who died at Gatehouse, 28th Aug’t 1817, aged 23 years. Also Nicholas Carson, who died 6th Aug’t 1830, aged 22 years. She was second daughter of John Carson of Auchengashel. 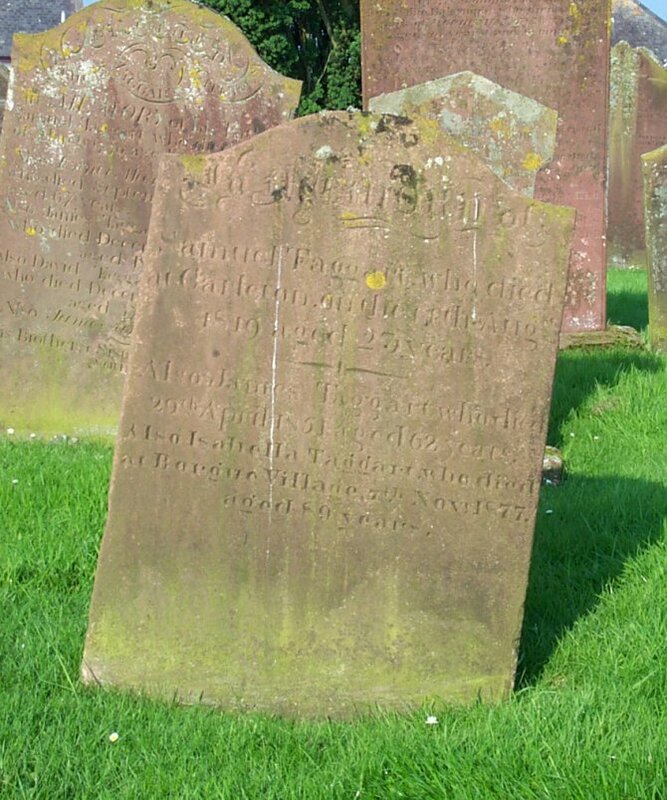 Also Mary Carson, spouse to John Papple, late physician, Gatehouse of Fleet, who died 2 March 1833, aged 71 years. 44 (Edges) Erected by Andrew Hustan, David & William Hustans, their sons. 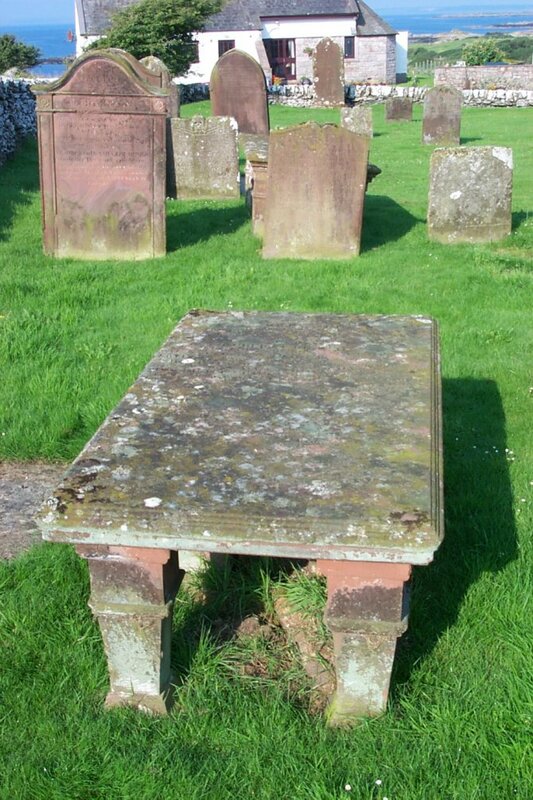 (East) Here lyes the body of William Houstain, late in Muncraigs, who died Jan’y 25 1760, aged 72. Also of Marrion Carson, his spouse, who died Jan. 21 1760, aged 65 years. 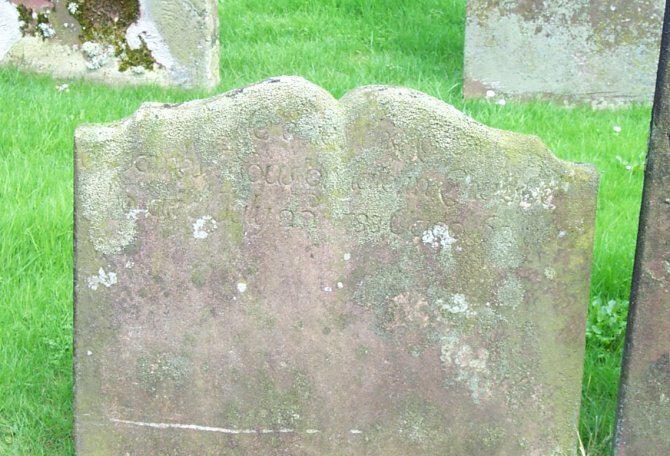 (West) Here lyes the corpse of Jannet Bryce, spouse to Andrew Houstan in Ingleston, who died March 5th 1780, aged 61 years. 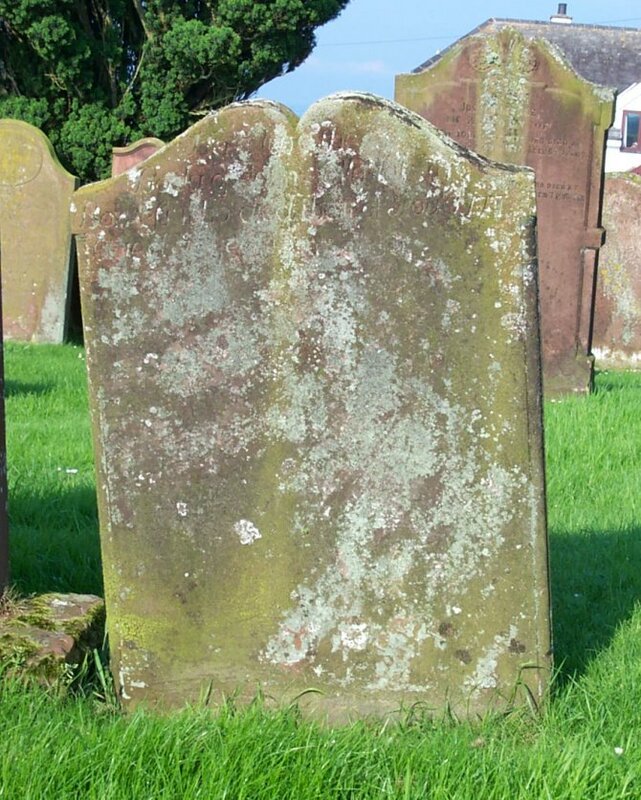 And also the said Andrew Houstan who died in Grey Croft, March 18th 1799, aged 77 years. 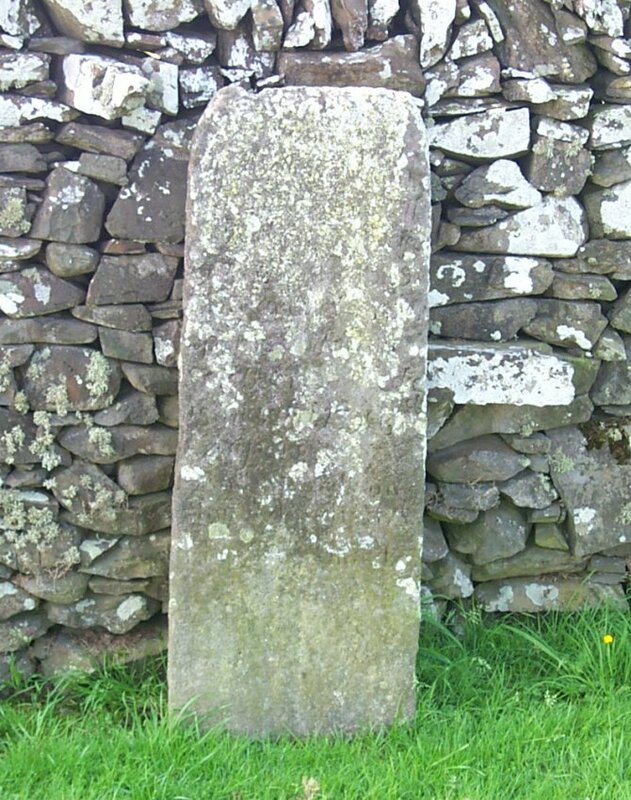 45 Erected by James Calyell, in memory of Gilbert Calyell, his father, who died in Muncraig, Dec’r 11th 1771’ aged 73 years. 46 Erected by Margaret and Agnes Callies, in memory of their father James Callie, late tennant in Muncraig, who died 27th Feb’y 1808, aged 79 years. 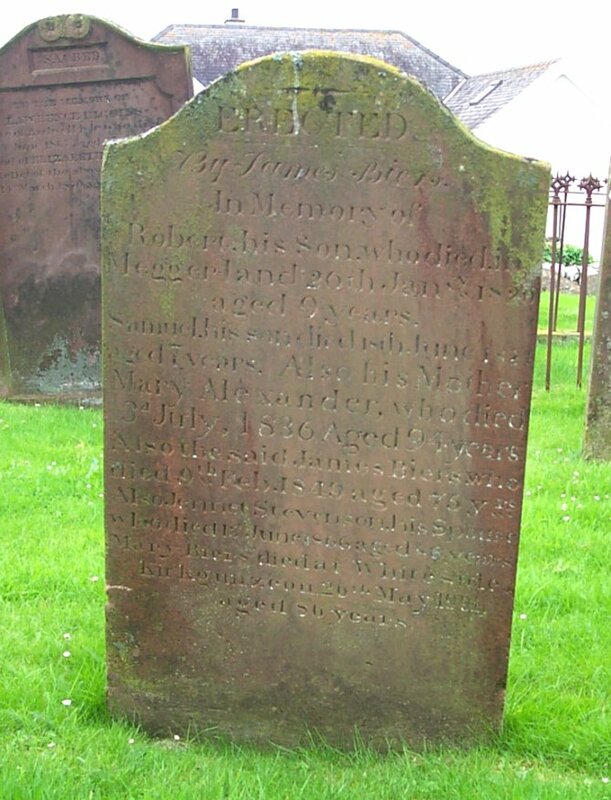 Also John Sceally his grandson, who died Sept'r 1791, aged 9 months. 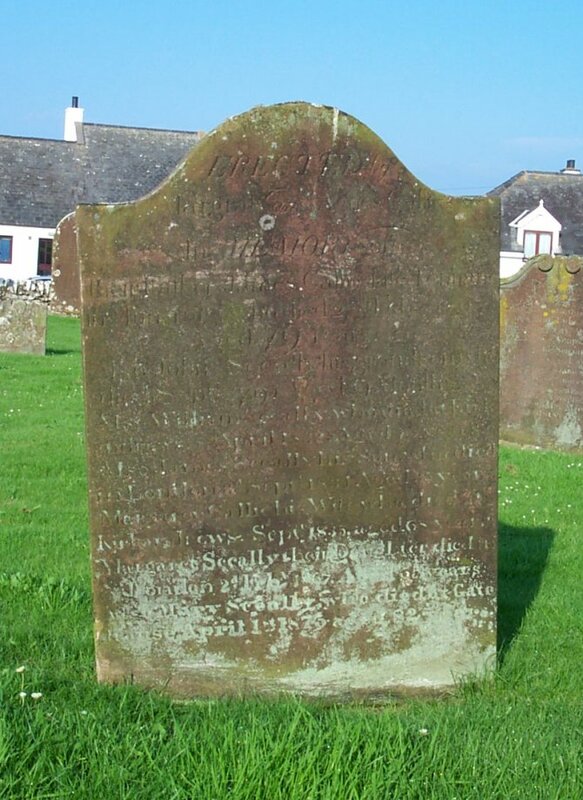 Also William Sceally, who died at Kirkandrews, 8th April 1832, aged 75 years. Also James Sceally, his son, who died in London, 3d Sept’r 1834, aged 35 years. 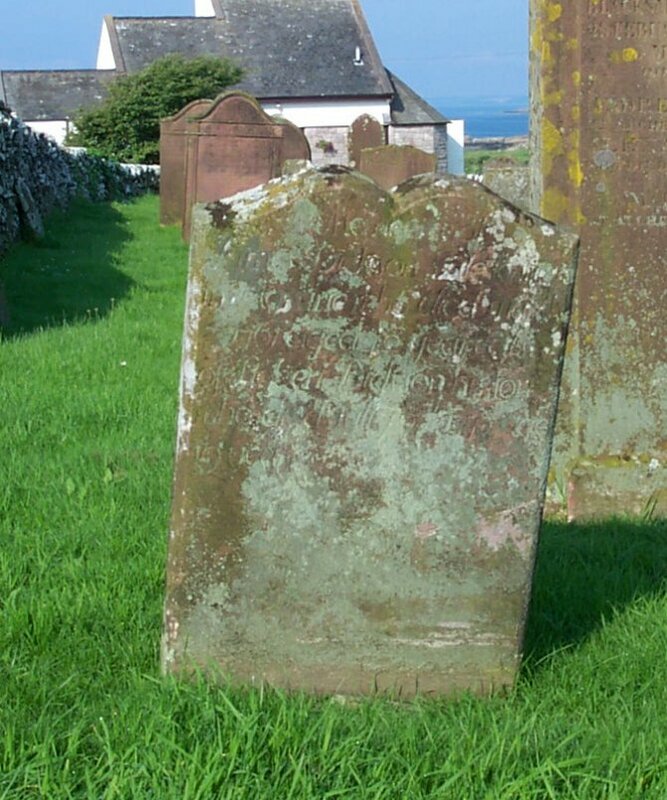 Margaret Callie his wife, who died at Kirkandrews, Sept’r 1835, aged 68 years. Margaret Sceally, their daughter, died in London, 2d Feb 1867, aged 65 years. Also Mary Sceally, who died at Gatehouse, April 1st 1875, aged 82 years. 47 In memory of James Sproat who died at Gladepark, 7th May 1837, aged 68 years. Janet Houston his wife, who died 25th Dec 1841, aged 58 years. Mary their daughter, who died in 1824, aged 8 years. 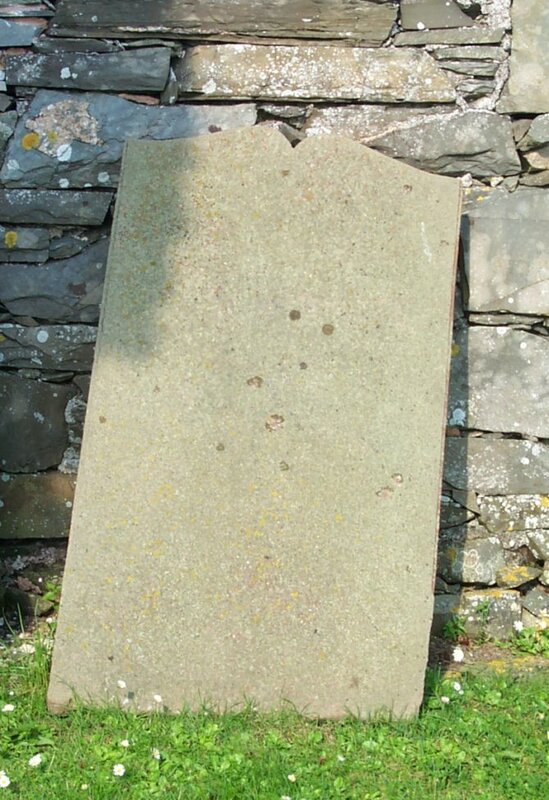 Mary their daughter, who died at Boatcroft in Balmaghie, 10th of August 1848, aged 23 years. 48 John Thomson their father, who died at Borgue Village, 18th March 1765, aged 80 years. 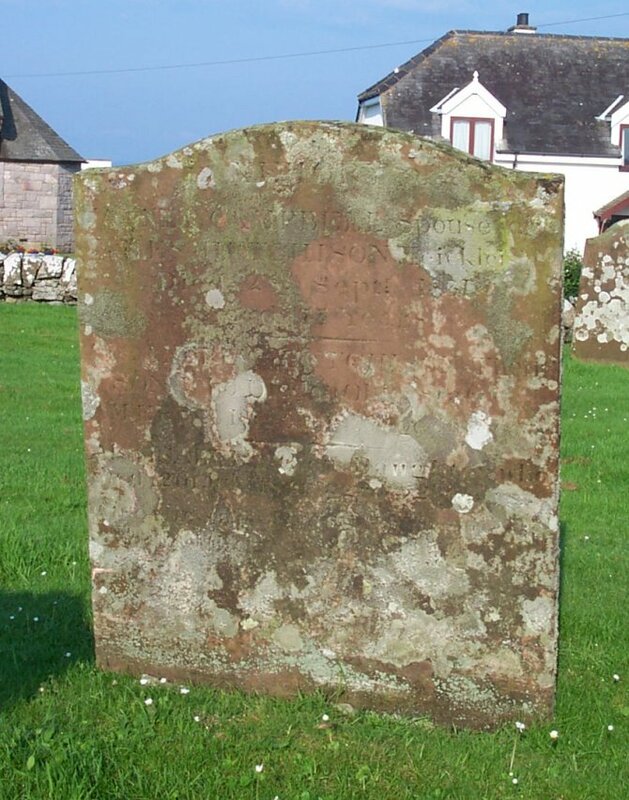 Also Margaret Martin, his spouse, who died 15th Oct 1747, aged 75 years. 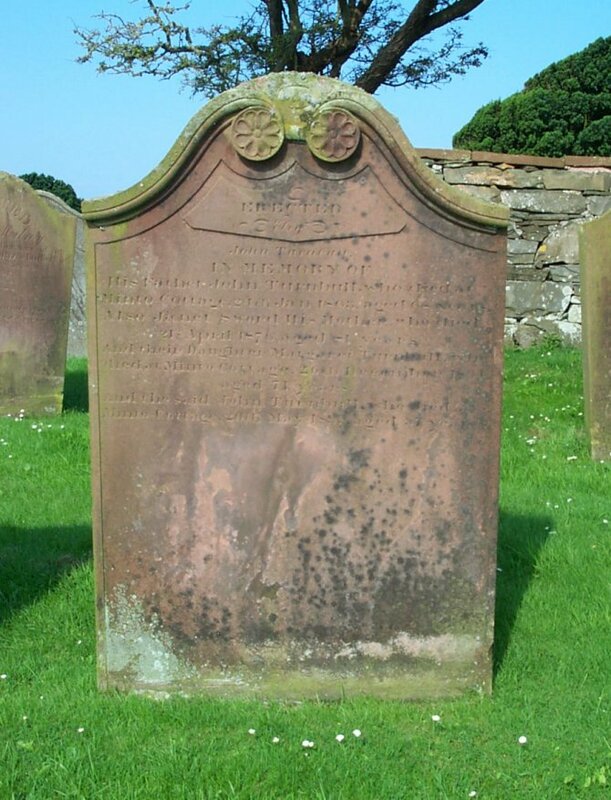 Also Samuel Thomson their son, who died in Gatehouse of Fleet, (piece missing) July 1801. Also Mary Brown his spouse, who died 22nd Janr’y 1808 aged 76 years. 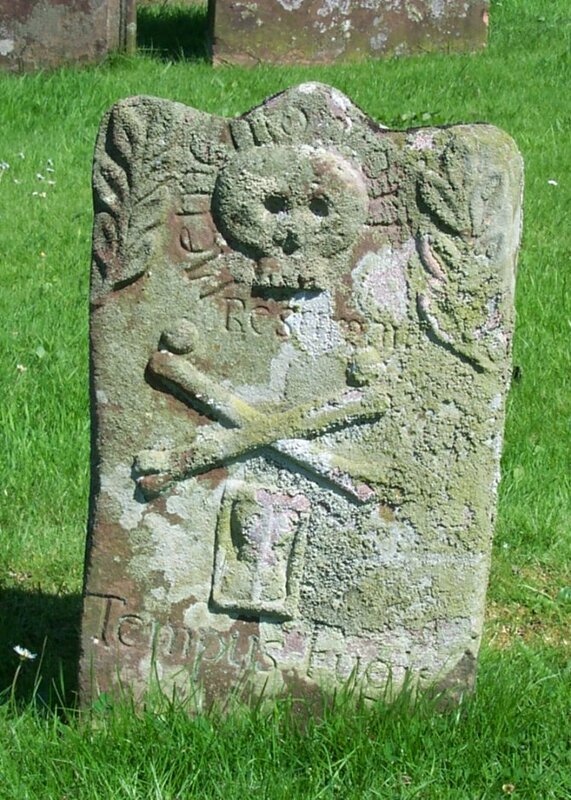 49 Here lyse the corpse of Jannet Thomson, daughter to John Thomson at Plounton Milln, who died Jan’y 12th 1760, aged 4 years. 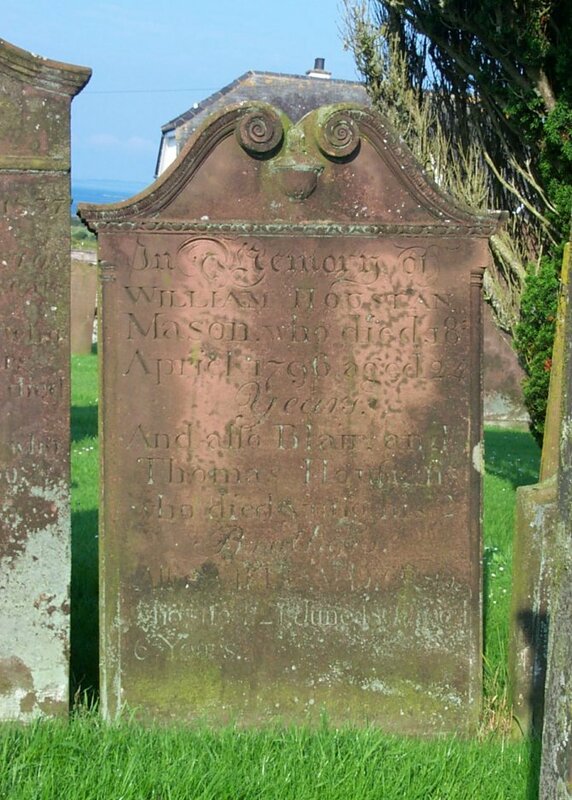 Here lys the corps of Janet Claerk, spouse to the abov, who died March 26th 1763, aged 43 years. 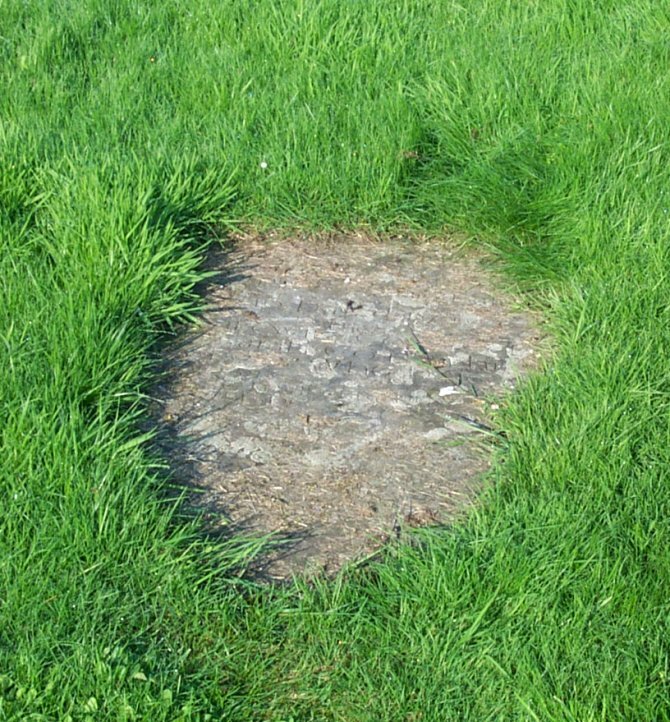 Also here lies the corpse of the s’d. 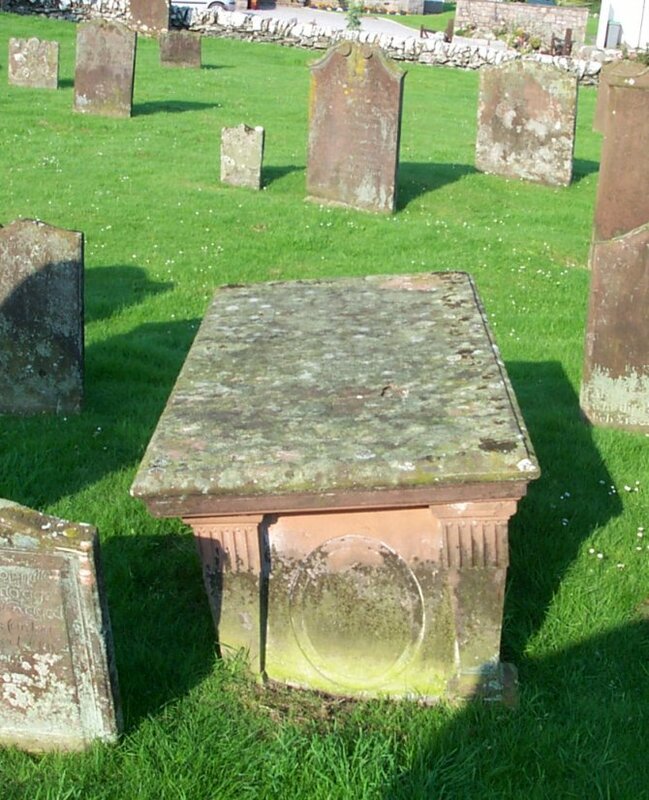 John Thomson, who died Agust 12th 1797, aged 81 years. 50 Erected by James McMonies, Park of Tongland, in memory of his spouse, Marg’t Thomson, who died 6th Dec’r 1824, aged 62 years. Also the said James McMonies, who died at Park, on the 2d May 1834, aged 84 years. 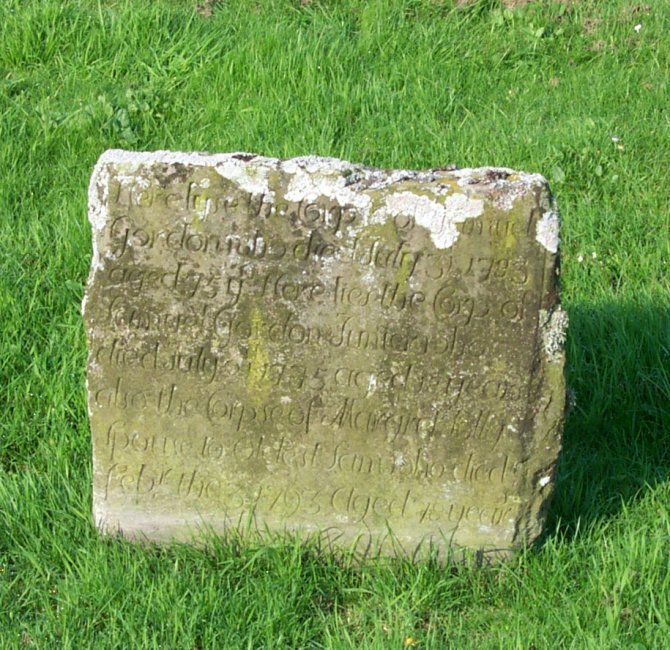 51 (Front)Erected by James McMonies in memory of his son William, who died in Nunton, 25th March 1790, aged 5 years. Also his daughter Mary, died 27th March 1790, aged one year. Also Mary, died 15th Dec’r 1973, aged 2 years. And also Mary, died 20th Jan'ry 1813, aged 11 years. 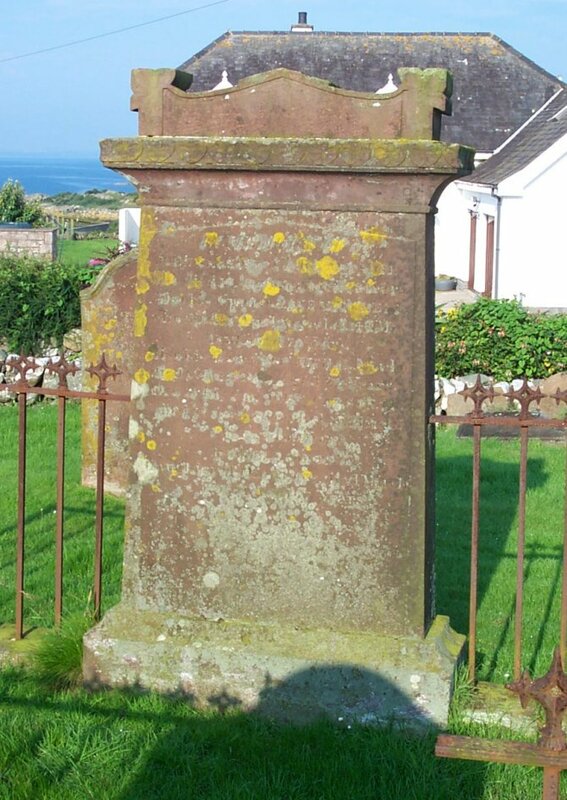 52 Erected in memory of Alexander, son of Samuel McMonies, who died in Barlocco, 23rd July 1820, aged 3 years. Mary, his daughter, who died 12th Jan’y 1826, aged 10 years. Also the said Samuel McMonies, who died 14th Dec’r 1846, aged 63 years. Also Mary Rae, his spouse, who died at Castle Douglas, August the 23rd 1861, in the eightieth year of her age. 53 Here lyes the corpse of James Mc Brain, who died 1706, aged 61 years. 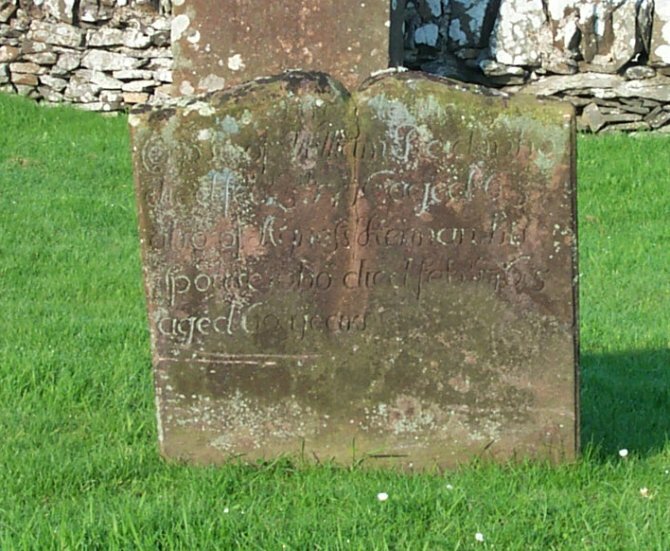 Likewise the corpse of Margaret McRobert, spouse to the said James, died 1710 aged 74 years. 54 (Front) In memory of John Graham, who died at Millhouse, Kirkcudbright, 23d Oct'r 1830, aged 64 years. Also John his son, who died in Antigua, 20th April 1828, aged 28 years. Also his wife Mary Sproat, who died at Mutt Hill Cottage, 7th Dec’r 1858, aged 95 years. 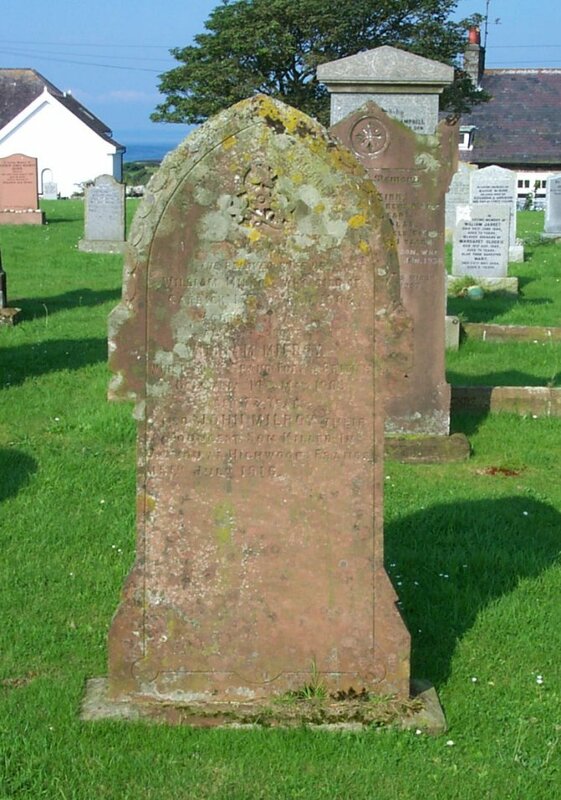 Also Barbara Graham his daughter, who died at Kirkcudbright, 10th Nov. 1880, aged 79 years; Also Hugh Graham, who died an Muiryard, 25th March 1882, aged 78 years. Also Mary Carson, wife of the above Hugh Graham, died at Upper Riddick, Rerrick,12th Jan’y 1889, in the 83d year of her age. 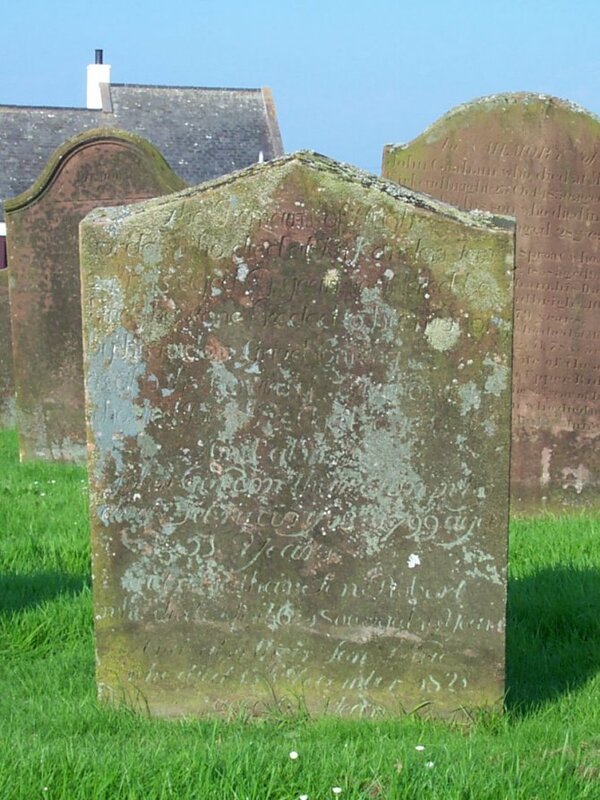 Also James their son, who died at Mid Boreland, Kirkcudbright, 15th June 1895, aged 57 years. Erected by B & E.A. Graham his daughters. (Rear) In memory of John Ritchie, who died at Kirkcudbright, 29th Dec 1900, aged 84 years. 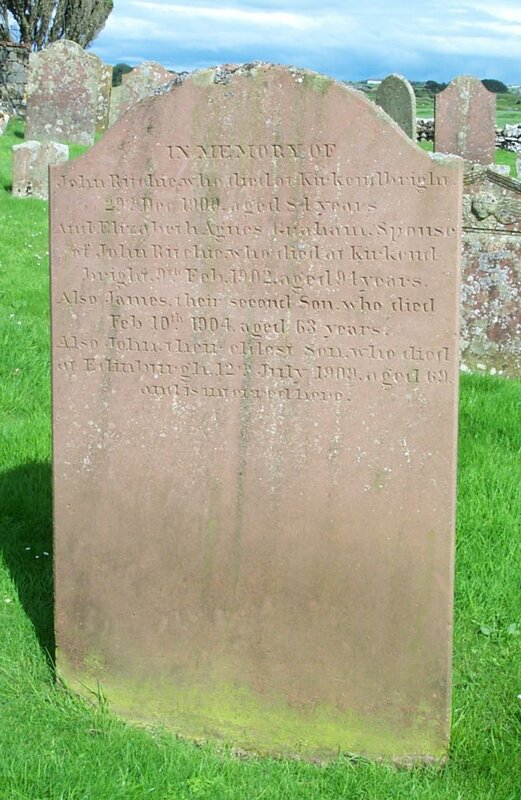 And Elizabeth Agnes Graham, spouse of John Ritchie, who died at Kirkcudbright, 9th Feb 1902, aged 94 years. Also James their second son, who died Feb. 10th 1904, aged 63 years. 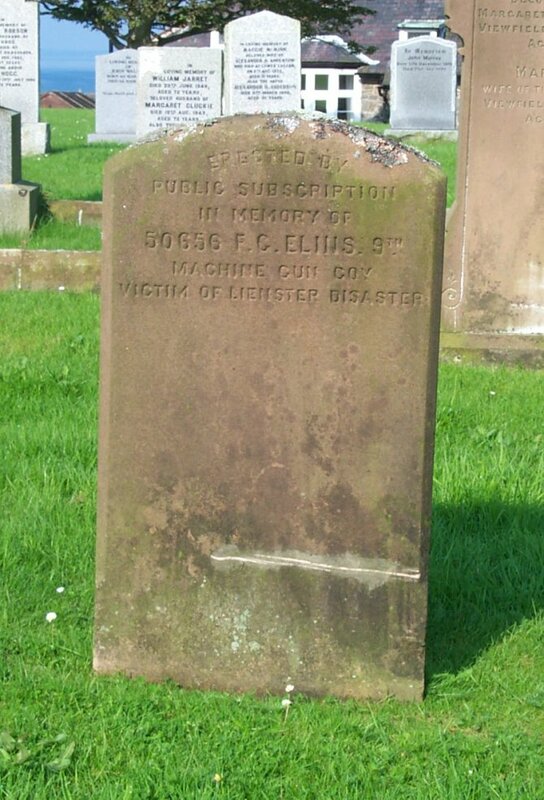 Also John their eldest son, who died at Edinburgh, 12th July 1909, aged 69 and is interred here. 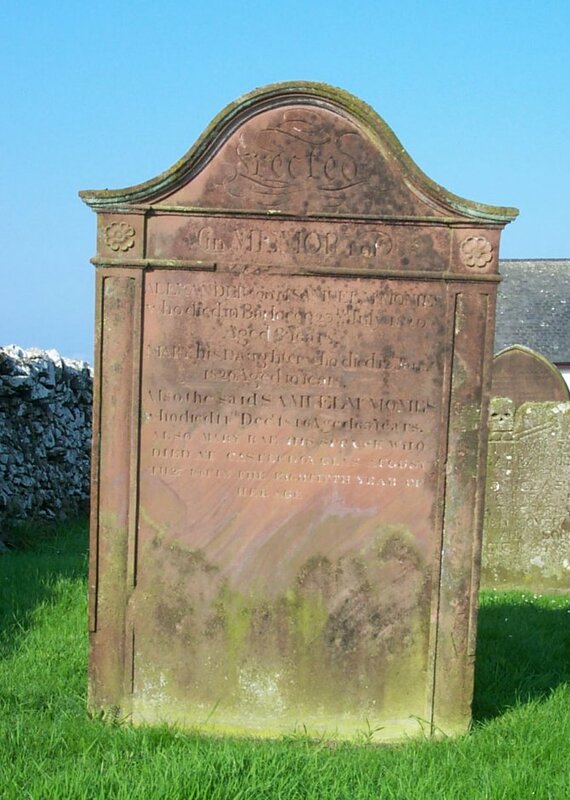 55 Erected by Agnes Houstan, in memory of her husband Andrew Arnot, who died at Kirkcudbright, 11th Feb’y 1821, aged 62 years. 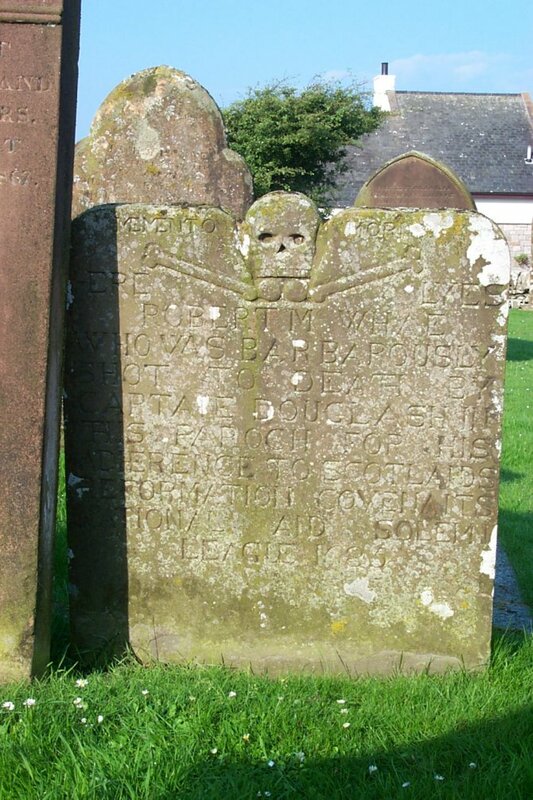 Also hir son David, who died at Kirkcudbright, 16th May 1822, aged 35 years. 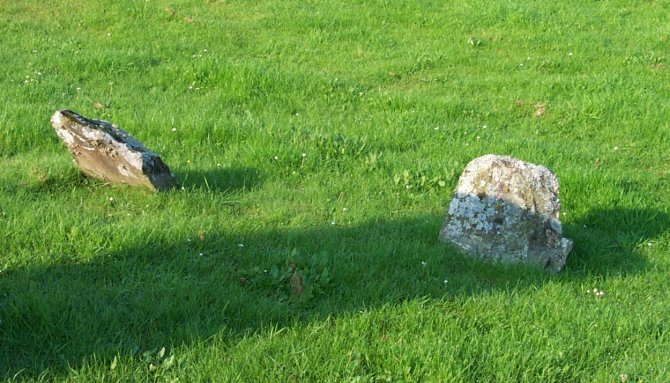 And two of her children, Agnes and Hugh, who died in infancy. Also the said Agnes Houstan, who died 26th Feb’y 1835, aged 81 years. 56 In memory of Hugh Arnot, who died in Carniehill, 30th Oct’r 1793, aged 60 years. Also Hugh his son, who died 27th Oct'r 1786, aged 16 years. 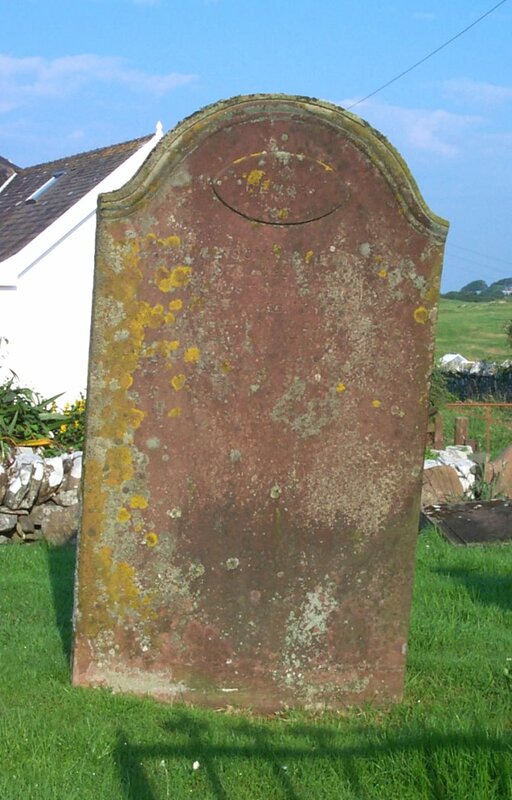 And of Jannet McKinnell, his spouse, who died 11th August 1816, aged 81 years. 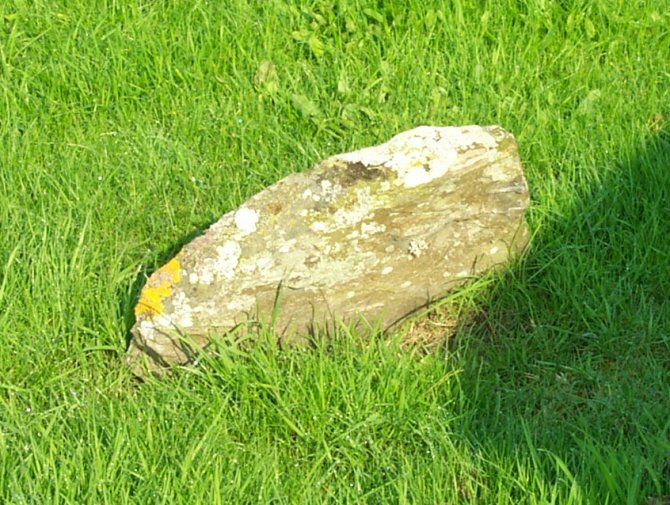 57 The remains of John Carson, who died at Little Carleton, Jan'y 27th 1761, aged 64 years, lies interred behind this stone. Erected by his spouse Elizabeth Rain. 58 Erected by Robert Grierson, in memory of Mary Porter his wife, who died in Kirkbride of Anwoth, 19th Dec’r 1834, aged 74 years. Also the said Robert Grierson, who died the 21st April 1838, aged 81 years. 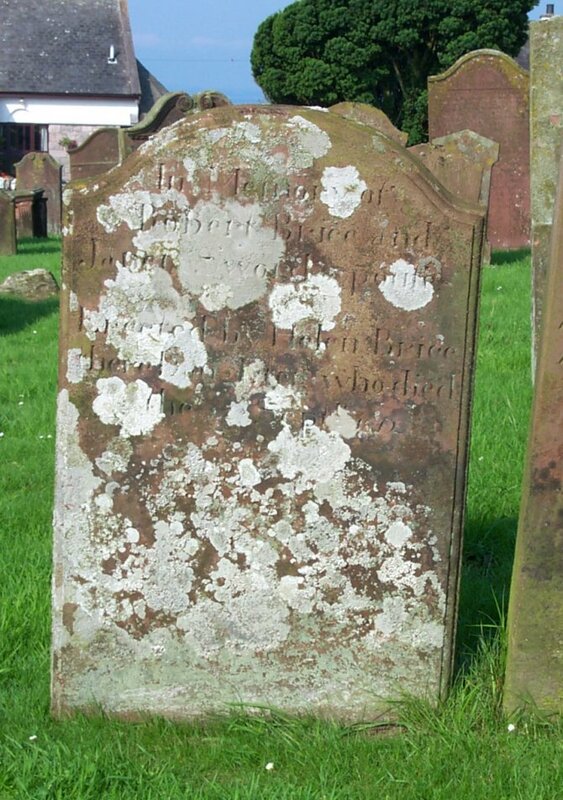 Also of their son Thomas, who died at Kirkbride of Anwoth, the 17th Febr 1847, aged 50 years. David Harper, his son-in-law, died at Pulcree, 26th Feb 1865, aged 57 years. 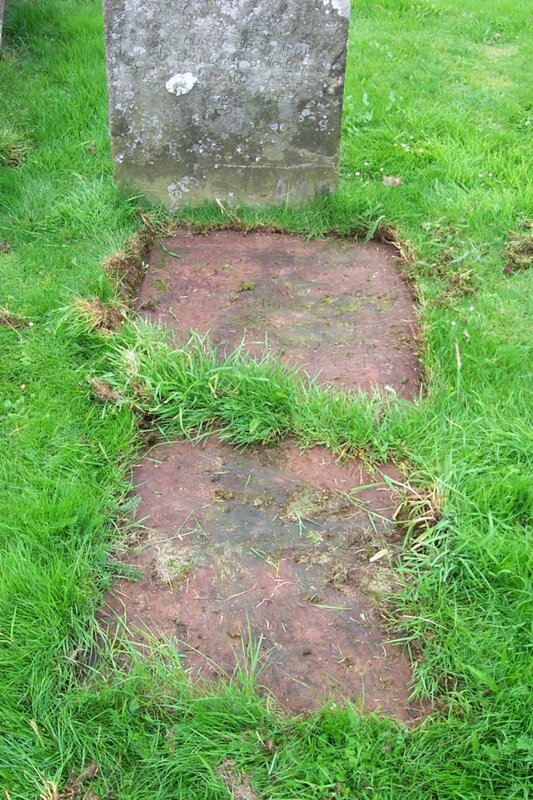 Also Grace Grierson, his wife, who died 29th April 1871, aged 77 years. 58a By D.R. Here lyes the corpse of John Rain, who dayed 1719. The likewise corpse of Sarah Cowan, his spouse, who dayed 1738. Also David Rain his son he died Dec’r 29 1755, aged 63. 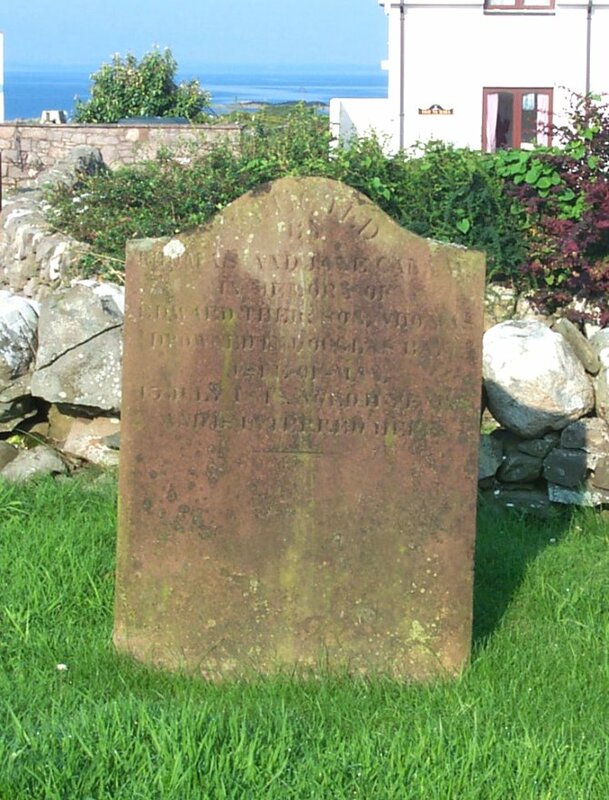 59 Erected by Anthony Gordon in Rattra, in memory of Margaret Conning, his spouse, who died Apriel 20th 1792, aged 34 years. Also Hugh Gordon, their son, who died 1st June 1813, aged 21 years. Also Grizel Gordon their daughter, spouse to James Smith, who died 15th June 1815, aged 26 years. 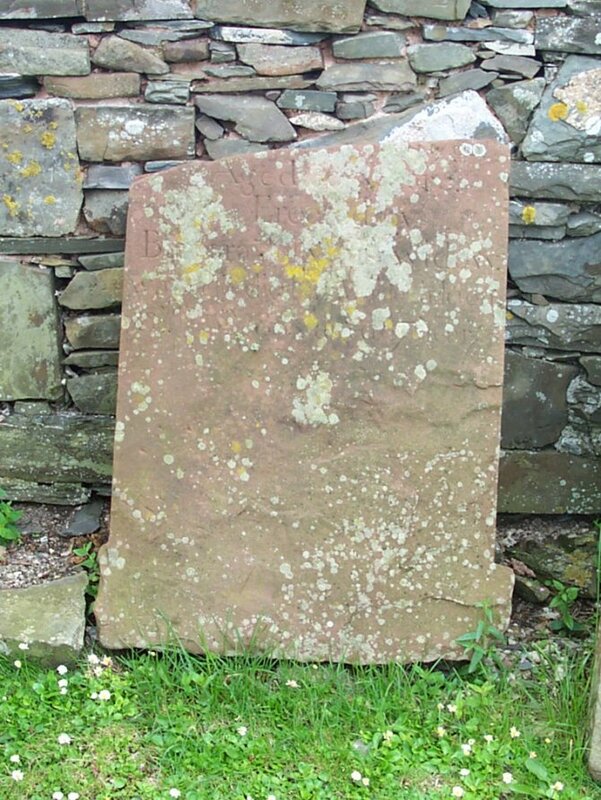 60 The remains of Hugh Gordon who died at Kirkanders, Jan’ry 24th 1775 aged 64 years, lies interred behind this stone. Erected to his memory by his widow Grizel Conning. 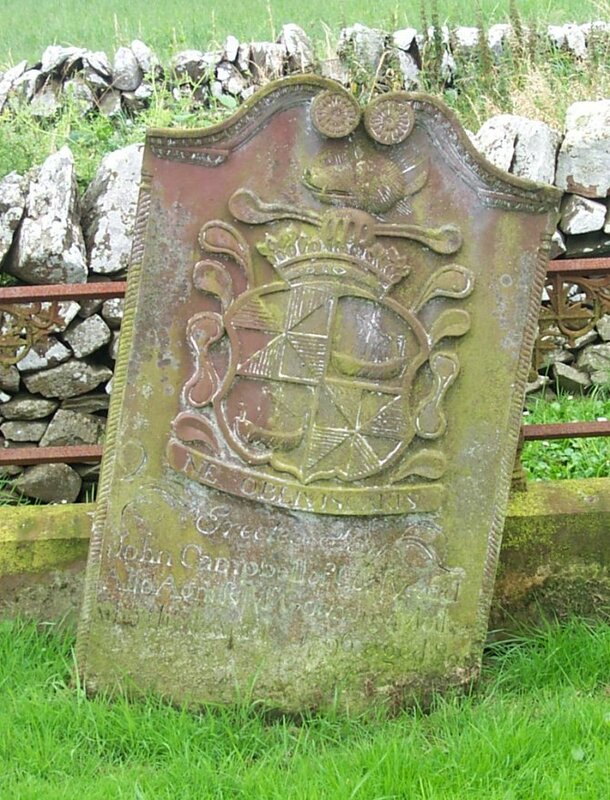 As also the remains of Grizel Conning, who died Dec. 11th 1788 aged 70 years. 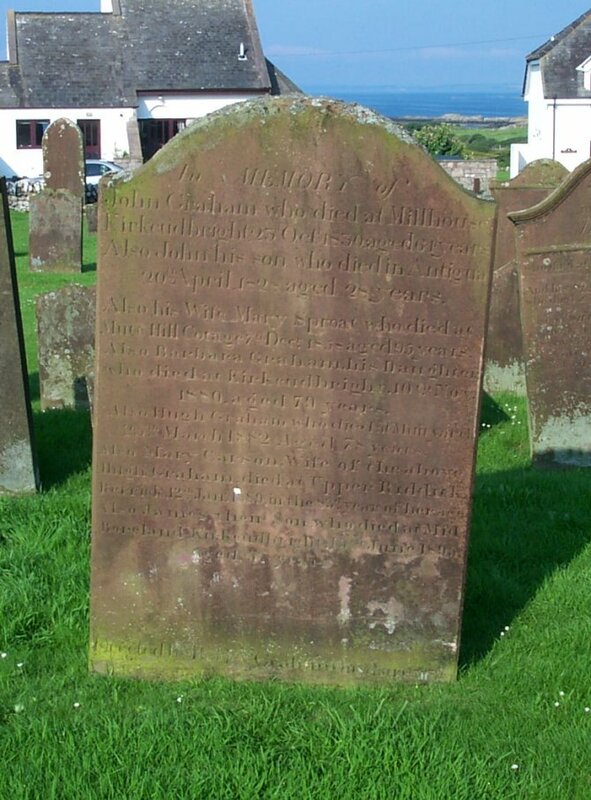 And also John Gordon their son, who died on February 13th 1799, aged 51 years. 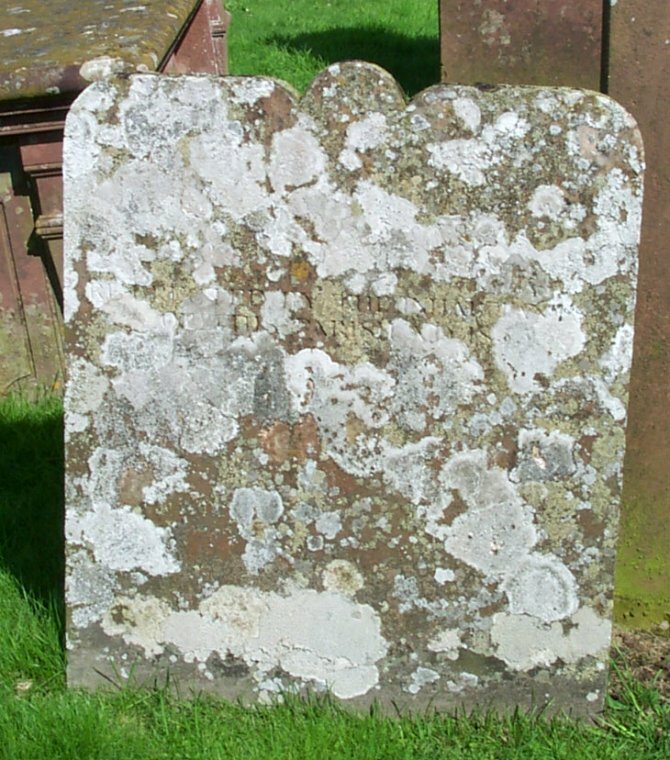 And also their son Robert, who died April 16th 1800, aged 49 years. And also their son David, who died 15th December 1821, aged 65 years. 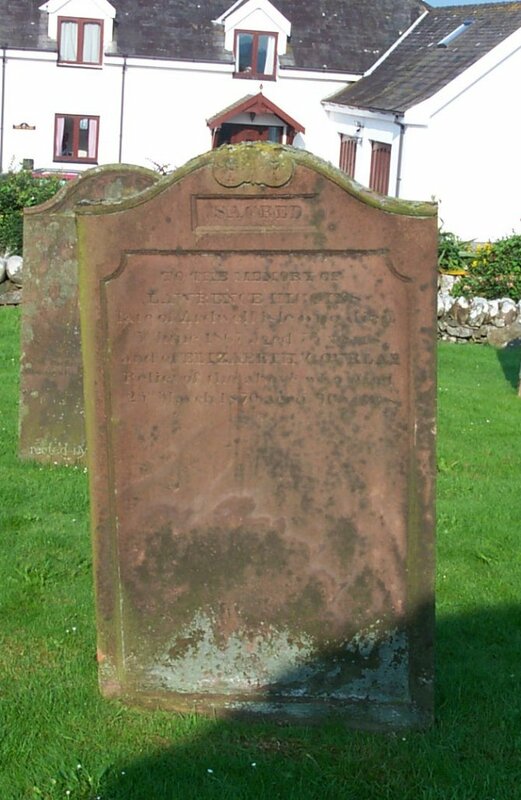 61 To the memory of Anthony Gordon, Esq., of South Carleton, who died 25th Aug’t 1827, aged LXXIX years. 62 Sacred to the memory of Mary Jolly, daughter of James Jolly & Willie Dalrymple, who died at Millpark of Auchenhay, 31st May 1839, aged 25 years and 6 months. James Jolly her father, who died at Auchenhay, 9th May 1853, aged 76 years. Alexander Jolly, his son, who died 13th January 1855, aged 39 years. Also Willie Dalrymple, spouse of the above James Jolly, who died at Millpark of Auchenhay, on the 8th August 1865, aged 83 years. 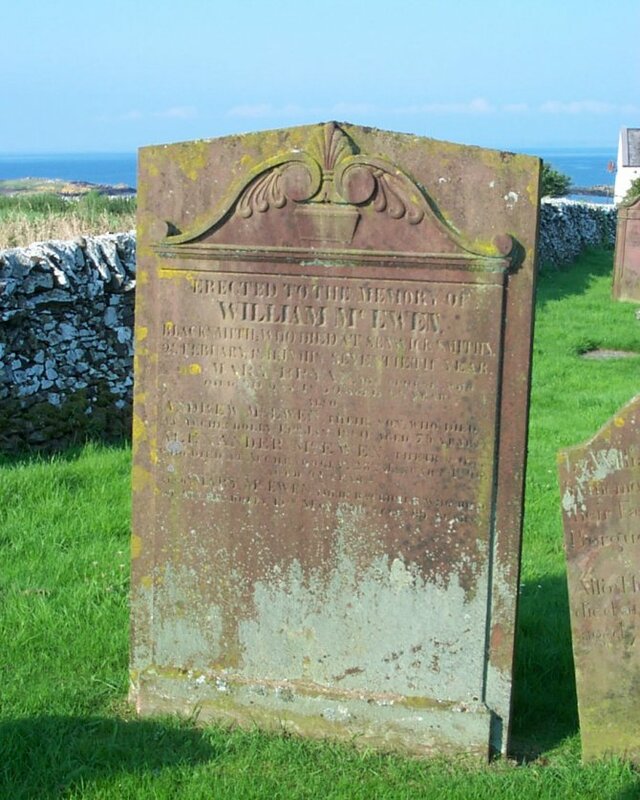 Also James Jolly, late miller in Kirkandrews, who died 5th Oct 1868, aged 54 years. Robert Baxter, his son-in-law, who died at Borgue Village, 3rd April 1884, aged 30 years. 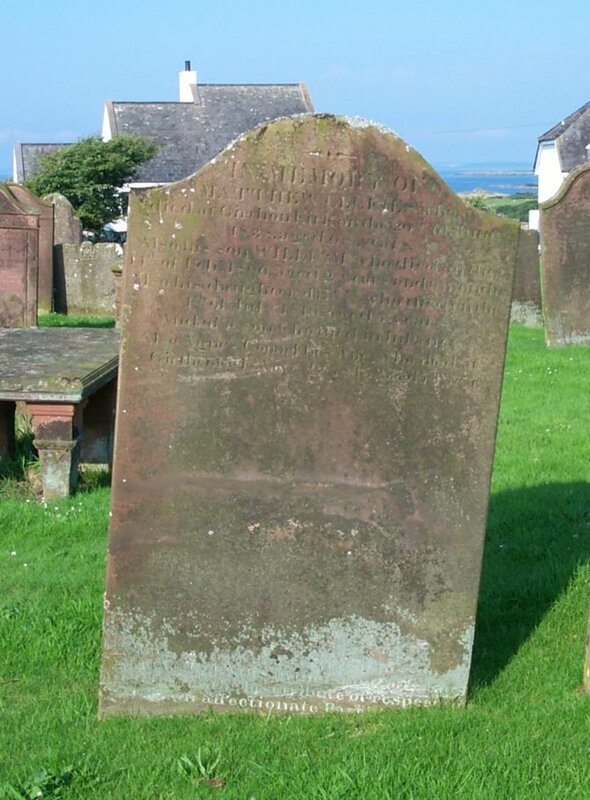 Also Mary Caesar, wife of James Jolly, miller, who died in Kirkandrews, 22nd Feb 1896, aged 86 years. Also Mary Baxter, daughter of the said Robert Baxter, who died at Kirkandrews, 30th Jan 1898, aged 20 years. 63 Here lyse the body of John Jolly, late in Barness, who died the 11th of Nov. 1777, aged 70 years. 64 To the memory of Henry McCulloch Esq, of Glenquicken, son of David McCulloch Esq, of Torhousekie, and great grandson of David Thomson Esq, of Ingliston. who died at Knockbrex. 14 March 1851. aged 37 years. Died at Harragate on the 15th Feb 1857, Elizabeth, third daughter, aged 12 years and four months. 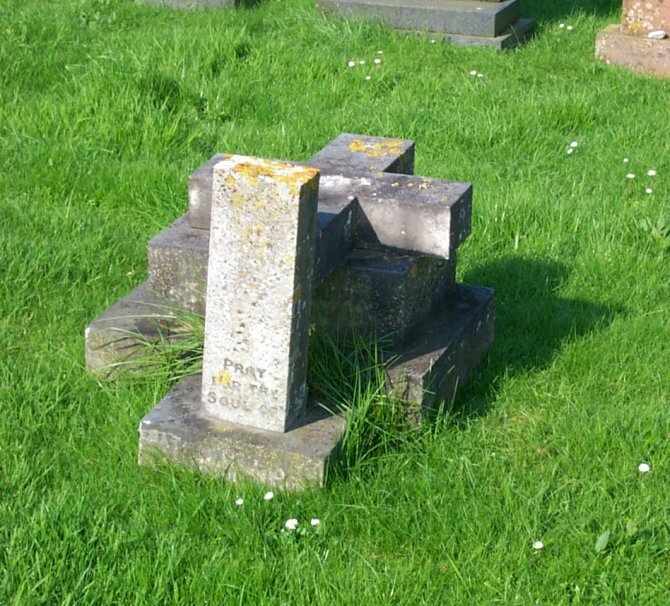 Died at Valleyfield, 2nd November 1890, Jane Elizabeth Cameron, his widow, aged 78 years. Died at Hong Kong, 30th June 1891, David, eldest son, aged 48 years. Margaret, eldest daughter of Henry McCulloch, who died at Valleyfield, 7th Sep 1910, aged 71 years. William his son, who died at Kansas, America, 1st January 1912, aged 66 years. Henry his youngest daughter, who died at Valleyfield, 14th March 1913, aged 61 years. 65 To the memory of David Thomson Esq, of Ingleston, who died at Knockbrex, AD MDCCXCVI. And of Margaret Nemure, his spouse, who died AD MDCCLXXXV. Elizabeth Thomson their daughter, died AD MDCCLXXV. 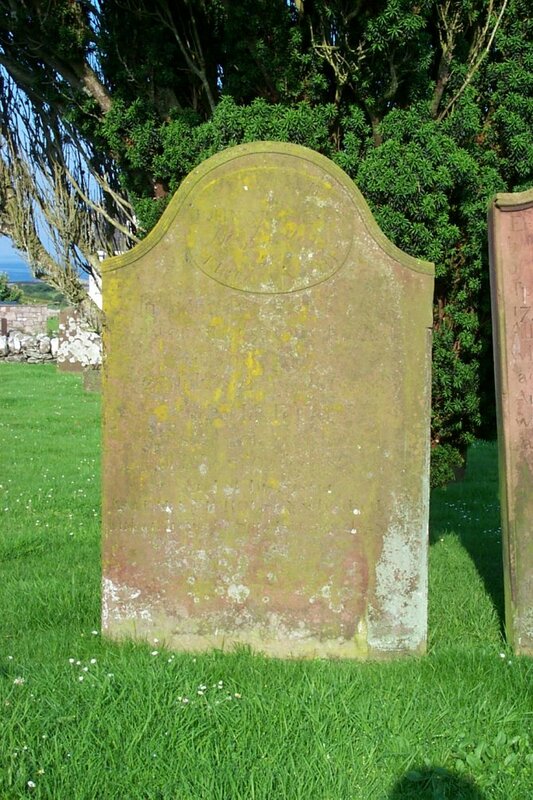 Samuel Thomson, their son, died AD MDCCCXX.. Adam Thomson Mure Esq, of Muncraig, their son, died AD MDCCCXXII. Mary Thomson their daughter, died AD MDCCCXXIV. 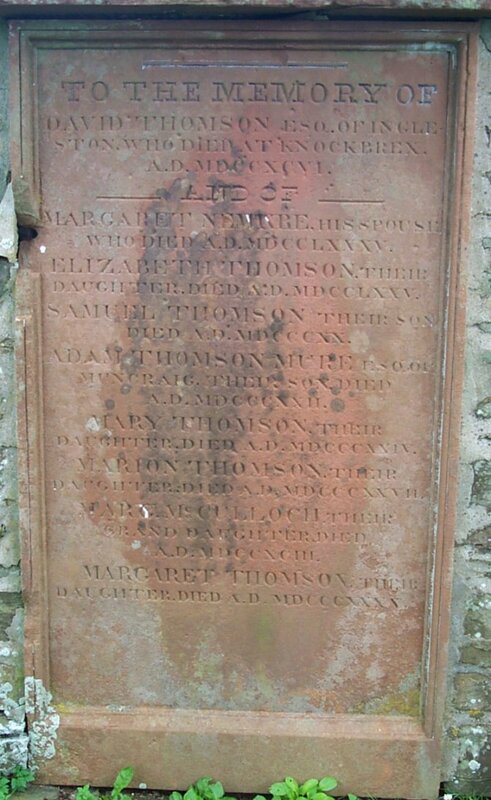 Marion Thomson their daughter died AD MDCCCXXVII. Marg (changed to Mary) McCulloch, their grand daughter, died AD MDCCXCIII. Margaret Thomson their daughter died AD MDCCCXXXV. 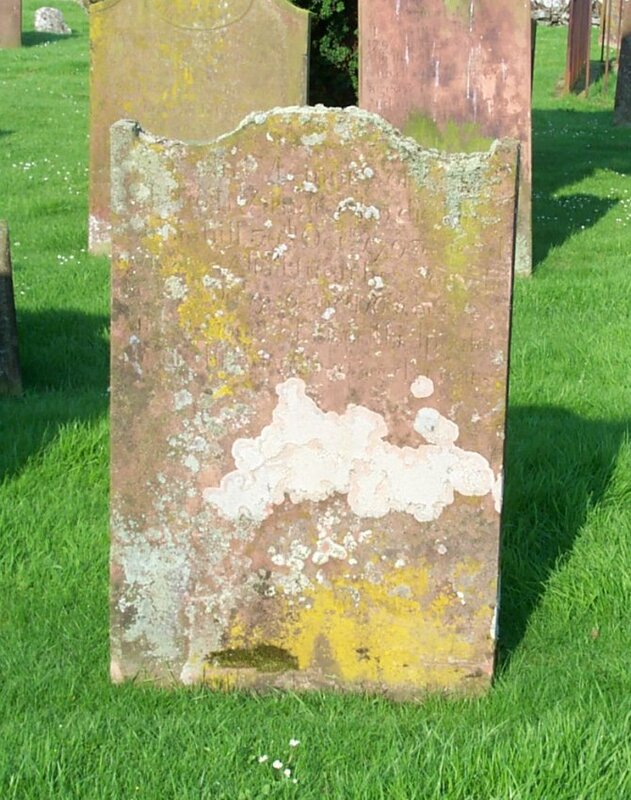 66 Here lyes Margaret McClure, spouse to John Pain, who died Feb'y 15th 1764, aged 46 years. 67 Erected by Agnes Clanachan, in memory of her mother Agnes Payne, who died at Borgue Village, 16th Nov. 1867, in her 80th year. Also Agnes Clanachan, her daughter, who died at Borgue Village, 18th Dec’r 1914, aged 93 years. 68 (Front) Erected by Samuel Taggart, sen'r, in Gatehouse, in memory of his father Samuel Taggart, who died 12th of March 1779, aged 67 years. 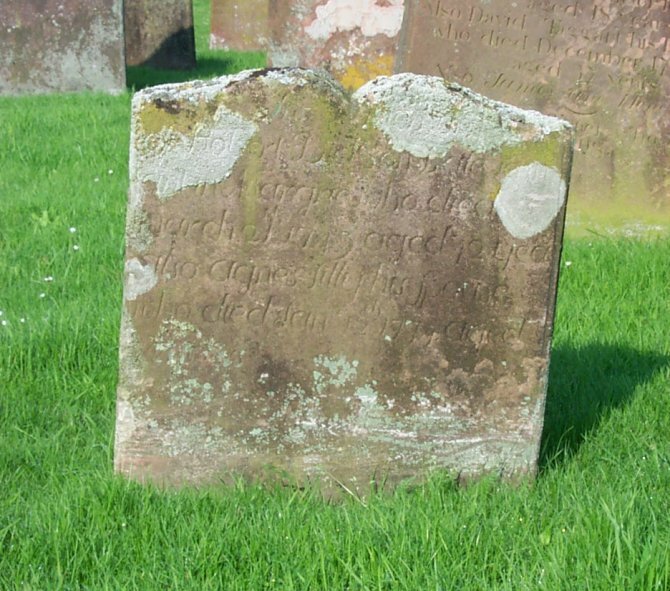 Also Jennet Meen, his mother, who died September 16th 1781, aged 67 years. 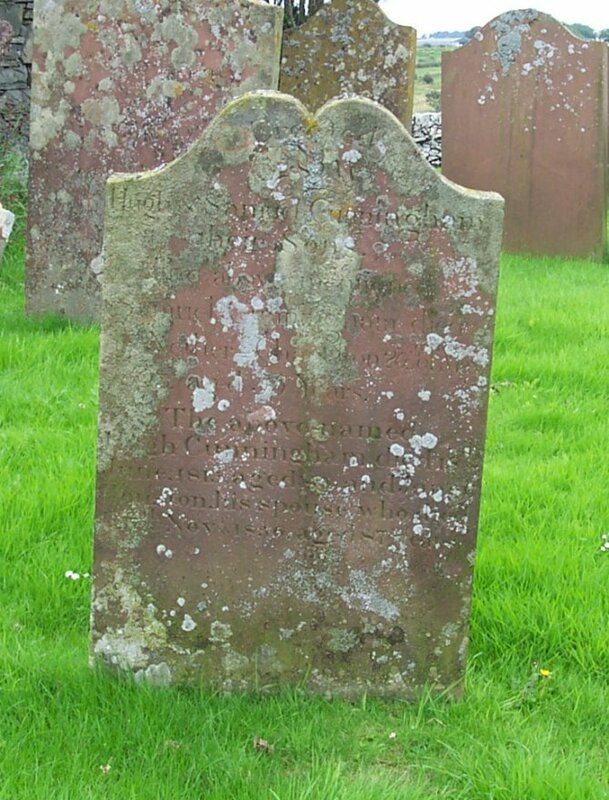 Also James Taggart, his brother, who died December 16th 1775, aged 18 years. 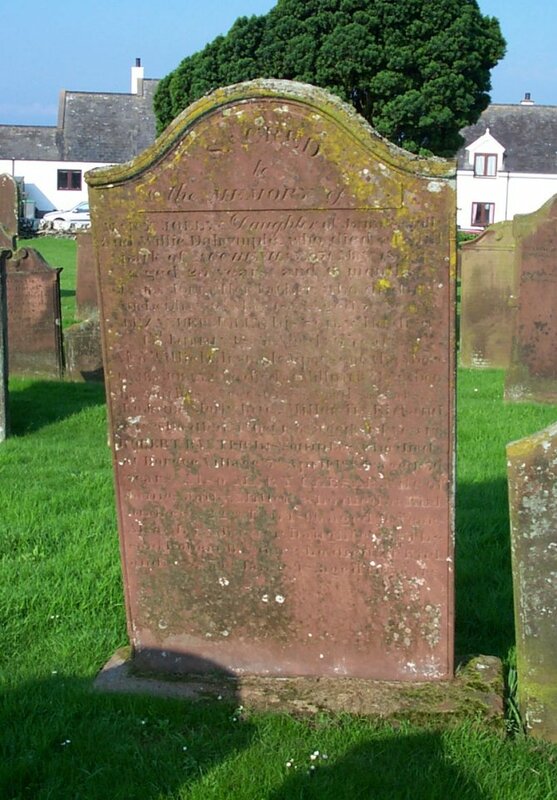 Also David Taggart, his brother, who died December 17th 1777, aged 37 years. 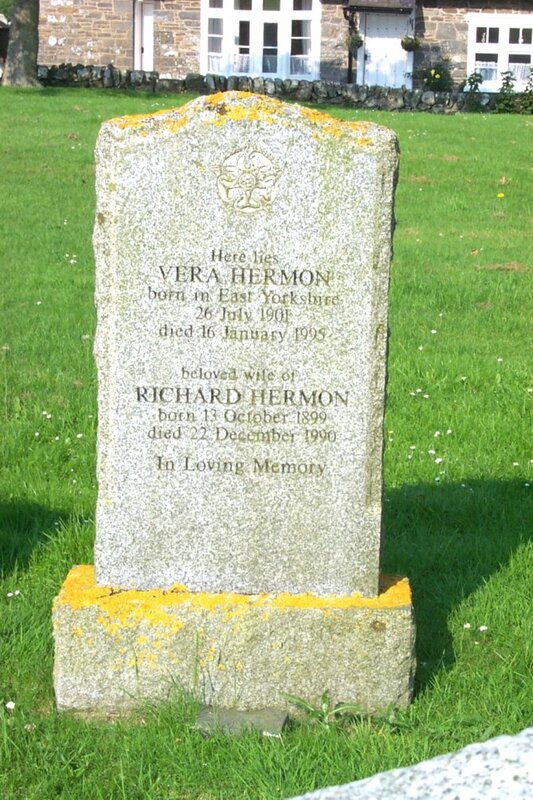 Also James and Henrietta, his brother and sister, who died young. 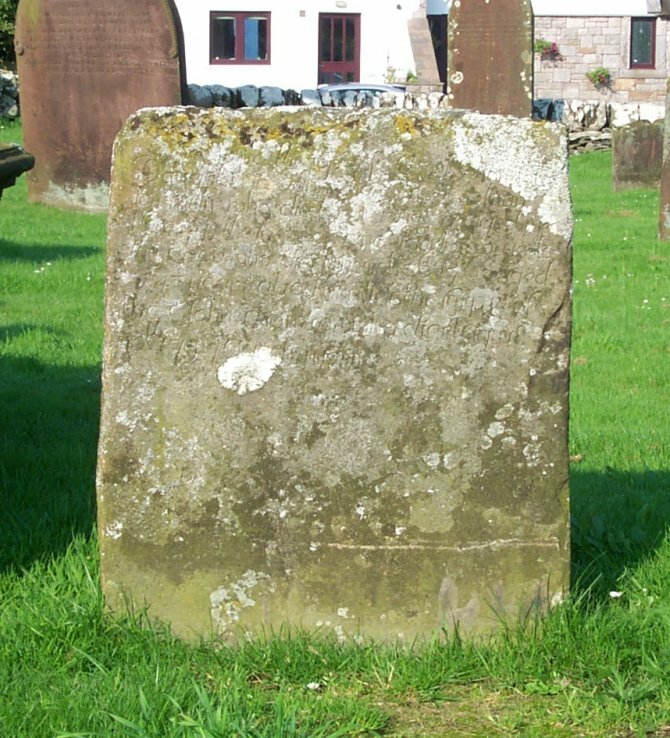 (Rear) Samuel Taggart, the erector of this stone, died in Gatehouse, 20th of June 1830, aged 79 years. 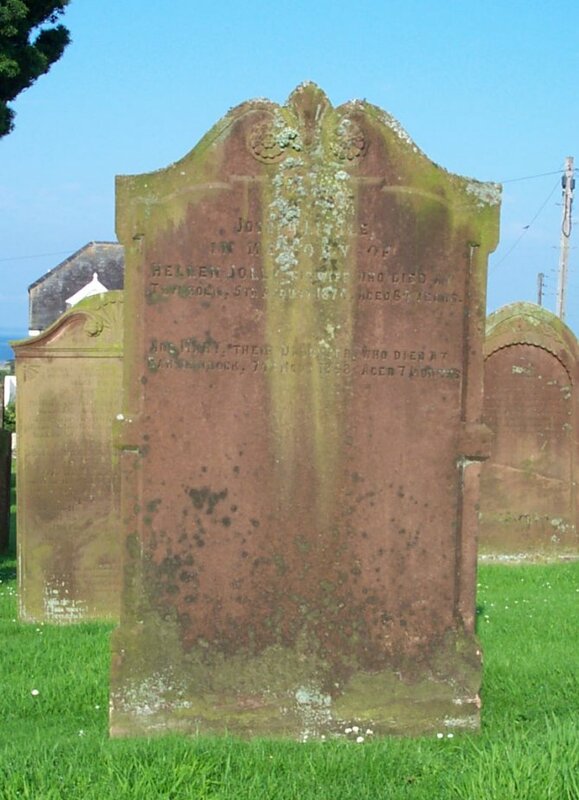 Also Margaret McClure, his spouse, died 9th January 1860, aged 99 years. 69 In memory of Samuel Taggart, who died at Carleton, on the 14th Aug’t 1819, aged 23 years. Also James Taggart, who died 29th April 1851, aged 62 years. Also Isabella Taggart, who died at Borgue Village, 7th Nov’r 1877, aged 89 years. 70 In memory of Robert Dickson, late tennant in Margrie, who died March 24th 1749, aged 42 years. 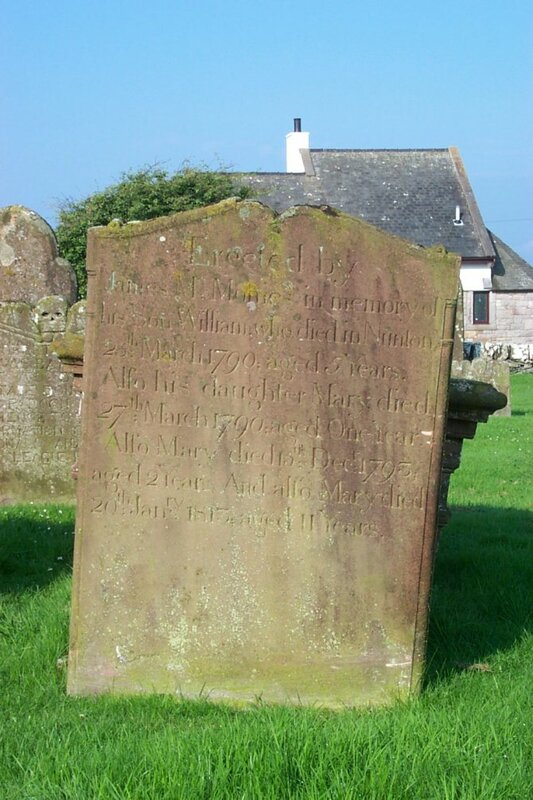 Also Agnes Jilly, his spouse, who died Jan’y 12th 1774, aged 72 years. 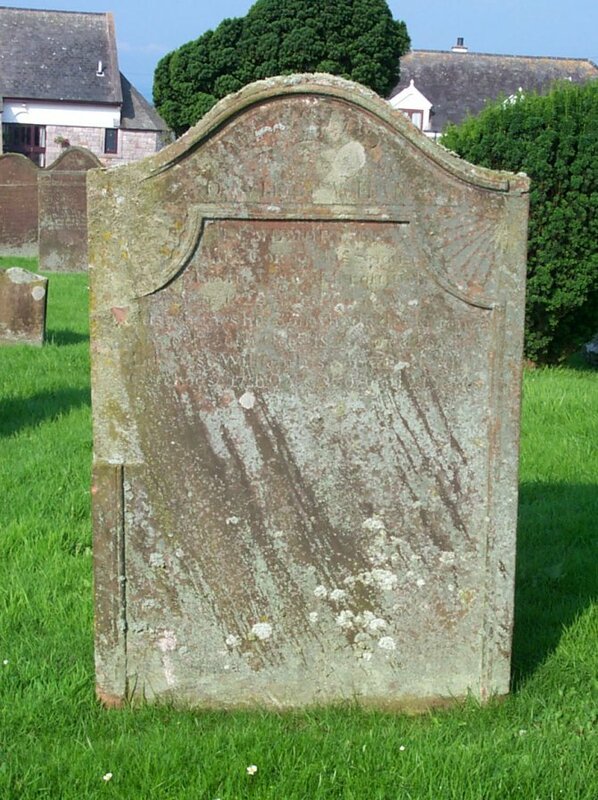 71 Here lies ye body of Robert McConnell, who died Jan’y 3 1744, aged 61, & Jean Kissock his spouse, who died Jan 1st 1756, aged 68. Also the corps of James McConnell, their son, who died Dec’r 29 1775, aged 58 years. As also Grizel Porter, his spouse, who died 21st Nov’r 1803, aged 73 years. 72 Erected by William McConnell, in memory of Isabel McKittrick, his spouse, who died 7th March 1814, aged 41 years. Also Grizzel McConnell their daughter, died 26th April 1813, aged 18 months. Likewise two of their children who died in infancy. Also his son James, who died on the 24th June 1837, aged 14 years. Also of the above William McConnell, who died on the 18th of July 1845, in the 87th year of his age. 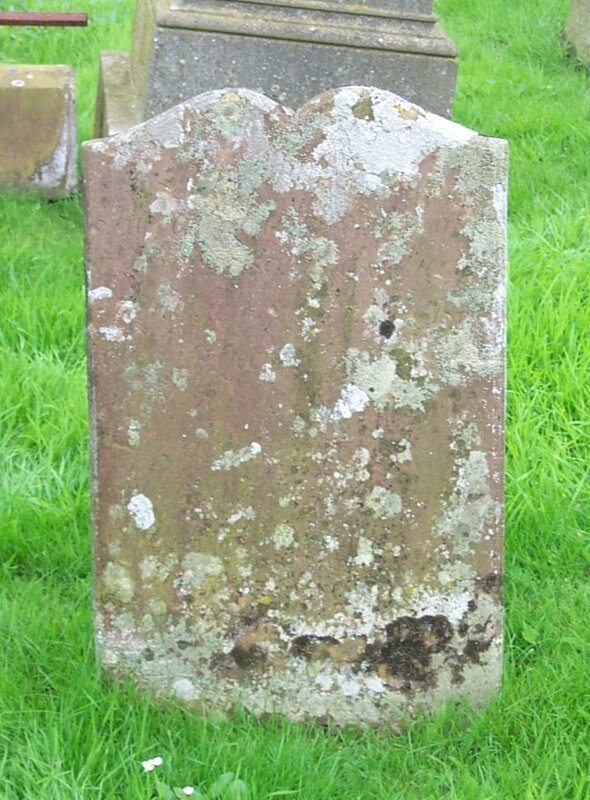 Also Isabella Brown, wife of the above William McConnell, who died at Tounge Croft, on the 28th of June 1854, aged 72 years. 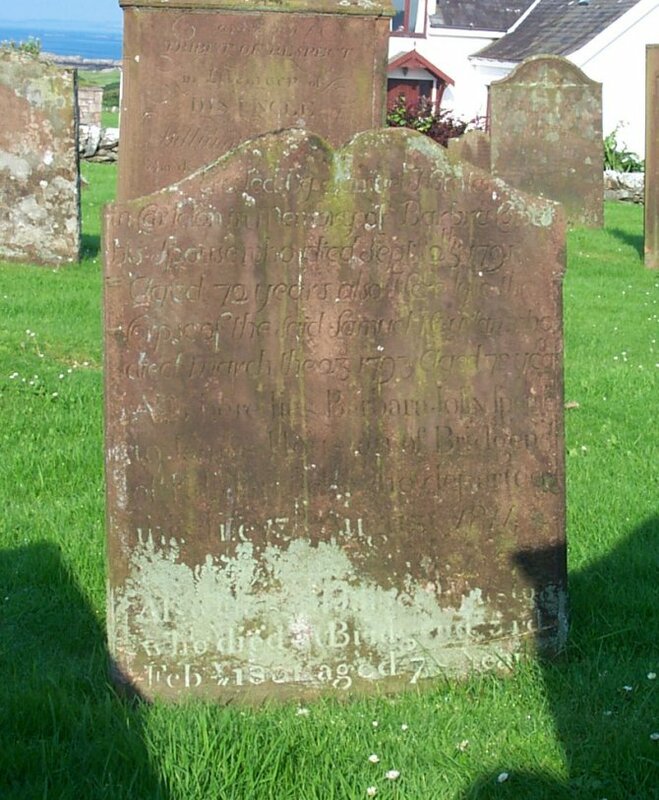 73 In memory of Matthew Clukies, who died at Girthon Kirk on the 20th of June 1838, aged 68 years. 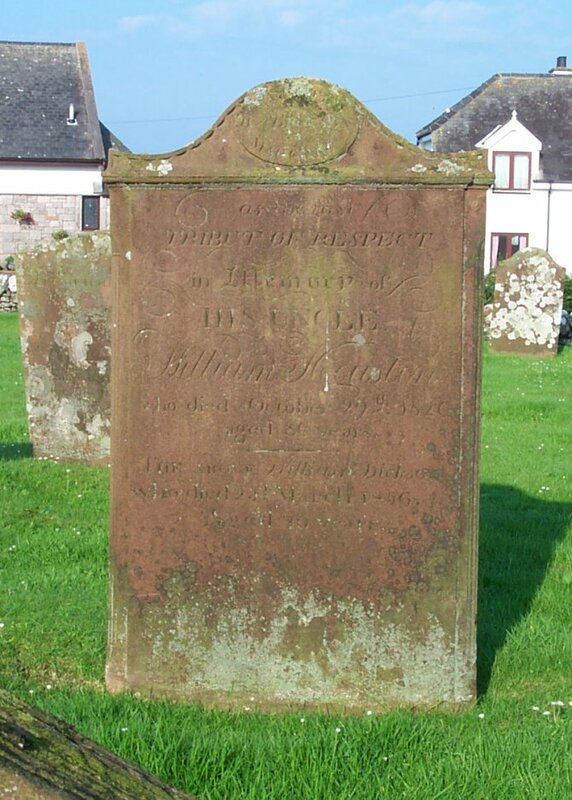 Also his son William, who died on the 14th of Feb’y 1806, aged 2 years and 6 months. Also his daughter Jean, who died on the 4th of July 1819, aged 7 years. And of a son who died in infancy. 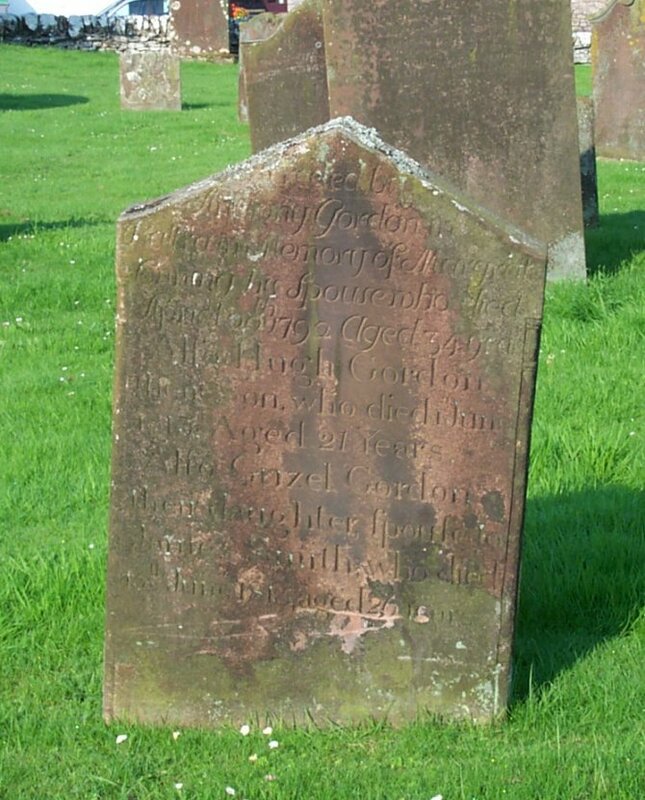 Also Agnes Connell his wife, who died at Girthon Kirk, Nov’r 22 1845, aged 74 years. 75 In memory of Agnes Campbell, spouse to Hugh Bryce, who died in South Carleton, 17th of Nov’r 1828, aged 68 years. Hugh Bryce, her husband, died 15th April 1850, aged 80 years. Jennet Bryce, his daughter, died at Risk, 8th July 1863, aged 59 years. Grace Bryce, his daughter, died at Risk, 22d Feb’y 1888, in her 89th year. 77 (Front) 1799. 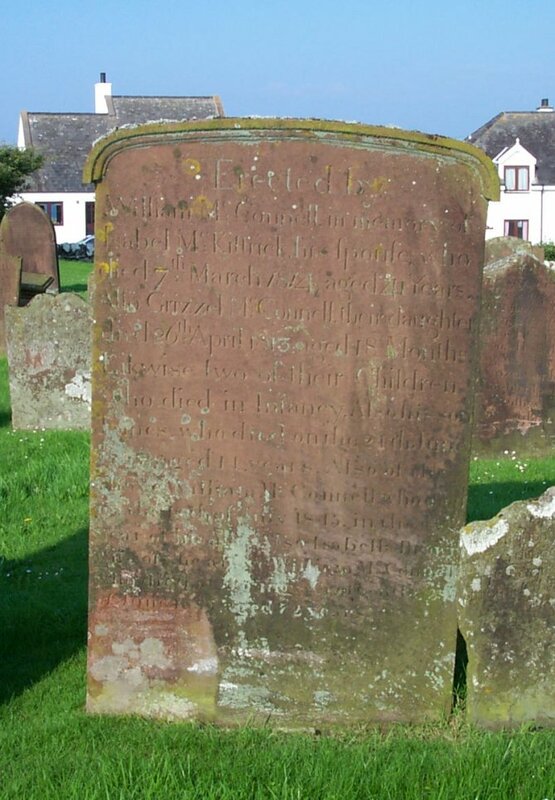 In memory of Samuel Cunningham, who died in Chapelton, Feb’y 8th 1775, aged 65 years. 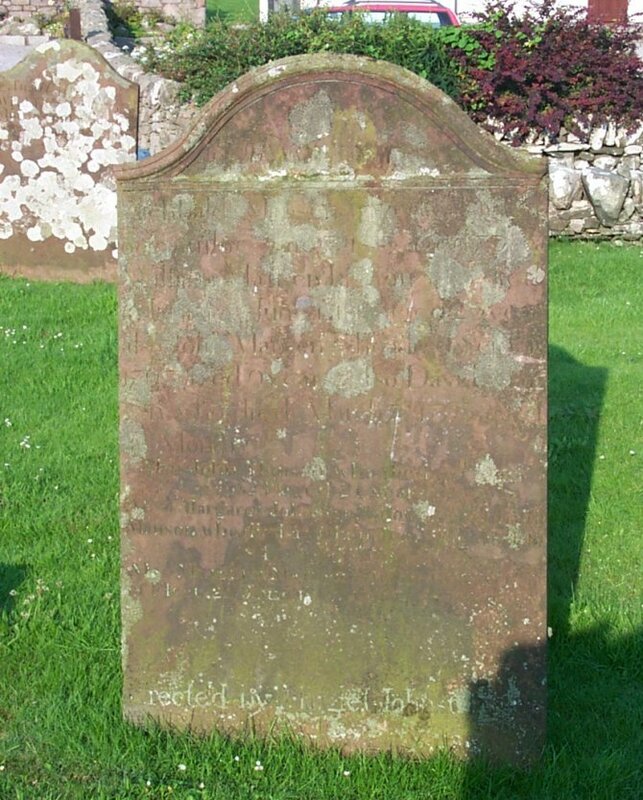 And of Mary McGhie, his spouse, who died May 21st 1786, aged 75 years. 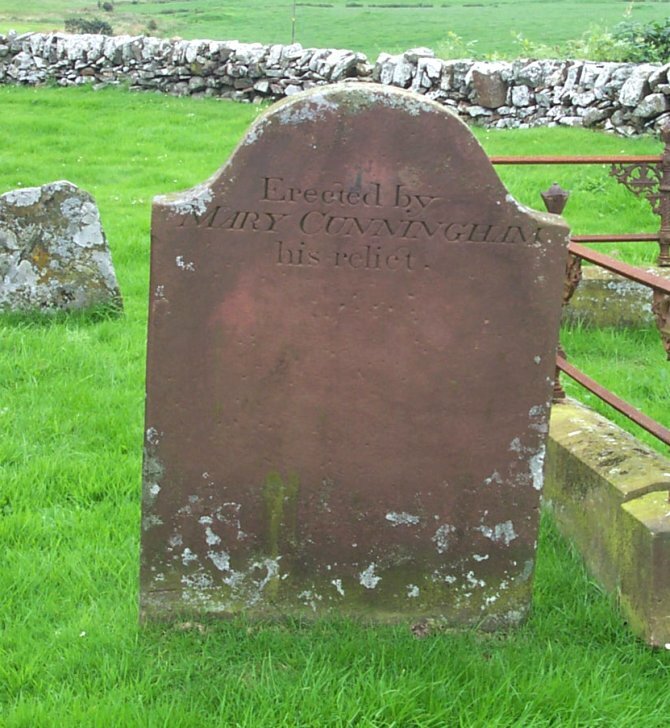 Also of James Cunningham their son, who died April 8 1767, aged 21 years. (Rear) Erected by Hugh & Samuel Cunningham their sons. 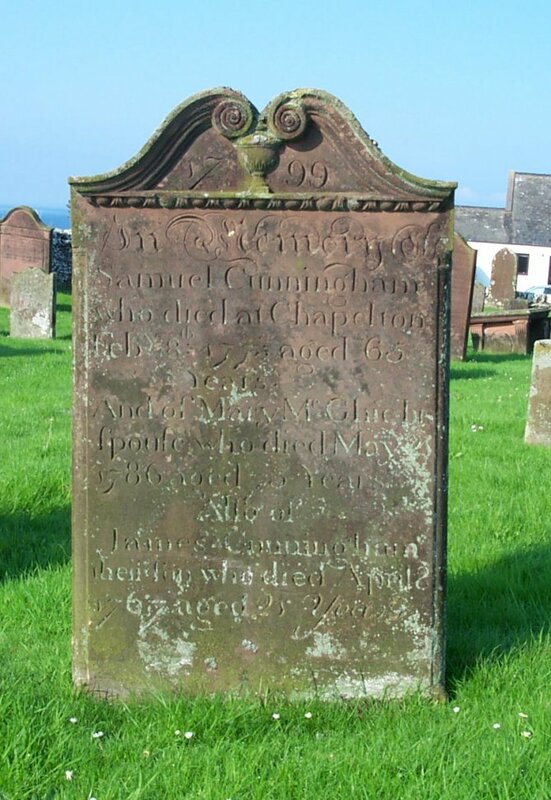 The above mentioned Samuel Cunningham, died in Nether Chapelton, 20th of May 1803, aged 55 years. 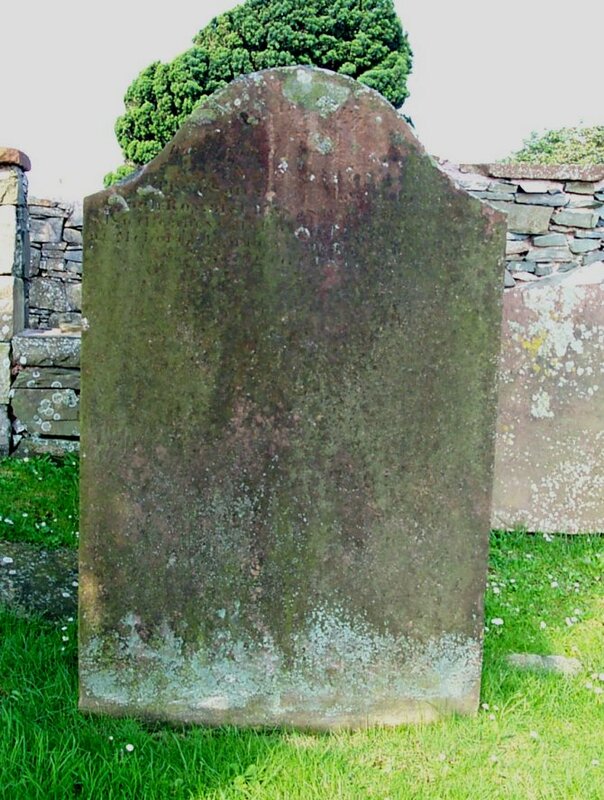 The above named Hugh Cunningham, died 18th June 1815, aged 80. And Janet Houston, his spouse, who died 27th Nov’r 1836, aged 87 years. 78 Erected by James Cunningham, in memory of his family, viz, Janet Brown his spouse, who died at Langdikeside, the 3d August 1825, aged 25 years. 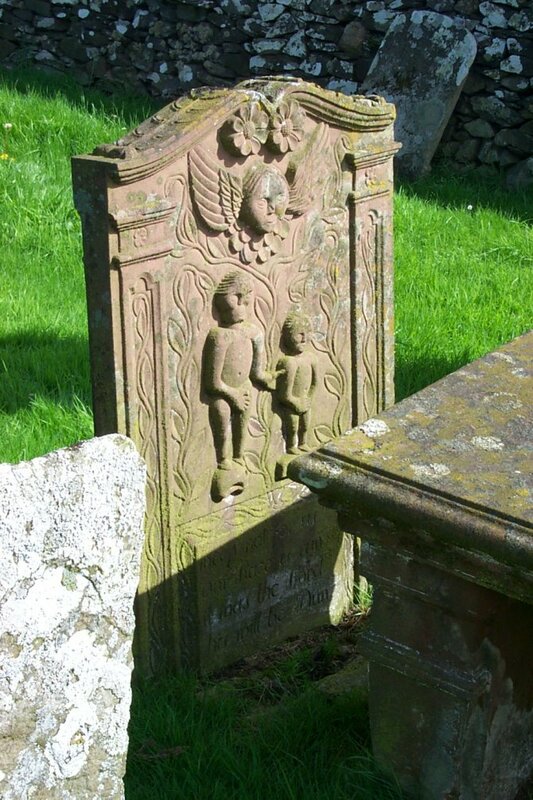 Mary, his daughter, who died at Leigh Chapelton, the 10th Sept’r 1821, in infancy. Hugh his son, who died at Leigh Chapelton, 26th Feb’ry 1824, aged 4 years. Also the above James Cunningham, who died at Langdikeside, 6th March 1826, aged 43 years. 79 Erected by William and James McEwan in memory of Alexander McEwan, their father, who died in Leigh Borgue, 17th November 1777, aged 36 years. Also Helen Jolly, his spouse, who died at Gatehouse, 20th March 1812, aged 72 years. 80 Erected to the memory of William McEwan, blacksmith, who died at Senwick Smithy, 28 February 1841, in his seventieth year. Also Mary Bryan, his spouse, who died 30 May 1859, aged 88 years. 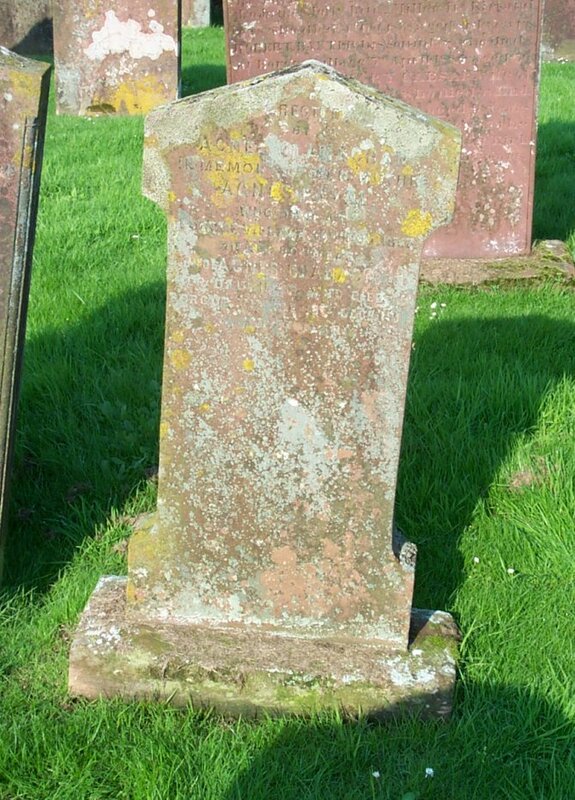 Also Andrew McEwen, their son, who died at Auchendolly, 15th Jan 1880, aged 75 years. Alexander McEwen, their son, who died at Auchendolly, 23rd January 1896 aged 94 years. Also Mary McEwen, their daughter, who died at Auchendolly, 15th May 1906, aged 95 years. 81 (Front) In memory of James Dickson, late tennant in Margrie, who died March 3rd 1761 aged 42 years. 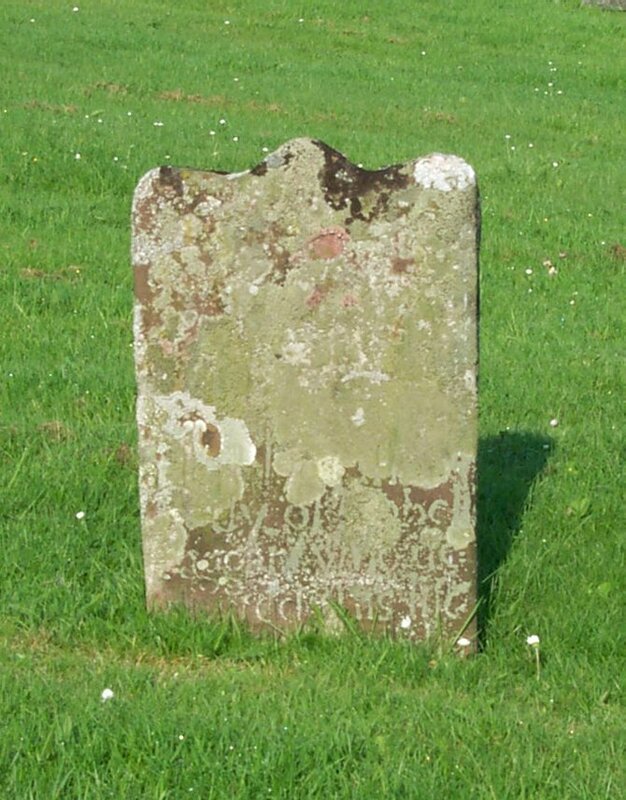 Also of Robert Dickson, his son who died Jully 24 1770, aged 19 years. (Rear) In memory of Robert Dickson, who died 17th Nov’r 1789, aged 9 years. Janet, who died 1st Ap’l 1801, aged 19 years. And John, who died 29th June 1807, aged 24 years. Children of John Dickson and Janet Houstan an Margrie. Also the said Robert Dickson, who died 2nd Oct’r 1816, aged 68 years. And Janet Houstan, his spouse, who died 2d Sept. 1835, aged 87 years. 82 Erected by John Campbell of Carseyeard. Also Agness McGown, my mother, who died April 1796, aged 80. 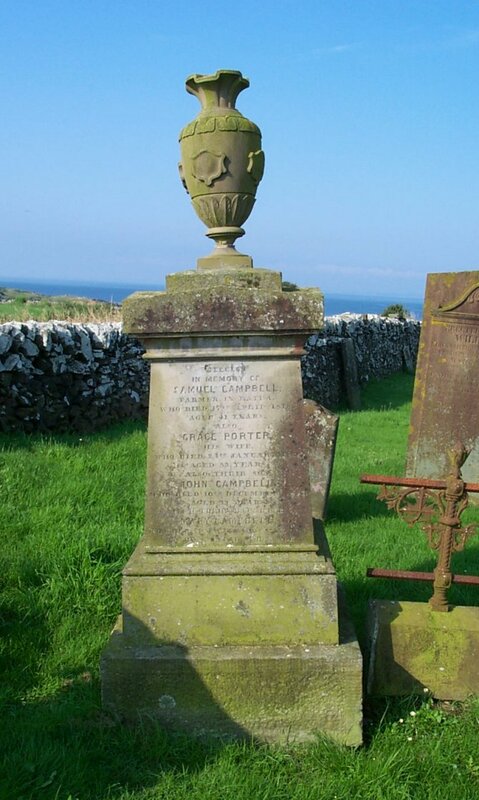 83 (North) Erected in memory of Samuel Campbell, farmer in Ratra, who died 17th April 1818, aged 41 years. Also Grace Porter, his wife, who died 24th January 1826, aged 53 years. Also their son John Campbell, who died 10th December 1837, aged 33 years. Also their daughter Mary Campbell, who died at Margarie, 8th May 1898, in the 81st year of her age. (West) Sacred to the memory of Samuel Campbell, son of the above Samuel Campbell, who died at Rattra, 22nd June 1876, aged 62 years. 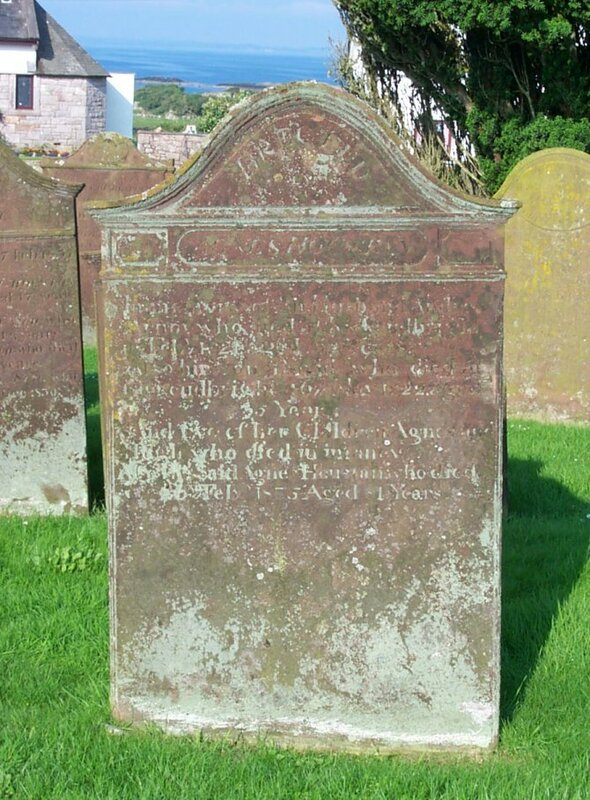 And Jane Dickson, his second daughter, who died at Castle Douglas (illegible) 1895 aged (illegible). Also Mary Campbell, his daughter, who died at Moat Brae Nursing Home, Dumfries, 30th June 1917, aged 41 years. Until the day break. 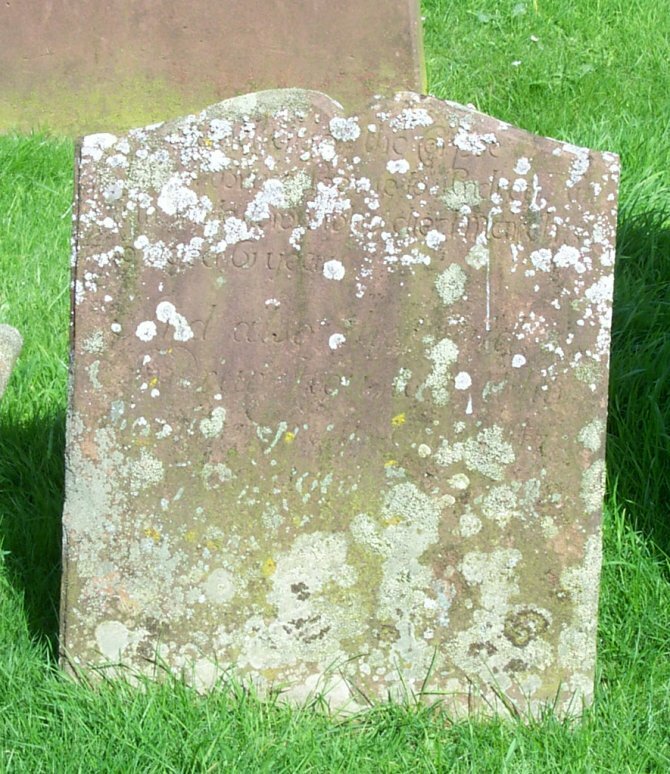 (South) Also Sarah Little, wife of Samuel Campbell, who died at Penpont, 31st Dec’r 1925, aged 79 years. Also Grace Porter, his eldest daughter, who died at Thornhill, 14th October 1933, aged 63 years. 84 (Front) AD 1798. 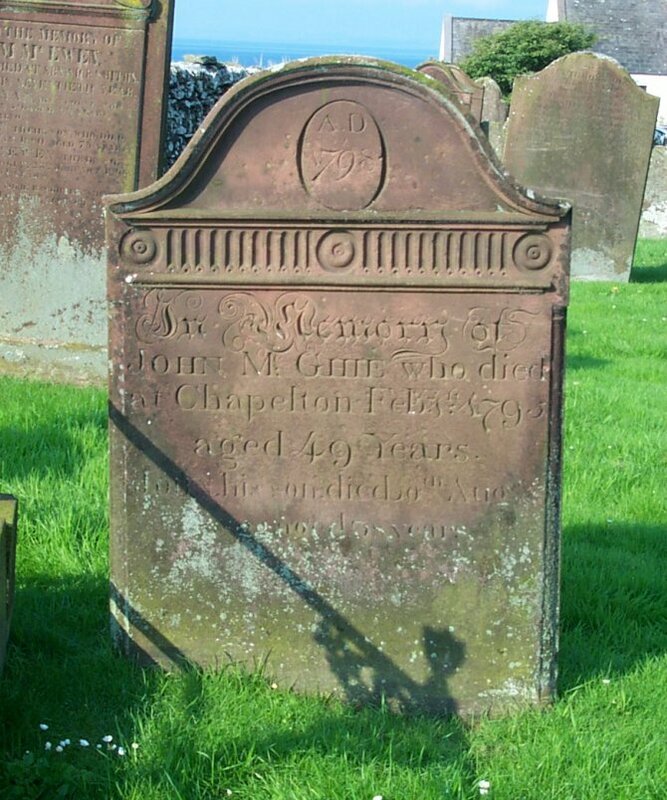 In memory of John McGhie, who died at Chapelton, Feb’y 1st 1795, aged 49 years. John his son, died 30th August 1822, aged 38 years. (Rear) Erected by Mary Cunningham, his relict. 85 Here lyse the corpse of Samuel Gordon, who died July 31st 1783, aged 75 yrs. 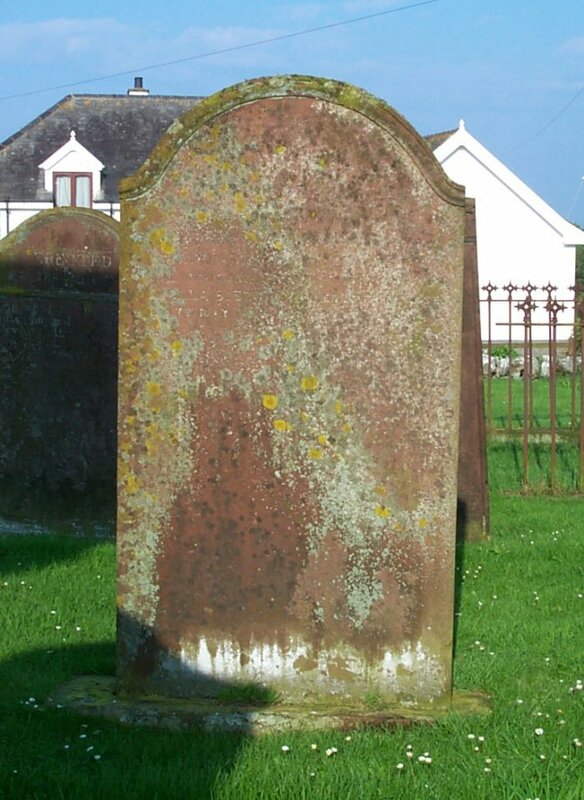 Here lies the corp of Samuel Gordon, junior, who died July 21st 1775, aged 18 years. 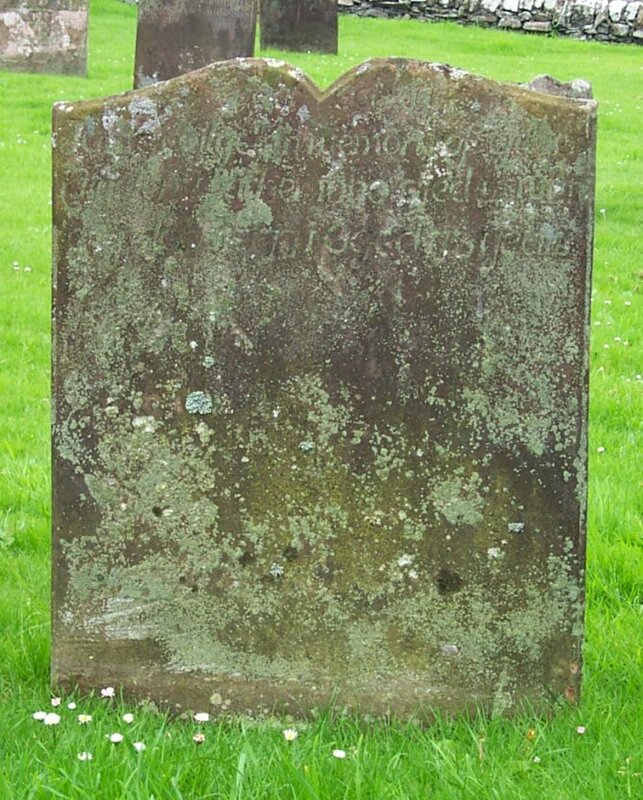 Also the corpse of Margret Jolly, spouse to oldest Sam, who died Feb’y the 3rd 1793, aged 78 years. 86 Erected by David McWhan, in memory of Mary Gordon, his spouse, who died at Coldcroft, 11th Jan’y 1826, aged 60 years. 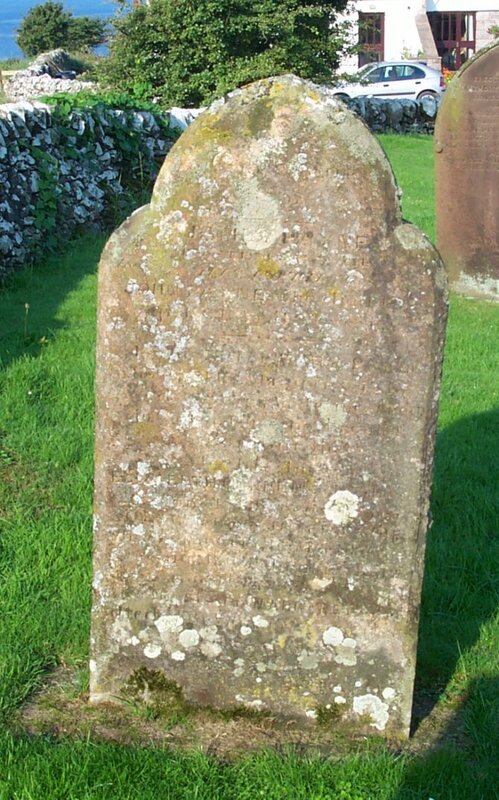 Also James his son who died at Kilrane, Anwoth, 30th Oct. 1828, aged 26 years. Likewise William, his son, who died at Gatehouse, 17th Oct’r 1830, aged 21 years. 87 In memory of Jean Gordon, who died at Gategill, 30th March 1832, aged 84 years. 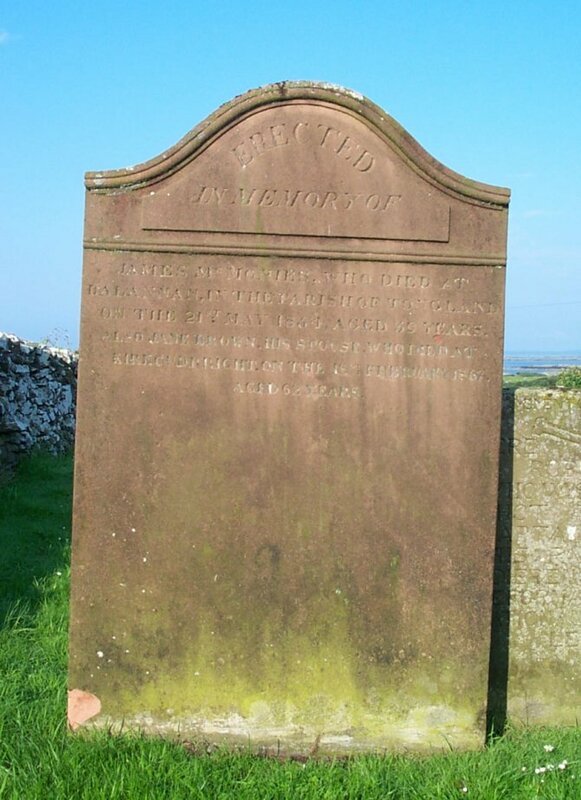 88 Erected by John Sword in memory of his children viz:- Mary, died at Kirkandrews, 19 August 1835, aged 4 years. Annie, died 11 April 1839, aged 4 years. Mary, died 8 March 1853, aged 15 years. Also Mary Brown his wife, who died at Corseyard, 24 July 1877, aged 70 years. Also John Sword, father and husband of the above, who died at Corseyard, 1 Dec 1896, aged 91 years. 89 Erected by Jannet Milroy, in affectionate remembrance of her husband James Sword, who died at Burnyard, Aug 8th 1838, aged 40 years. Praises on tombs are trifles vainly spent, let each good name be its own monument. 90 In memory of Robert Brice and Janet Sword, spouses. 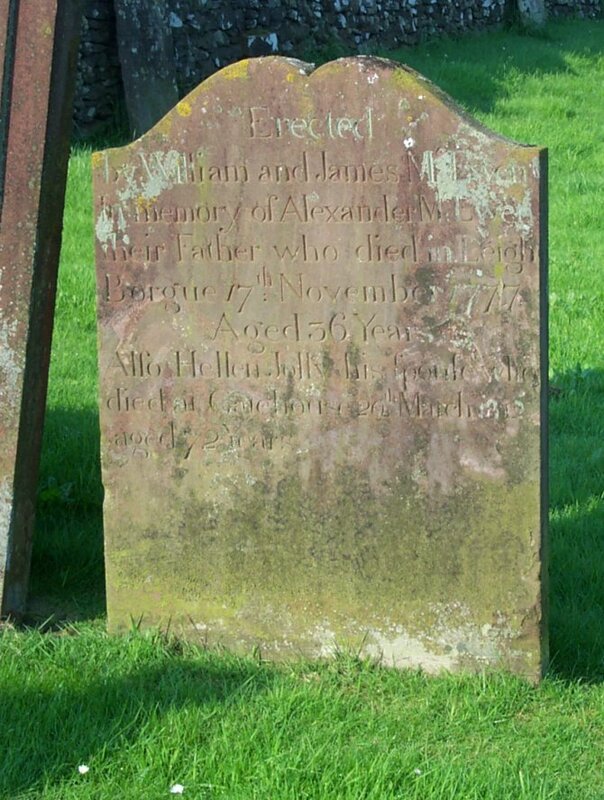 Erected by Helen Brice, there daughter, who died the 12 Sept 1812. 91 Sacred to the memory of George Grearson, who died at Highpark, Crossmicheal, on the 15th of Feb’y 1813, aged 74 years. 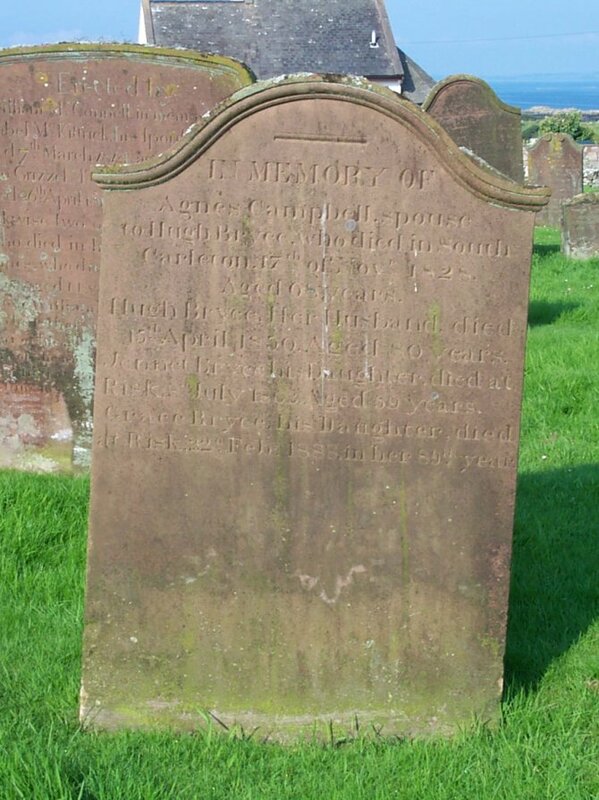 Agnes Campbell, his spouse, who died the 2nd of Feb 1816, aged 72 years. 92 Here lyes the corpse of Robert Grier, who died 1776 aged 72. Also John and Samuel Griers, children to George Grier and Agnes Campbel. And also the corp of Isobel Grier, their daughter, who died Spt’r 28th 1786, aged 18 years. Marion Grier, his dau., aged 3 years. 93 Erected by Jannet Porter, in memory of James Jolly, her husband, who died in Boreland of Borgue, Oct’r 9th 1778, aged 38 years. 93a (Top missing) 1780, aged 80 years. 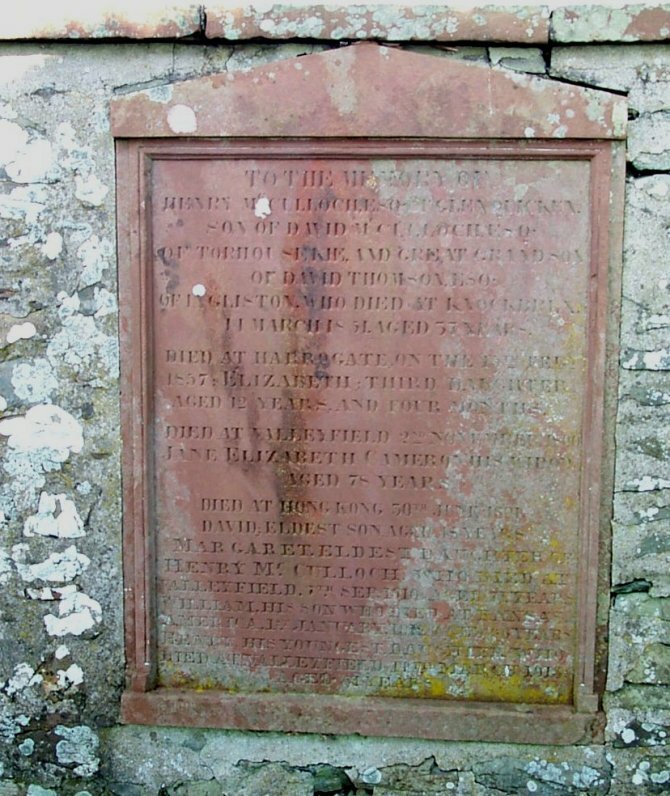 Erected by Barbara Jolly, his widow who also died at Muckle Carleton, 13th Feb’y 1805, aged 87 years. 94 Erected by David Houston & Marg’t Gordon, in memory of their son Samuel, who died at Loch Roy, 31st May 1849, aged 19 years. 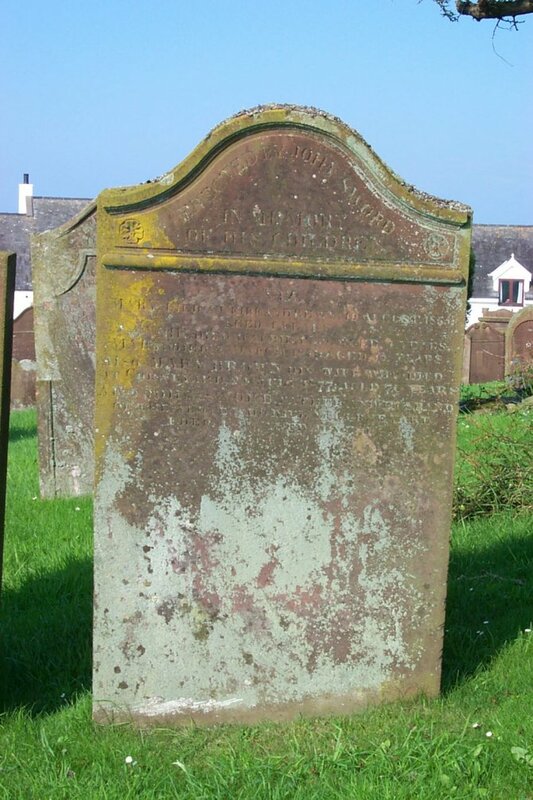 Also the above Margaret Gordon, who died at McBort, Isle of Lewis, on the 21st November 1851, aged 64 years. 96 In memory of Robert Dickson, born at Margrie, XVIII April MDCCXC, died at Chapelton Village, XII Jan MDCCCLXIII. 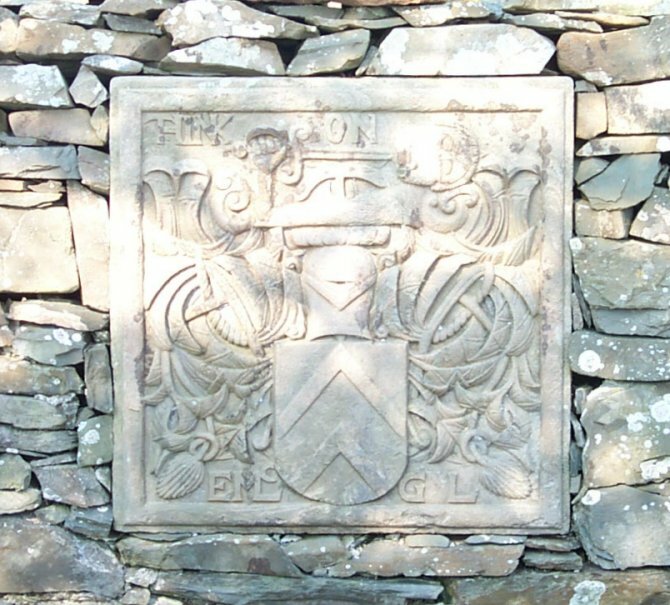 Also Mary McQuhae, his wife, born at Lodge of Kelton, VII September MDCCCVIII, died at Chapelton Village, XIX February MDCCCLXXV. Janet, their eldest daughter, died at Leith, XXV Nov MDCCCXCII. John, their eldest son, died at Blackwater, New Zealand, V Sept MDCCCXCIV. Margaret, their youngest daughter, died XI Aug. MDCCCCXXIII. 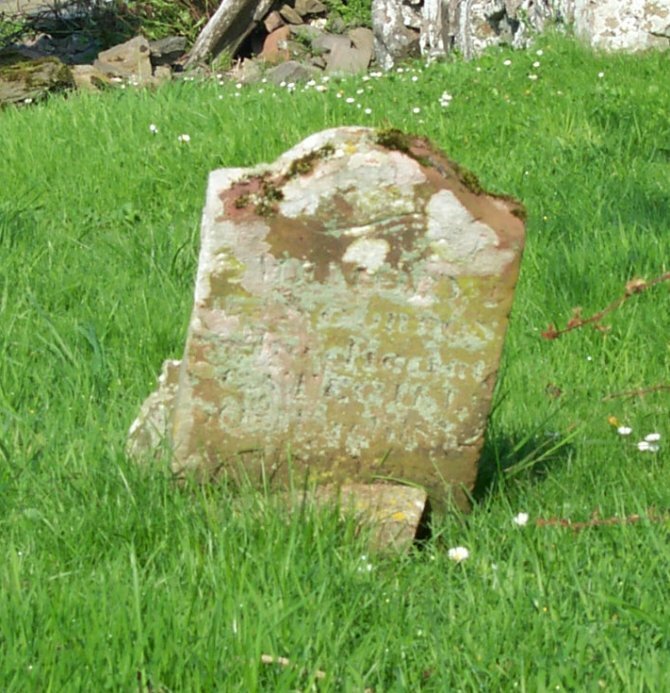 Jane, their daughter, died at Doon Cottage, Twynholm Parish, 21st February 1935, aged 88 years. 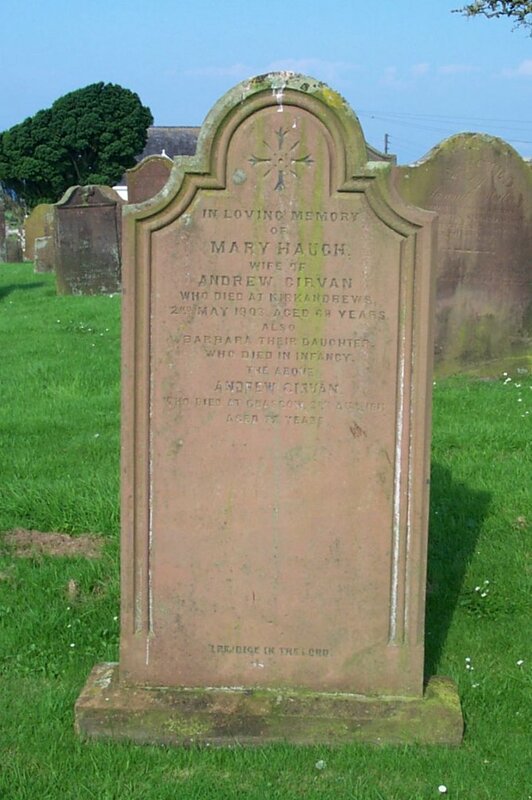 97 In loving memory of Mary Haugh, wife of Andrew Girvan, who died at Kirkandrews, 2nd May 1903, aged 68 years. Also Barbara their daughter, who died in infancy. The above Andrew Girvan, died at Glasgow, 3rd Aug 1911, aged 77 years. “I rejoice in the Lord”. 98 Sacred to the memory of James Turnbull, who died 16th September 1860, aged 24 years. 99 Erected by John Turnbull, in memory of his father, John Turnbull, who died at Minto Cottage, 24th Jan 1863, aged 68 years. Also Janet Sword, his mother, who died 21st April 1876, aged 81 years. And their daughter Margaret Turnbull, who died at Minto Cottage, 26th December 1894, aged 71 years. And the said John Turnbull, who died at Minto Cottage, 20th May 1895, aged 57 years. 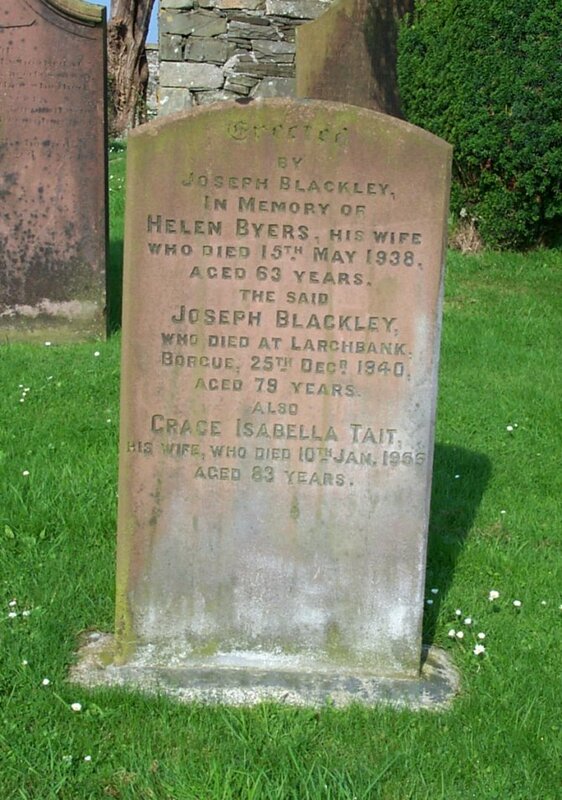 100 Erected by Joseph Blackley in memory of Helen Byres, his wife, who died 15th May 1938, aged 63 years. The said Joseph Blackley, who died at Larchbank, Borgue, 25th Dec’r 1940, aged 79 years. Also Grace Isabella Tait, his wife, who died 10th Jan. 1955, aged 83 years. 101 In loving memory of George Black, who died at Conchieton Cottage, 13th August 1901, aged 44 years. 102 Erected by William Blackley, in memory of Isabella McMinn, his wife, who died 27th Jan 1870, aged 48 years. Elizabeth their daughter, died 9th Nov. 1865, aged 22 years. Margaret, their daughter, died 31st Dec 1868, aged 18 years. Henry, their son, died 17th April 1875, aged 9 years. Elizabeth Jane, his daughter, died 12th April 1875, aged 2 years. 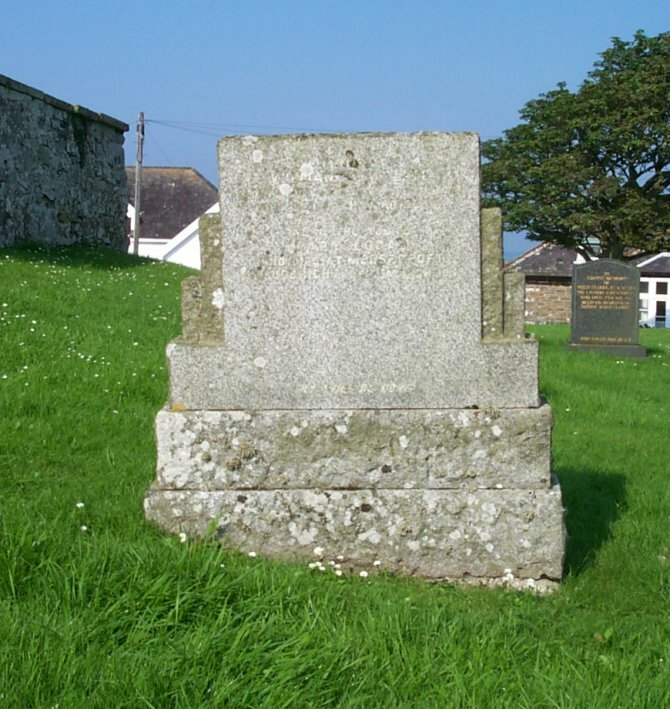 The said William Blackley, died at Kirkandrews, 25th February 1891, aged 72 years. Also Jane McTeare, wife of the above William Blackley, who died at Borgue Village, 2nd April 1924, in her 83rd year. Also Barbara M. McCaig, grand-daughter of the above, who died in infancy. 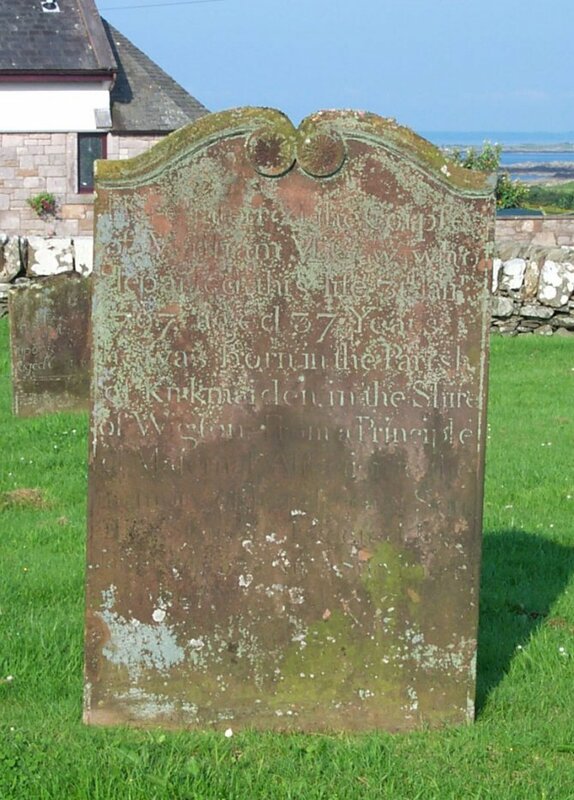 103 In memory of John McKie, who died at Kirkandrews, 14th September 1867, aged 61 years. 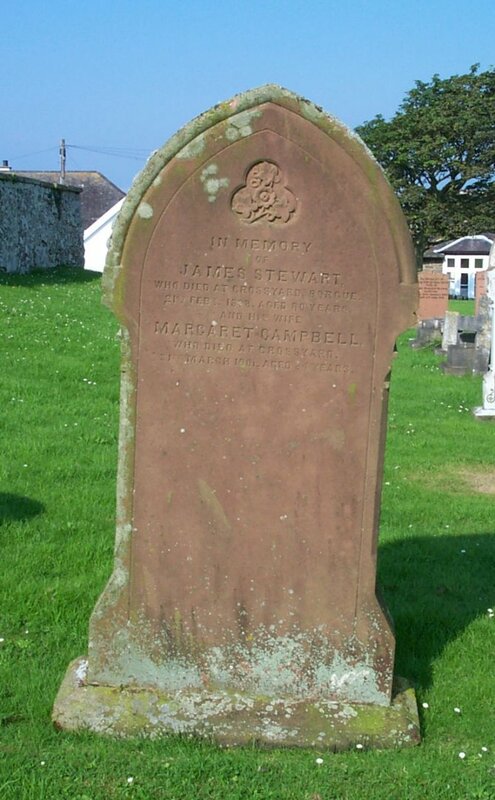 Isabella Maxwell, wife of the above, died at Kirkandrews, 10th Jan 1900, aged 84 years. Also Isabella, grand-daughter, aged 23 years. Also Agnes their daughter, who died at Carleton Croft, Borgue, 9th Jan 1916, aged 84 years. Also William, their son, who died at Cornland, Illinois, U.S.A. on 7th Feb 1911, aged 63 years. 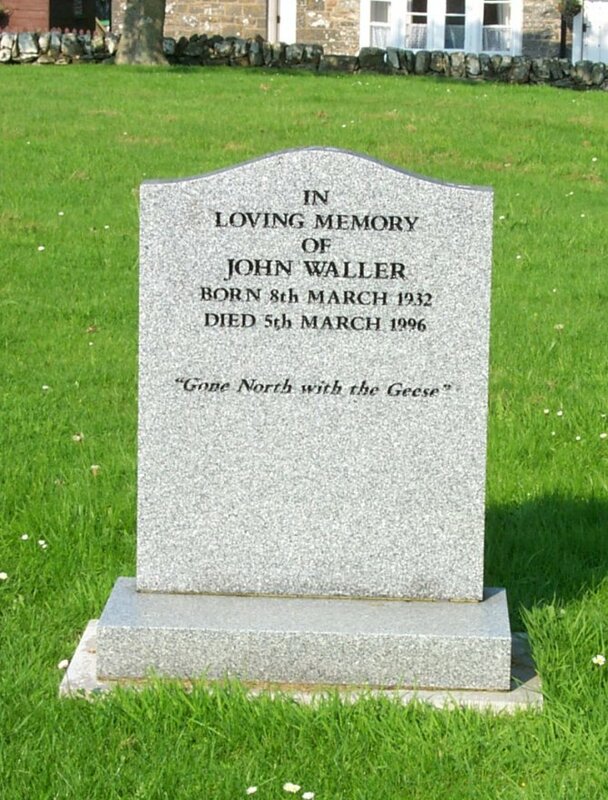 Also John their grandson, aged 47 years. 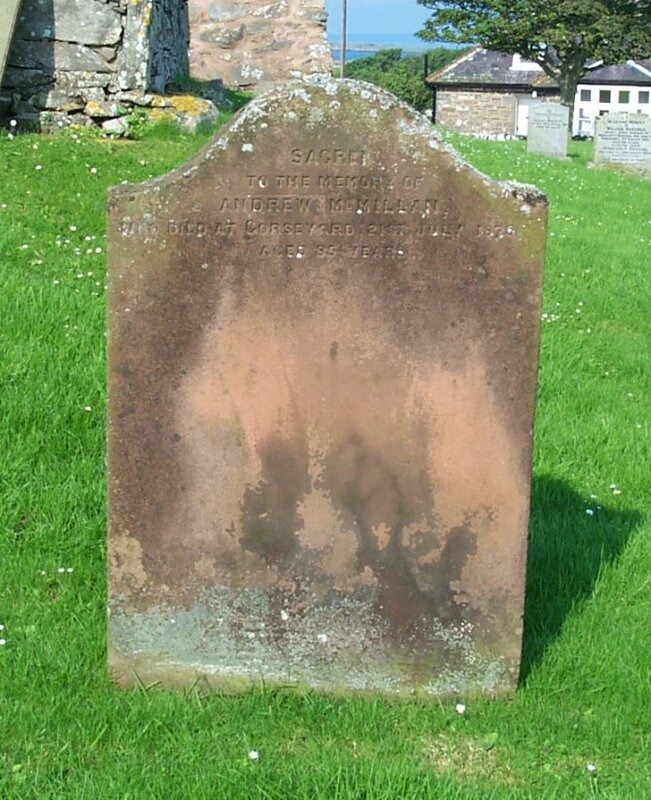 Also Elizabeth their daughter, who died at Kempleton Cottage, Twynholm, 22nd Jan 1931, aged 90. Erected by his family. 104 Sacred to the memory of Andrew McMillan, who died at Corseyard, 21st July 1875, aged 85 years. 105 In memory of Margaret McGill, wife of Robert Douglas, who died at Barlocco, 6th July 1872, aged 80 years. Catherine their daughter, died at Dudley, 1832 aged 2 years. Also the above Robert Douglas, who died at Barlocco, 10th March 1882, aged 87 years. 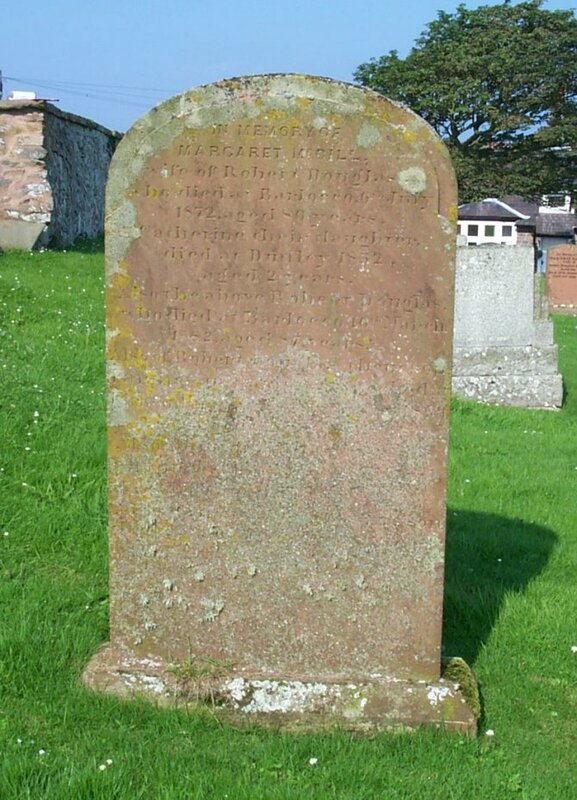 Also of Robert Douglas, their son, farmer in Barlocco, who died at Kirkcudbright, 13th January 1899, aged 62 years. Also Mary Halliday his wife, who died at Barlocco, 28th March 1905, aged 71 years. Also Samuel Douglas, his son, died 4th Nov 1916, aged 88 years. 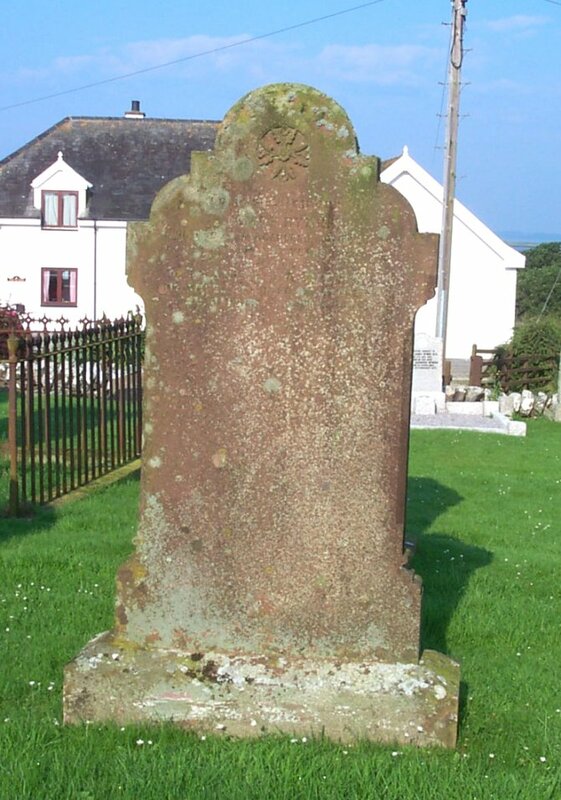 106 In memory of James Stewart, who died at Crossyard, Borgue, 21st Feb. 1898, aged 80 years. 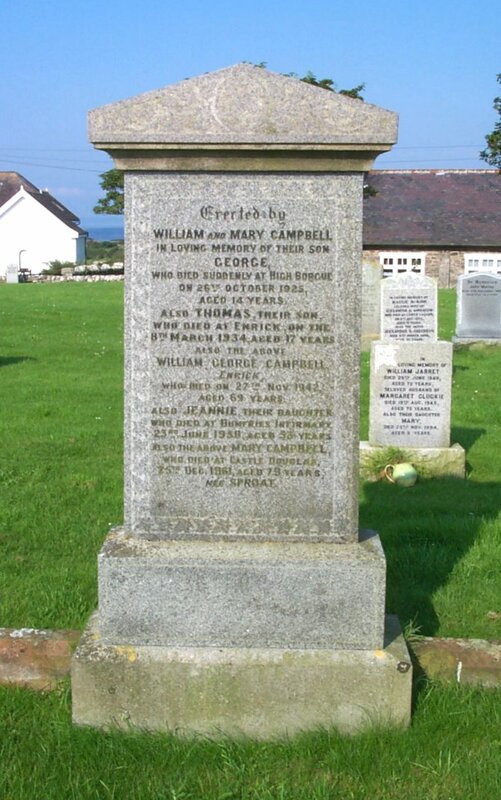 And his wife Margaret Campbell, who died at Crossyard, 31st March 1901, aged 84 years. 107 Sacred to the memory of Thomas Palmer, who died at Kirkandrews, 19th Feb. 1900, aged 61 years. 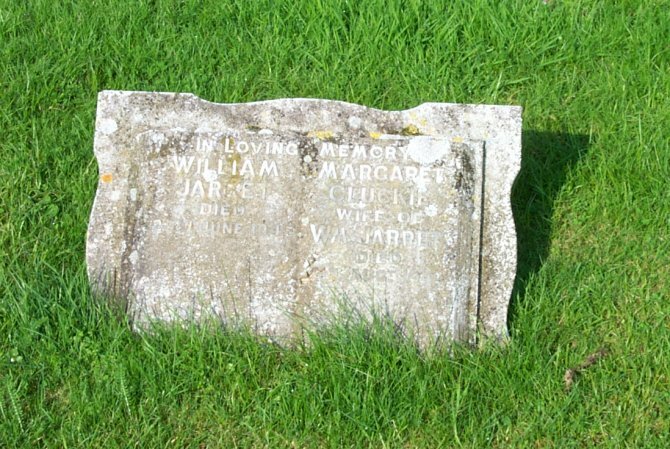 Also Margaret Stewart, wife of the above who died at Kirkandrews 19th June 1927, in her 86th year. 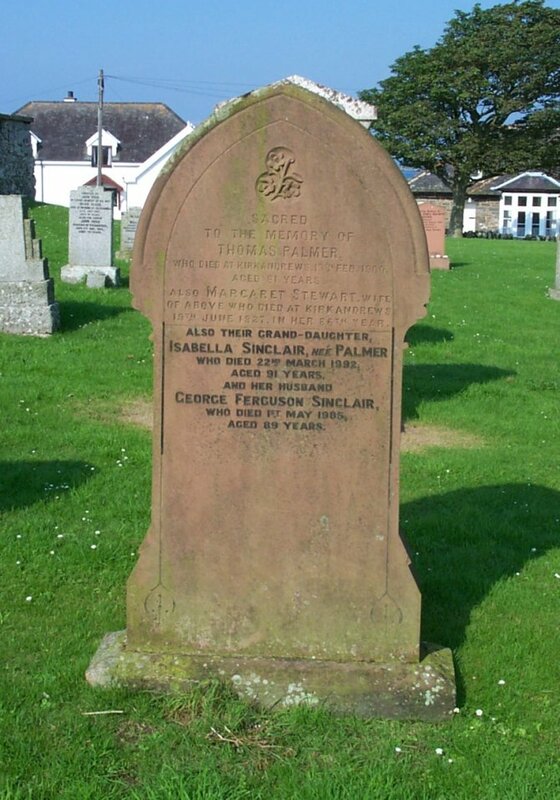 Also their grand-daughter Isabella Sinclair, nee Palmer, who died 22nd March 1992, aged 91 years. And her husband George Ferguson Sinclair, who died 1st May 1985, aged 89 years. 108 In loving memory of Robert, son of Robert Stewart, who died at Cornbroe Mains, Bellshill, 9th June 1901, aged 18 years. Also Margaret Corrie, wife of Robert Stewart, who died at Whitehill, Borgue, 30th July 1911, aged 67 years. Also the above Robert Stewart, who died at Kirkandrews, on 15th March 1935, aged 88 years. 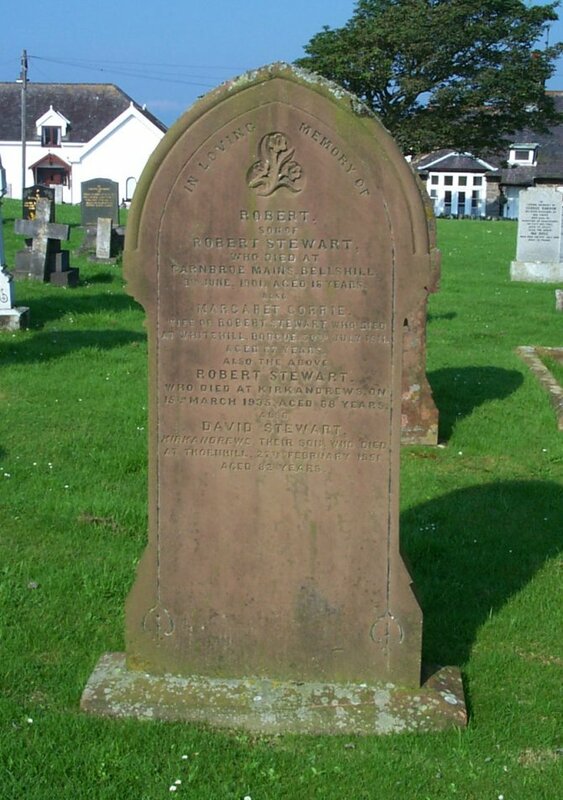 Also David Stewart, Kirkandrews, their son, who died at Thornhill, 27th February 1951, aged 82 years. 109 In loving memory of Susan, the beloved wife of William Milroy, who died at Carrick, 17th March 1908, aged 67 years. Also the above William Milroy, who died at Grand Forks, British Columbia, 14th May 1909, aged 73 years. Also John Milroy, their youngest son, killed in action at Highwood, France, 15th July 1916. 111 In loving memory of Joseph Jarret, died 27th Dec. 1956, aged 52 years, beloved husband of Agnes Glendinning, died 21st Dec. 1981, aged 67 years. 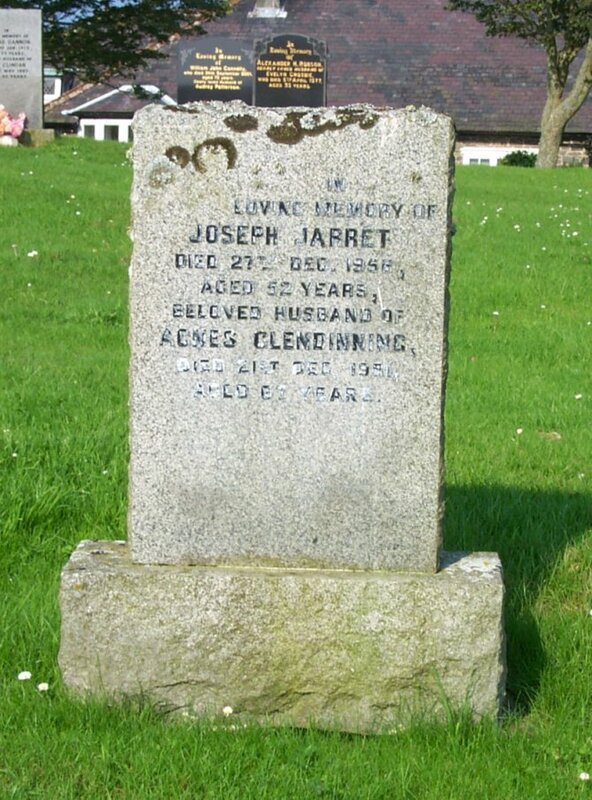 112 In loving memory of Joseph Jarret, died 27th December 1937. Mary Gillespie, wife of Joseph Jarret, died 7th March 1937. 113 In loving memory of Alexander M Beaton, beloved husband of Margaret Beaton, who died at Viewfield, 12th January 1921, aged 75 years. Also Margaret Kirk, widow of the above, who died at Valleyfield, 9th October 1929, aged 73 years. 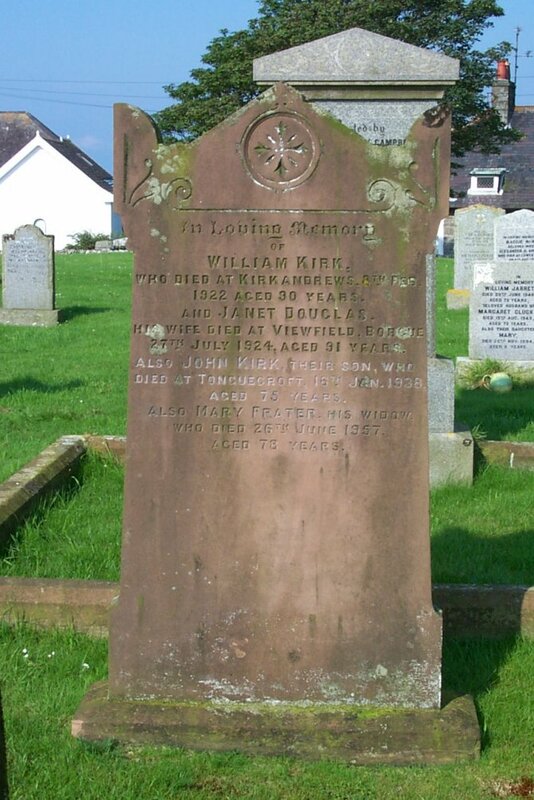 114 In loving memory of William Kirk, who died at Kirkandrews, 8th Feb. 1922, aged 90 years. And Janet Douglas, his wife, who died at Viewfield. Borgue, 27th July 1924, aged 91 years. Also John Kirk, their son, who died at Tonguecroft, 16th Jan. 1938, aged 75 years. Also Mary Frater, his widow, who died 26th June 1957, aged 78 years. 115 In affectionate remembrance of Agnes Tannock McCall, wife of Robert Douglas, who died at the McAlpin Nursing Home, Glasgow, 23rd August 1909, aged 38 years. 116 In remembrance of James Gordon, who died at Chapelton Row, 25th Nov. 1906, aged 68 years. Also Mary McMichael, his wife, who died 12th Nov. 1911, aged 70 years. 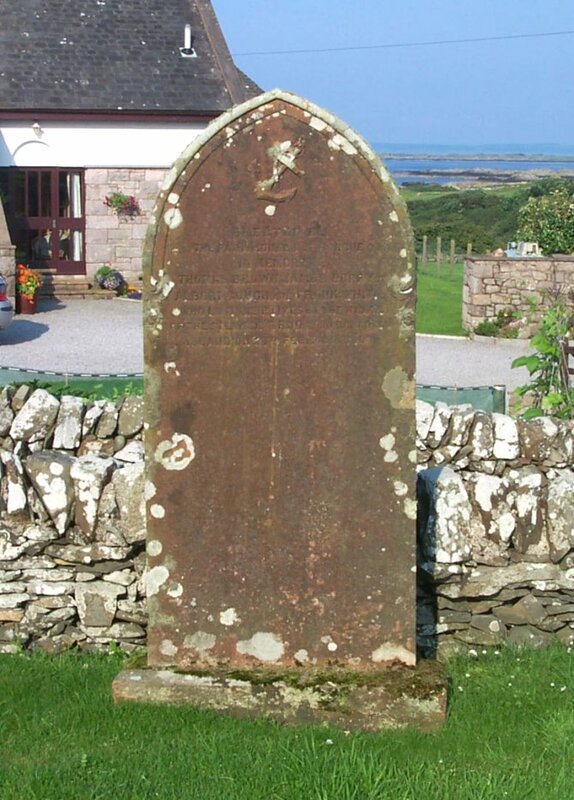 Jane, their daughter, who died at Kirkgunzeon, 5th January, 1927, aged 60 years. James McMichael, their son, who died at Kirkgunzeon, 16th May 1941, in his 67th year. 117 In loving memory of William R Walker, beloved husband of Mary Logan, who died at Ivy Cottage, 13th May 1947. 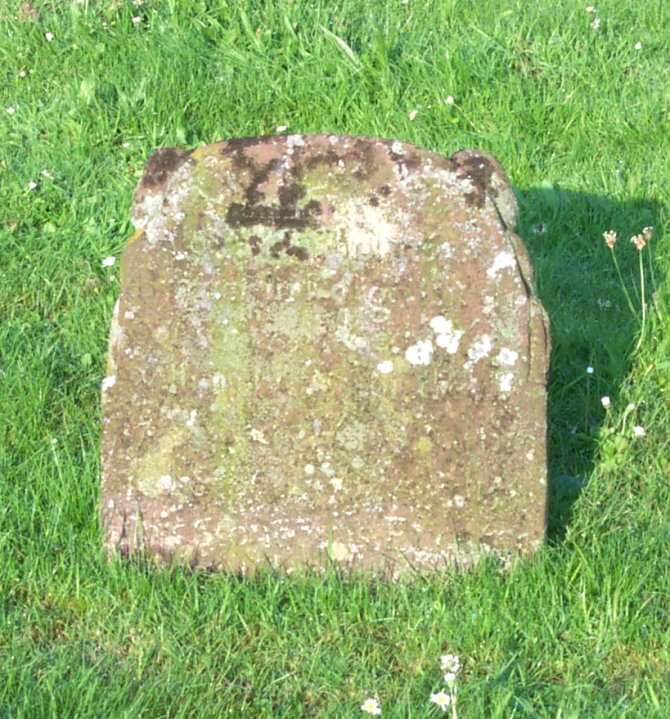 Also the above Mary Logan, who died at Mersecroft, Kirkcudbright, 25th March 1958. Thy will be done. 118 In loving memory of Margaret McDowall, beloved daughter of James and Flora Logan, and wife of Herbert Wignall, who died at Roberton, Borgue, 29th Jan. 1922, aged 35 years. Also the above James Logan, farmer, Roberton, who died 5th February 1927, aged 75 years. Also Jean, his daughter, who died at Roberton, 15th February 1927, aged 34 years. Also the above Flora Logan, who died 16th Dec’r 1941, aged 79 years. 119 In loving memory of Robert Handly, who died 9th October 1924, aged 88 years. Also Mary Gass, his wife, who died 5th August 1923, aged 88 years. 120 Erected by William and Mary Campbell, in loving memory of their son George, who died suddenly at High Borgue, on 26th October 1925, aged 14 years. Also Thomas, their son, who died at Enrick on 8th March 1934, aged 17 years. Also the above William George Campbell, Enrick, who died on 27th Nov. 1942, aged 69 years. Also Jeannie, their daughter, who died at Dumfries Infirmary, 23rd June 1958, aged 53 years. Also the above Mary Campbell, who died at Castle Douglas, 25th Dec. 1961, aged 79 years, nee Sproat. 121 Erected by John Hogg, in loving memory of his wife Helen Clark, died at Brigend of Kildarroch, 23rd July 1952, aged 61 years. 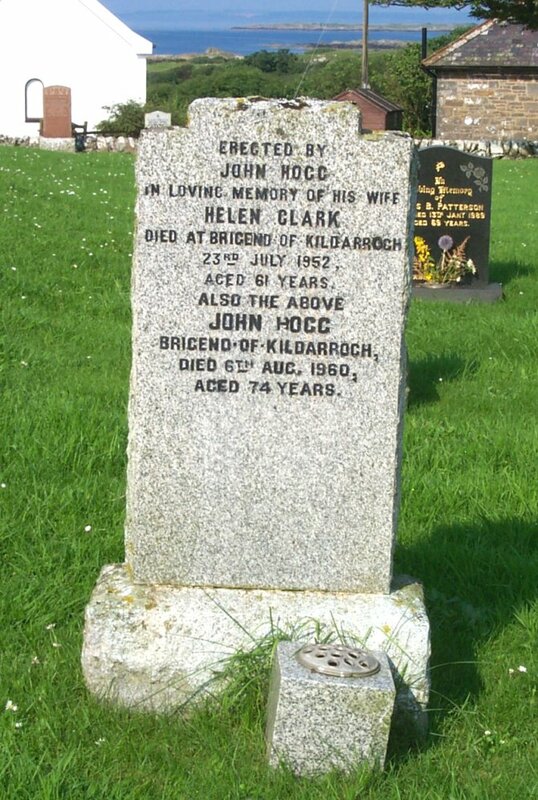 Also the above John Hogg, Brigend of Kildarroch, died 6th Aug. 1960, aged 74 years. 122 My Jesus mercy. 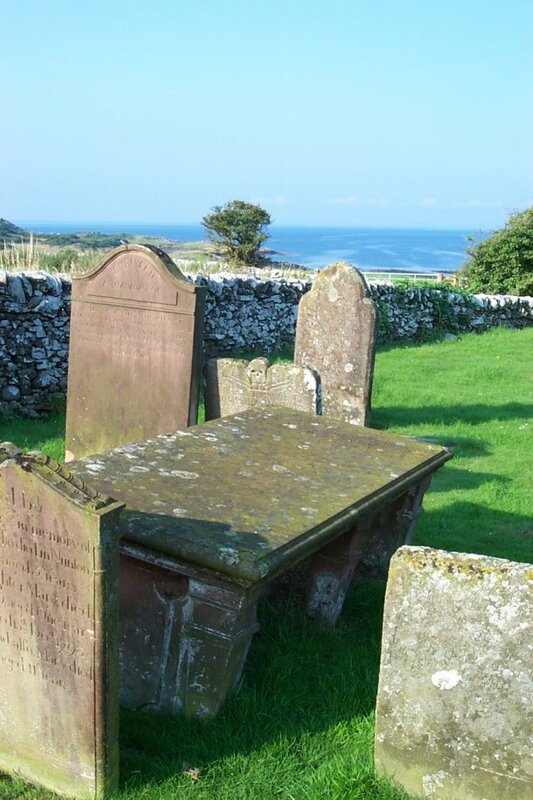 Of your charity, pray for the soul of James Crossan, who died at Kirkandrews, 5th November 1928, aged 67 years. Mary, his wife, who died 27th Feb. 1952, aged 90 years. 123 In loving memory of William Jarret, died 29 June 1949. Margaret Cluckie, wife of Wm. Jarret, died 19 Aug 1949. 124 In loving memory of William Jarret, died 29th June 1949, aged 72 years. 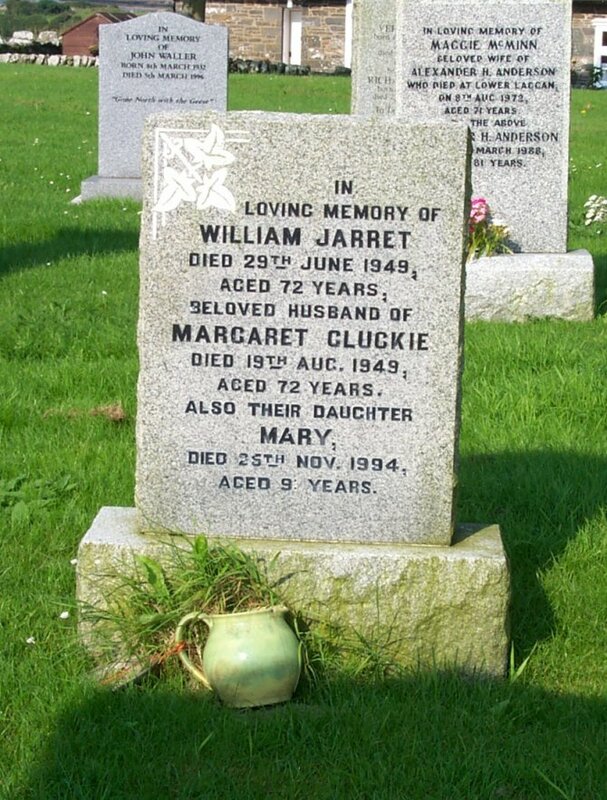 Beloved husband of Margaret Cluckie, died 19th Aug. 1949, aged 72 years. Also their daughter Mary, died 25th Nov 1994, aged 9- years. 125 In loving memory of Hugh Jarret, died 16th July 1963, aged 54 years. Beloved husband of Elizabeth Gouldie, died 3rd March 1988, aged 75 years. 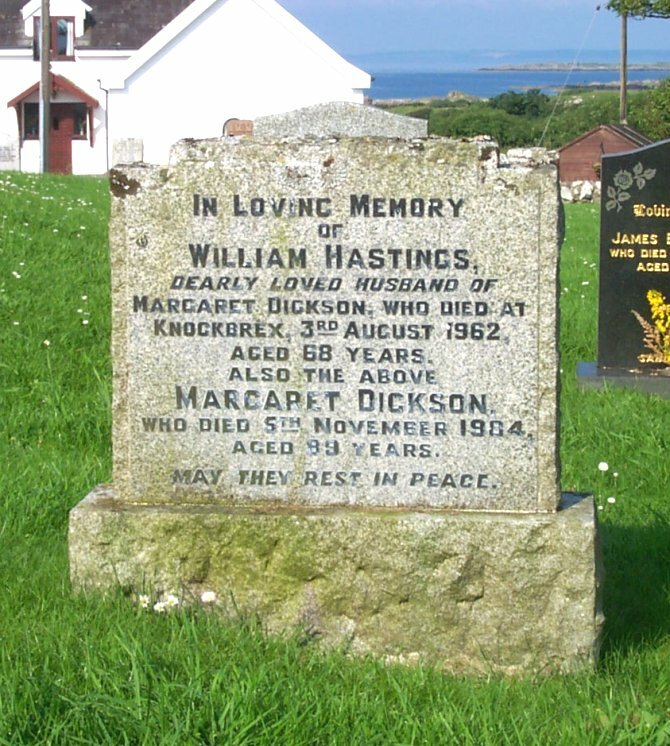 126 In loving memory of William Hastings, dearly loved husband of Margaret Dickson, who died at Knockbrex, 3rd August 1962, aged 68 years. Also the above Margaret Dickson, who died 5th November 1984, aged 89 years. May they rest in peace. 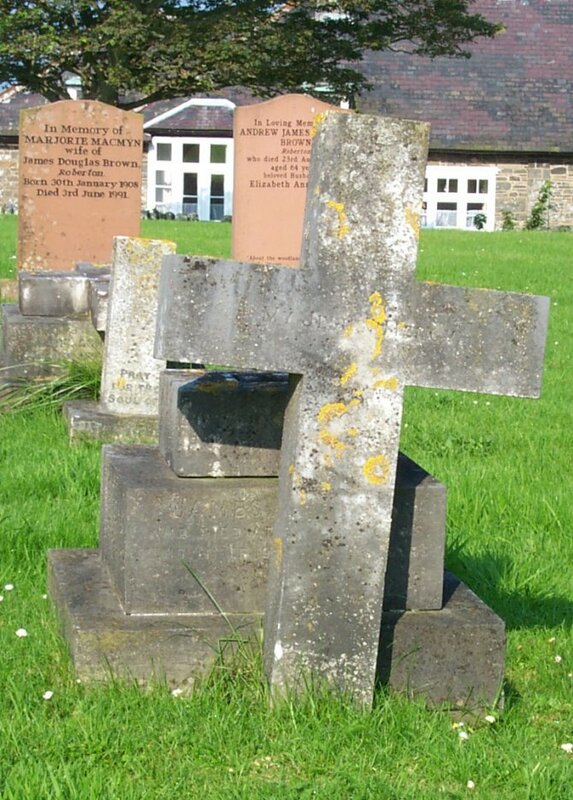 127 Pray for the soul of Patrick Trainer, who died at Ashton, Castle Douglas, 6th May 1954. And of his beloved wife Mary Agnes Quinn, who died 25th January 1962. 129 In loving memory of George Robson, beloved husband of Ina Hogg, who died at Brigend of Kildarroch, on 24th Dec. 1963, aged 47 years. 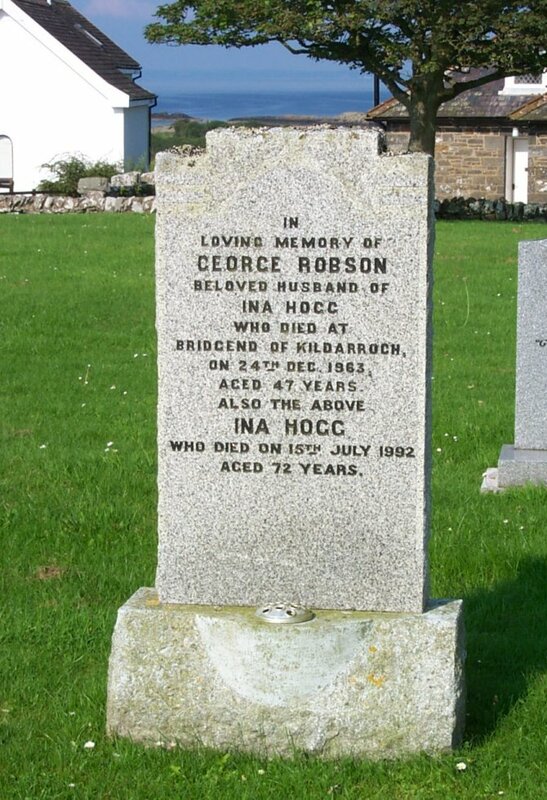 Also the above Ina Hogg, who died on 15th July 1992, aged 72 years. 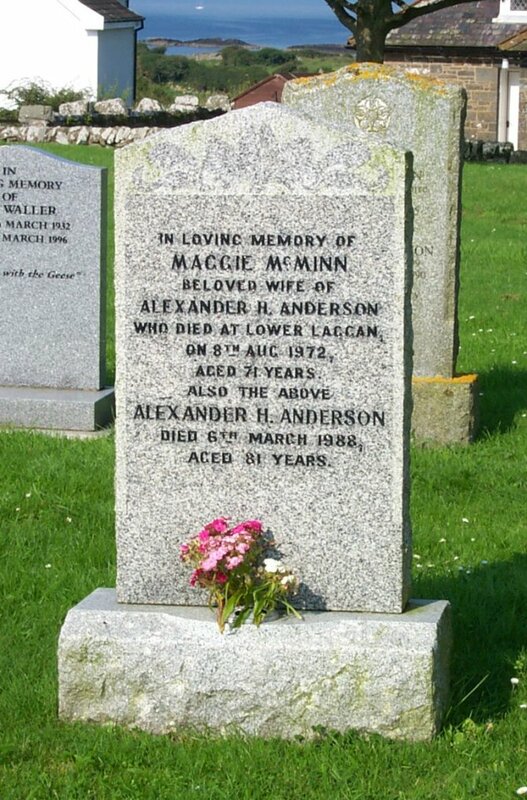 130 In loving memory of Maggie McMinn, beloved wife of Alexander H. Anderson, who died at Lower Laggan on 8th Aug. 1972, aged 71 years. Also the above Alexander H. Anderson, died 6th March 1988, aged 81 years. 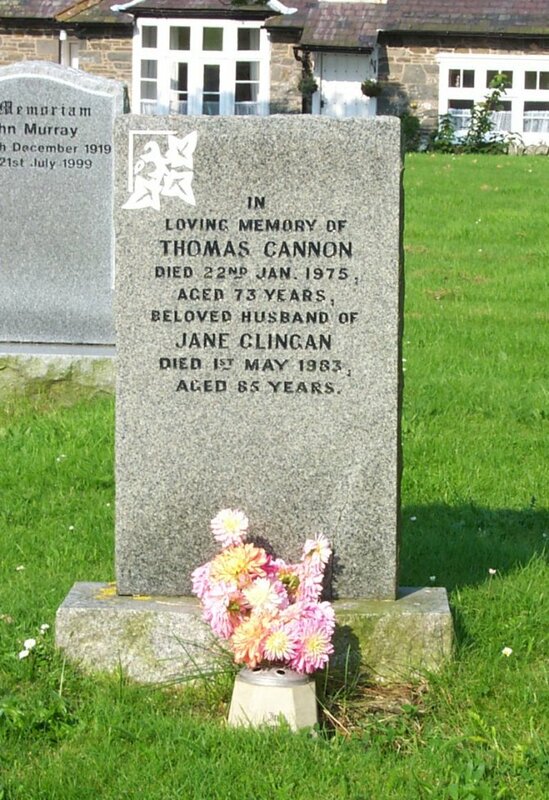 131 In loving memory of Thomas Cannon, died 22nd Jan. 1975, aged 73 years. Beloved husband of Jane Clingan, died 1st May 1983, aged 85 years. 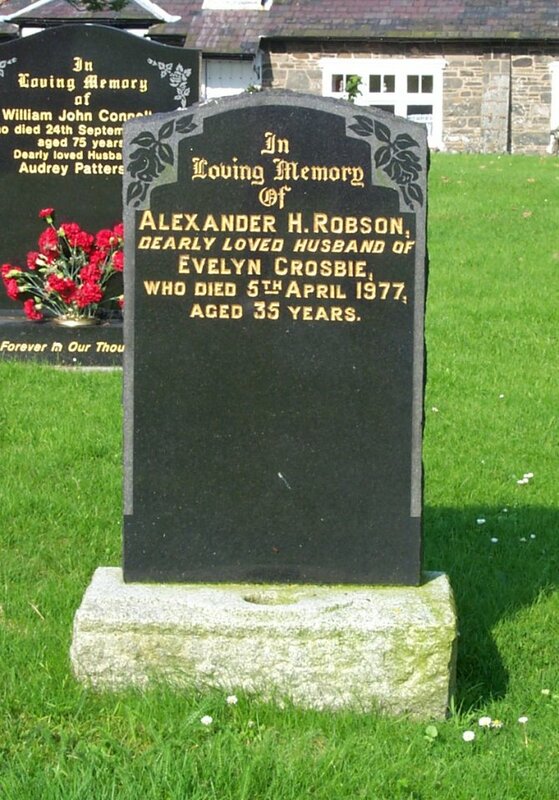 132 In loving memory of Alexander H. Robson, dearly loved husband of Evelyn Crosbie, who died 5th April 1977, aged 35 years. 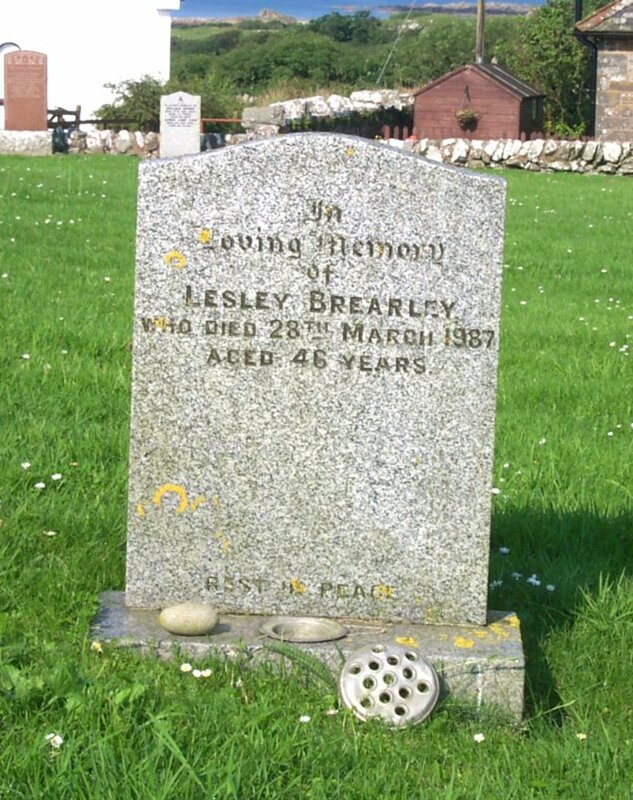 133 In loving memory of Lesley Brearley, who died 28th March 1987, aged 46 years. Rest in peace. 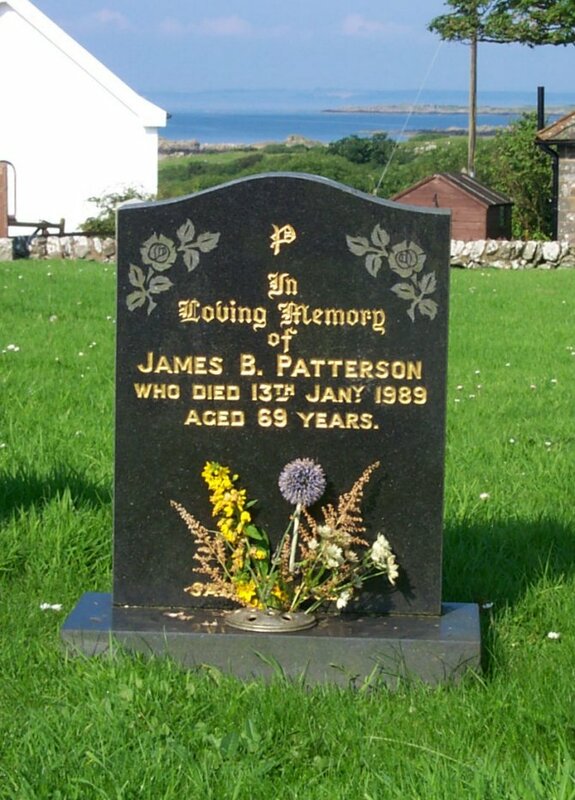 134 In loving memory of James B. Patterson, who died 13th Jan’y 1989 aged 69 years. 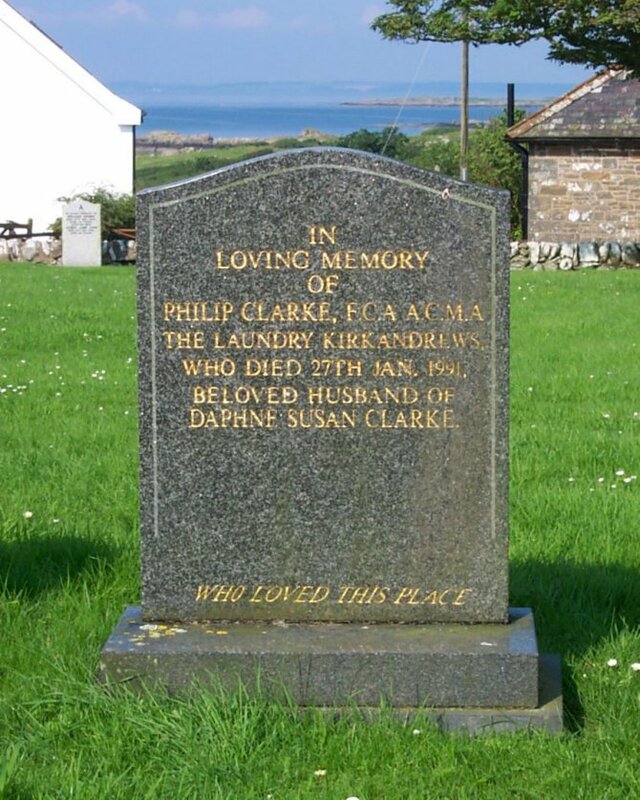 135 In loving memory of Philip Clarke, F.C.A., A.C.M.A., The Laundry, Kirkandrews, who died 27th Jan. 1991, beloved husband of Daphne Susan Clarke. Who loved this place. 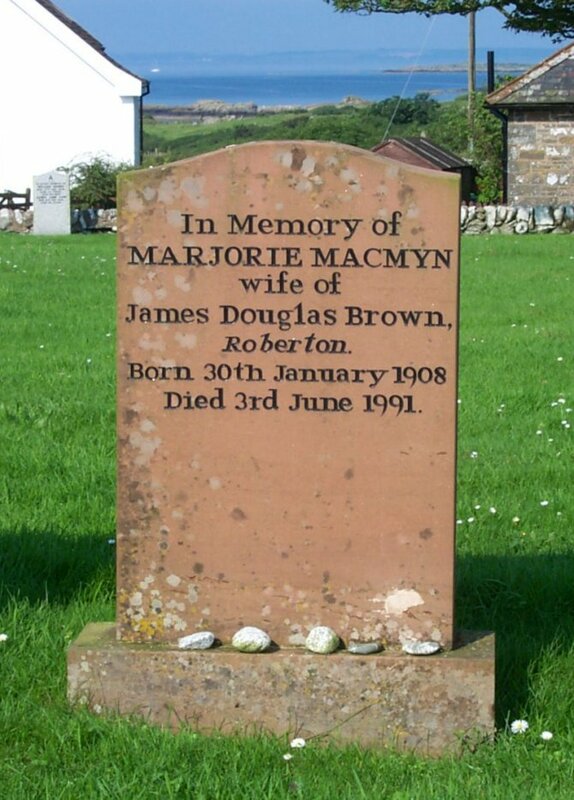 136 In memory of Marjorie MacMyn, wife of James Douglas Brown, Roberton, born 30th January 1908, died 3rd June 1991. 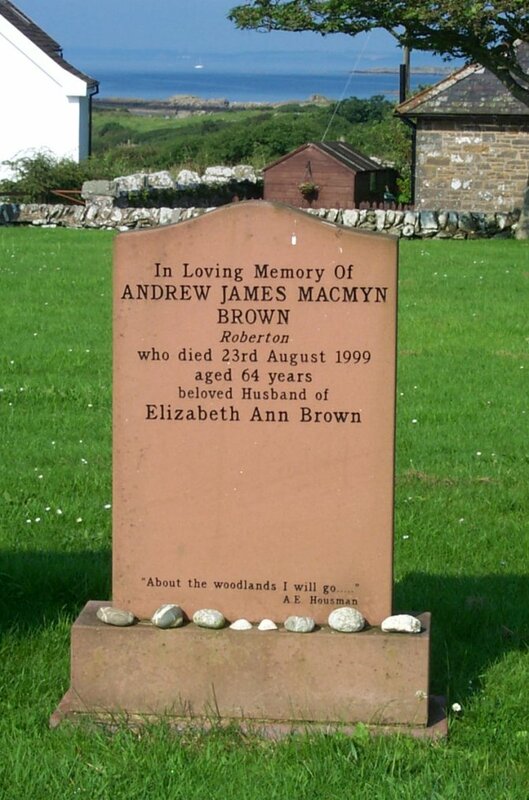 137 In loving memory of Andrew James MacMyn Brown, Roberton, who died 23rd August 1999, aged 64 years, beloved husband of Elizabeth Ann Brown. “About the woodland I will go…” A.E. Housman. 140 In memoriam. 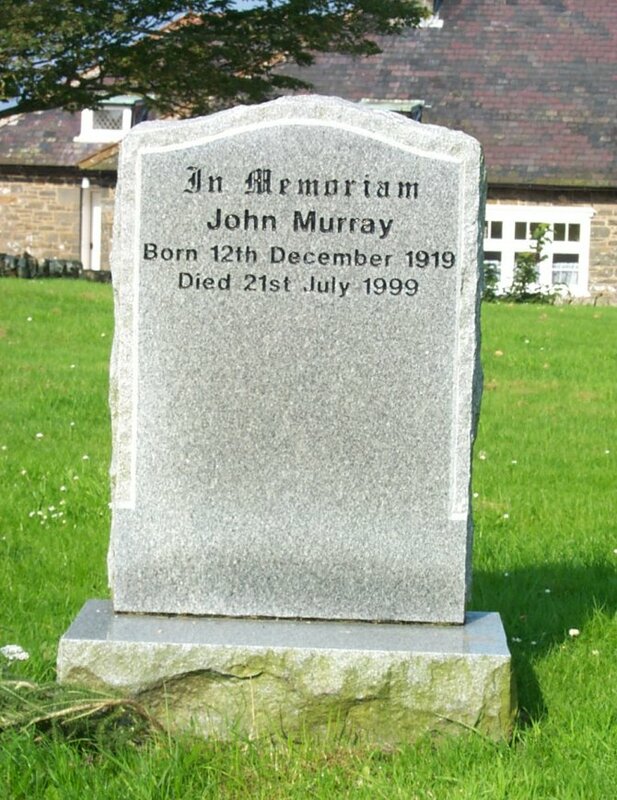 John Murray, born 12th December 1919, died 21st July 1999. 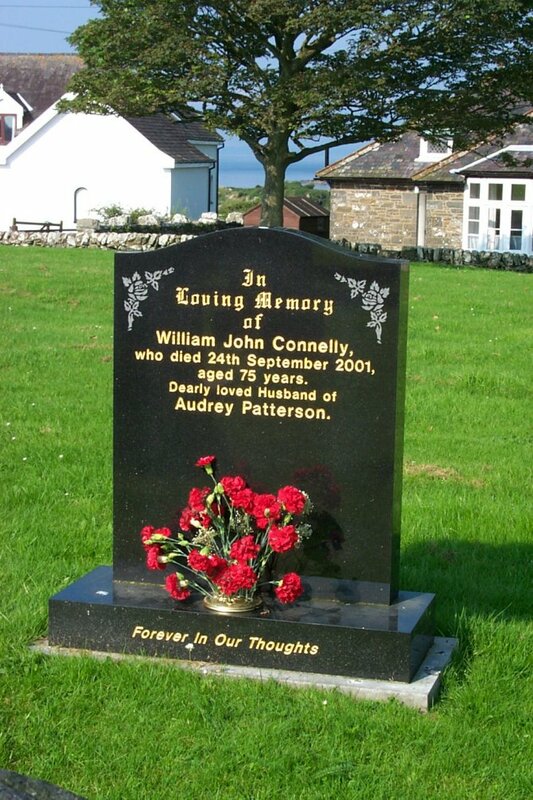 141 In loving memory of William John Connelly, who died 24th September 2001, aged 75 years, dearly loved husband of Audrey Patterson. Forever in our thoughts.